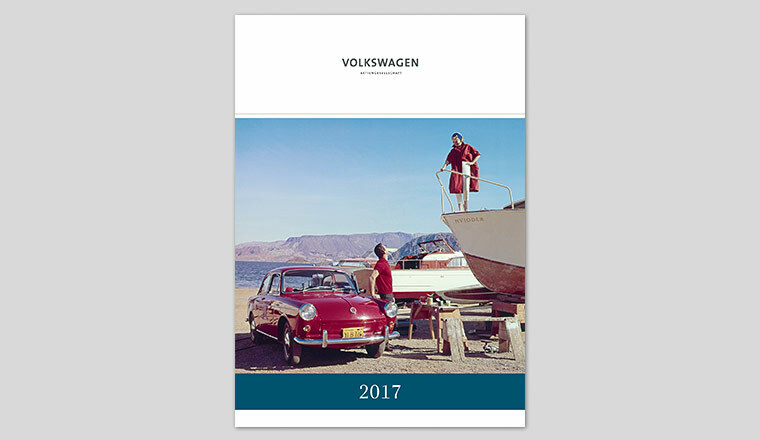 2016 was an eventful year for the AutoMuseum Volkswagen. Read up on what happened. T3 cutaway model at the RC Bavaria. 9 December 2016. 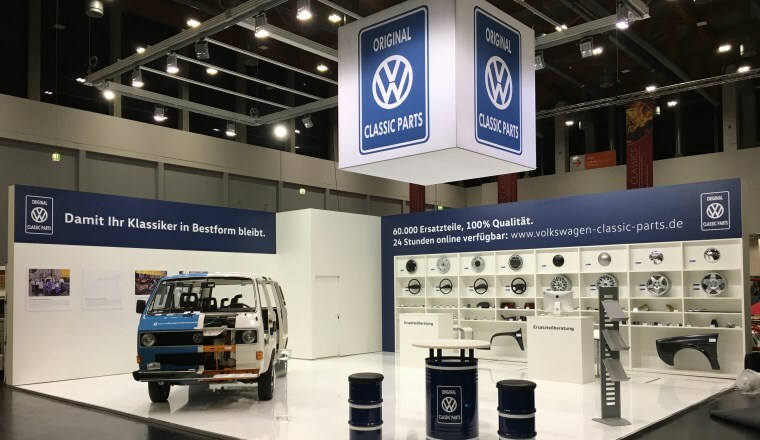 The AutoMuseum Volkswagen Foundation is represented at various events – including the new classic car show at the exhibition centre in Nuremberg. A total of 350 exhibitors (vintage dealers, repairers, parts dealers, testing companies, insurers, etc.) were present in four exhibition halls covering 35,000 square metres in all. 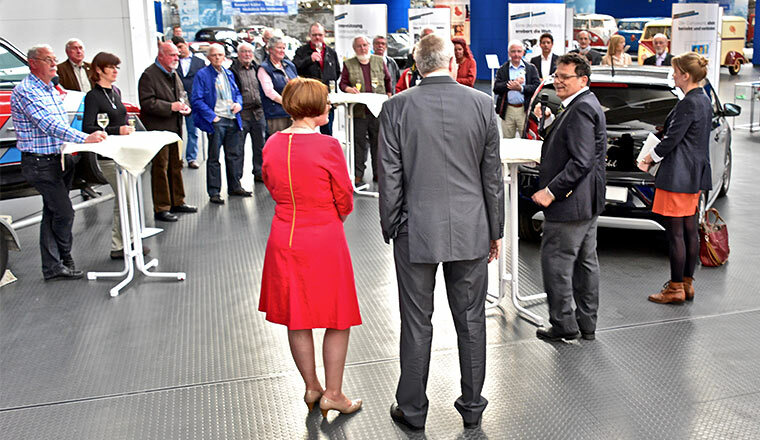 Some 26,544 visitors were counted on the three days of the car show – 90 per cent from Bavaria. 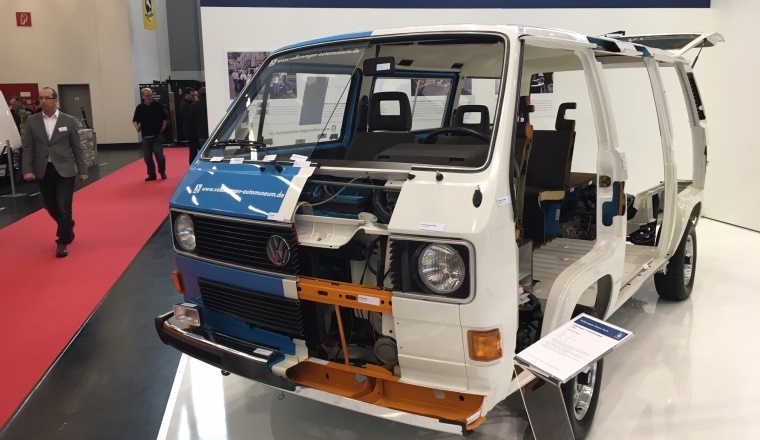 The T3 cutaway model belonging to the AutoMuseum was on display at the Volkswagen Classic Parts stand, encouraging visitors to come and see more in Wolfsburg. 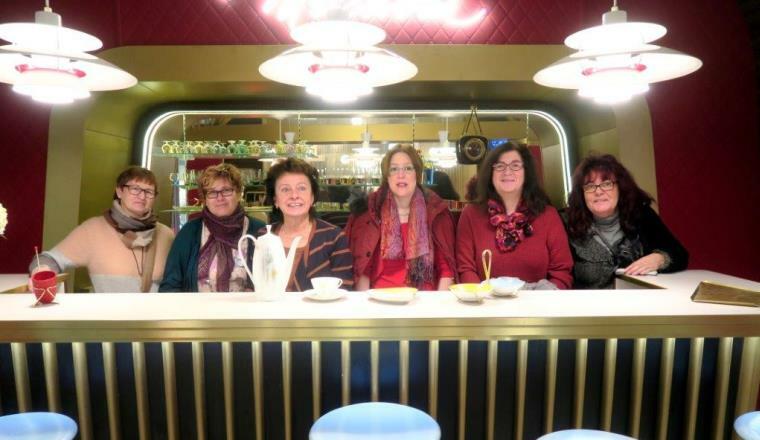 Museum team's educational trip to Einbeck. 5 December 2016. 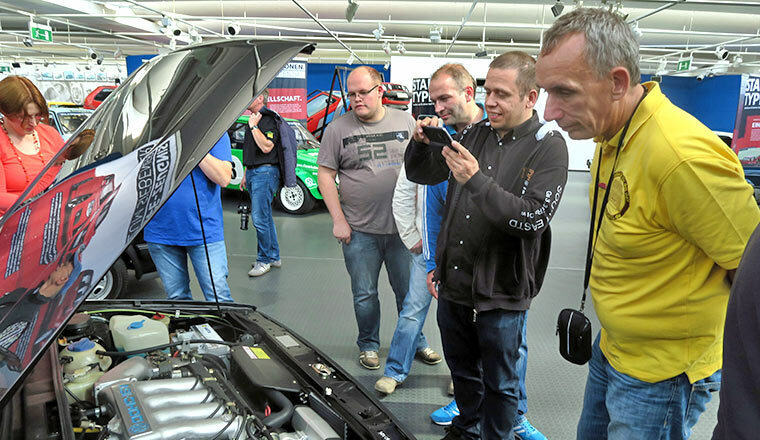 Twelve members of staff took advantage of the Wolfsburg AutoMuseum being closed for the day to find out more about the PS.Speicher concept and exhibition in Einbeck (www.ps-speicher.de). 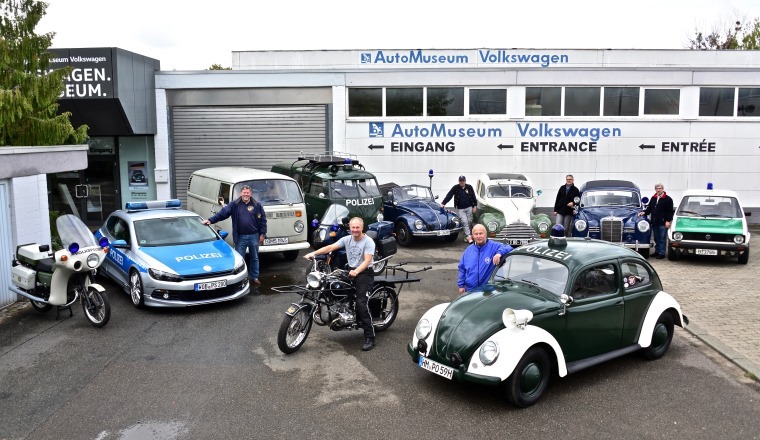 Expertly guided by curator Andy Schwietzer, the team viewed the four-storey exhibition of motorcycles and cars, inclusive of the Volkswagen Panorama. The display of small cars on the ground floor also includes some of the most unusual designs of the fifties and sixties. 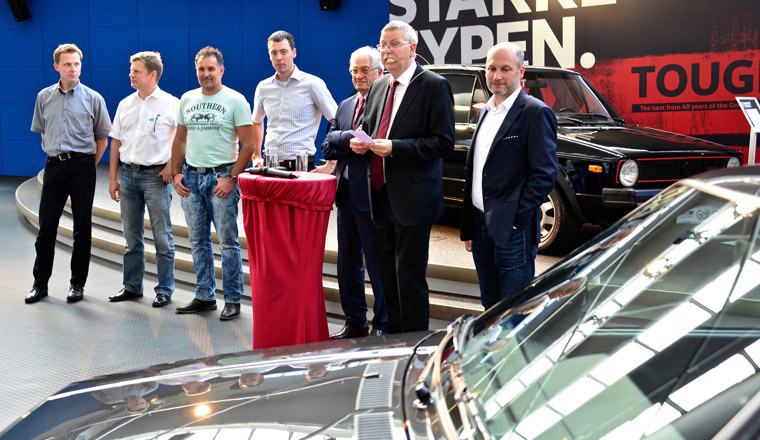 The good collaboration between PS.Speicher and the AutoMuseum is to be intensified still further in future. 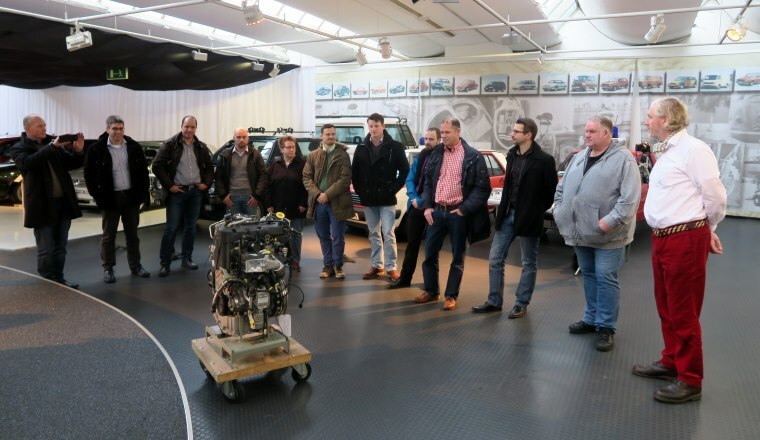 XL1 engine and its developer team visit the Museum. 25 November 2016. 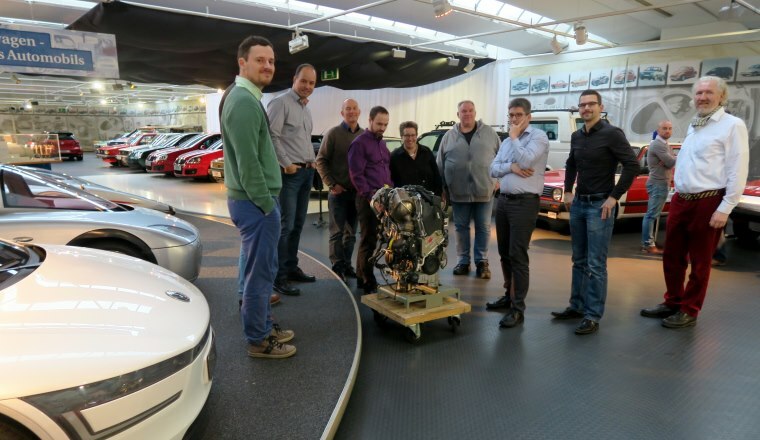 The core team for advance development and transition to full production of the EA 288 XL1 engine - ten highly specialised employees led by Martijn van der Heijden - brought their 'baby' to the AutoMuseum: the two-cylinder diesel engine shares the propulsion work for the two-seater 'Cigar' with an electric motor. The internal combustion engine, which was developed in less than four years, is a so-called parallel twin; the cylinder centre spacing (centre distance) is the familiar 88mm. 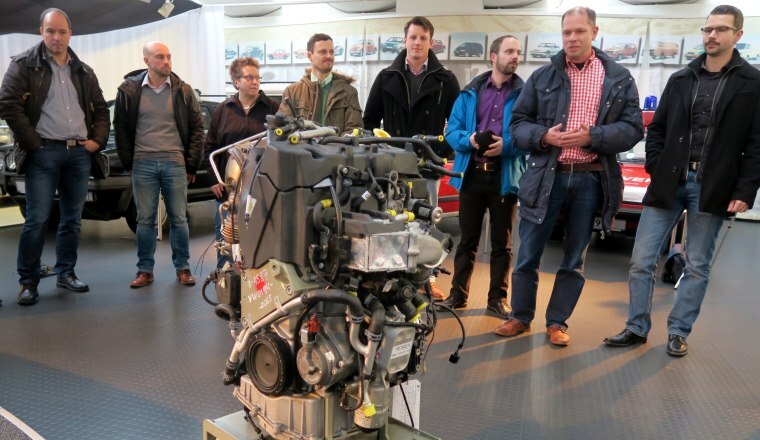 The first 35 kW (48PS) 0.83-litre engines were produced in the engine advance development assembly facility in Wolfsburg. For the larger unit numbers, assembly was then moved to Chemnitz. From there the engines went to Osnabrück, where they were installed into the futuristic looking innovation vehicle. Professor Hahn presents book on his legendary father's life and work. 17 November 2016. For his 90th birthday, Professor Carl Horst Hahn, former Chairman of the Board of Management of Volkswagen AG, gave himself a very special present: in conjunction with Professor Peter Kirchberg, the renowned historian and expert on the history of the carmaker from Saxony, he wrote a biography of the life and work of his father Carl Hahn ('DKW Hahn'). 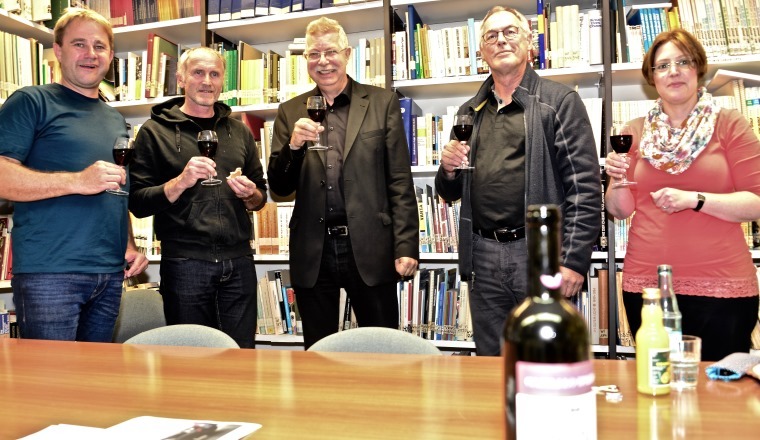 Dr Bernd Wiersch and Klaus Müller also worked on the book. Hahn Snr had a key influence on the destiny of the Zschopau-based business – and thus effectively passed on car manufacturing to his son in his genes. 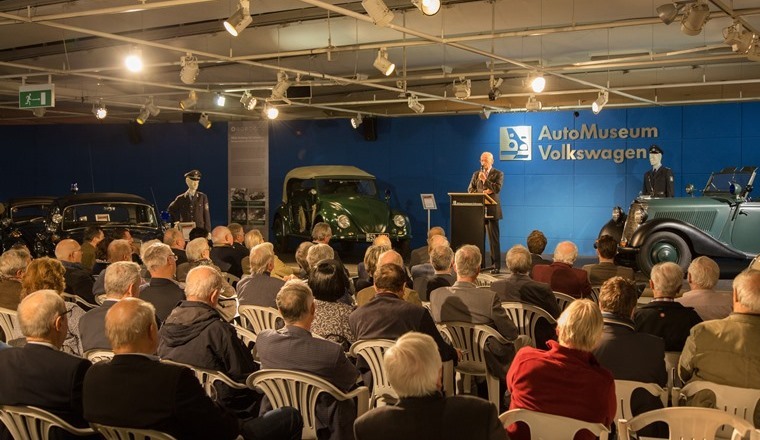 Now, in front of around 120 invited guests at the AutoMuseum, including many of Professor Hahn's former Volkswagen colleagues, the two authors gave a presentation about the book. 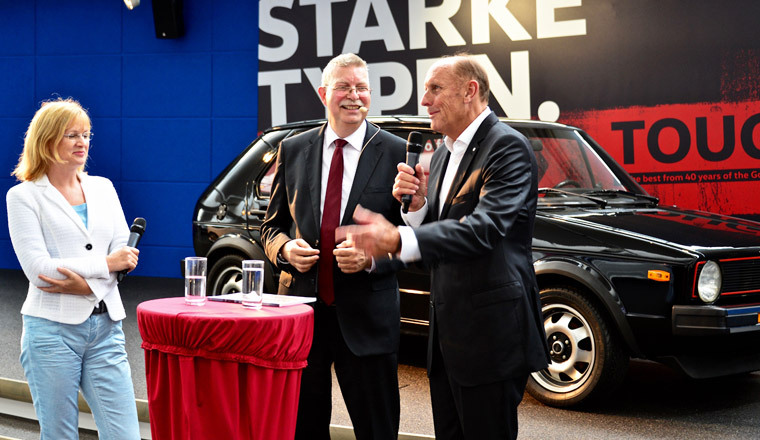 The two emotionally touching talks, given without notes, honoured the life and work of the legendary 'DKW Hahn' from his time in Saxony all the way up to the era of the company's new start in Ingolstadt. 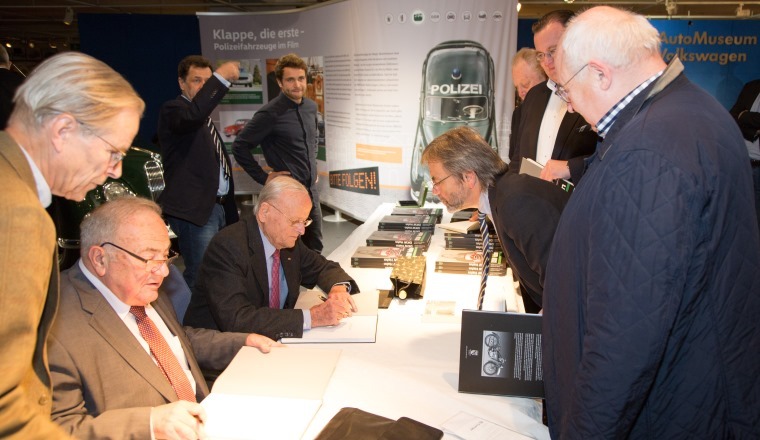 The audience showed their gratitude for the highly interesting talks by purchasing copies of the book – which the authors signed and inscribed with dedications. Published by Heimatland Sachsen Verlag and already in its second edition, the 208-page book is available from all good bookshops (ISBN 978-3-910186-93-4). 1974 Alaska-to-Tierra del Fuego Golf reunited. 11 November 2016. 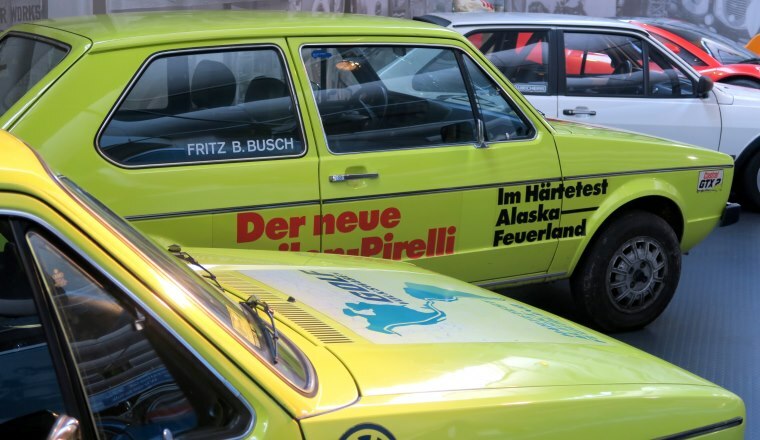 In late 1974, Fritz B. Busch set off on an expedition with two then brand new Golf Mk1 cars and a T2 campervan - from Alaska to Tierra del Fuego. And both the two yellow 70 PS Golfs and the newly developed Pirelli tyres survived the trip. 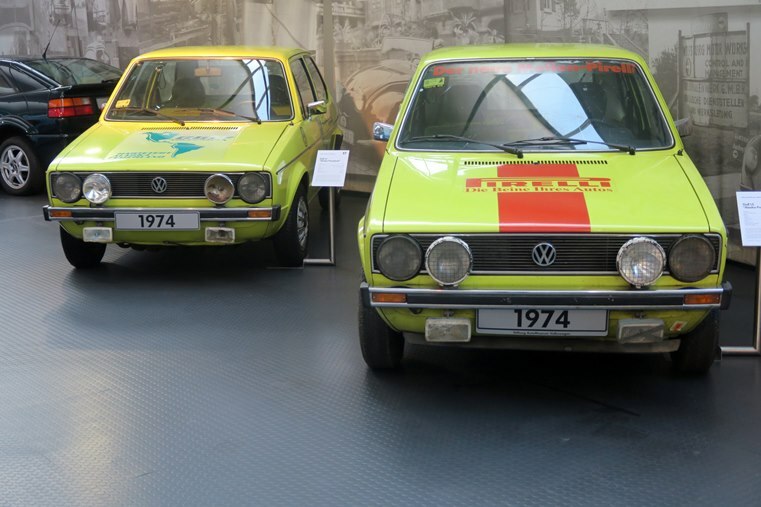 To mark the '40 Years of the Golf' anniversary, the two long-distance champions stood next to each other again for the first time in the Volkswagen AutoMuseum. 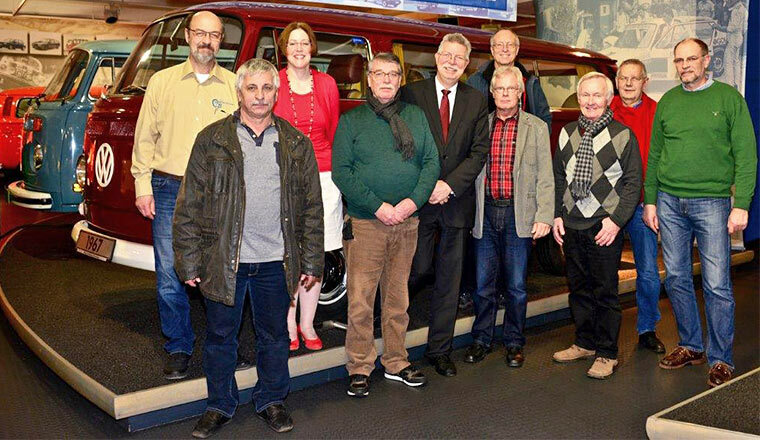 The Fritz B. Busch Museum in Wolfegg has now been taken over by the Lake Constance Auto & Tractor Museum, which generously offered the original Busch car to the Volkswagen AutoMuseum as a permanent loan. 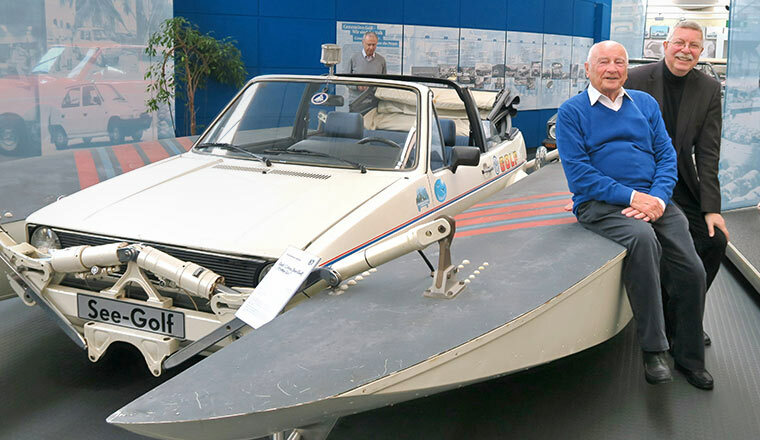 The unique pair of small cars is now on public display. It should also be added that only a very small number of 1974 Golf cars still exist - estimates put it at probably no more than 20. 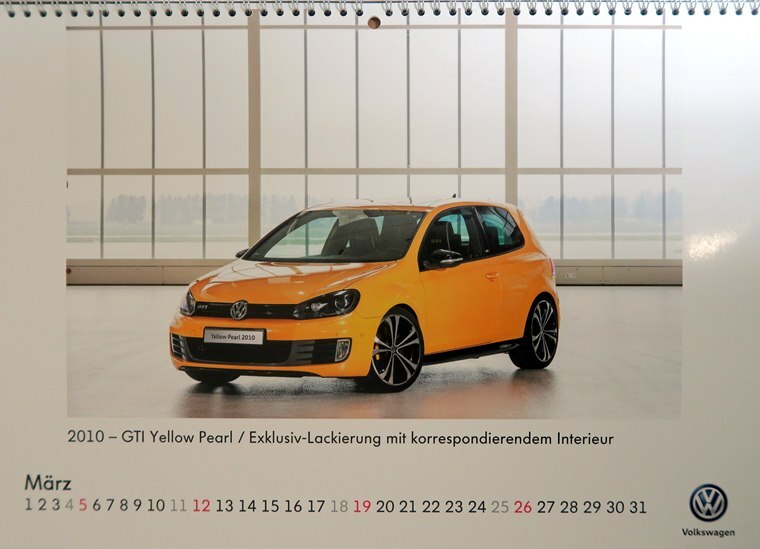 Designed for the first time: 2017 GTI Wörthersee models calendar in the AutoMuseum. 10 November 2016. 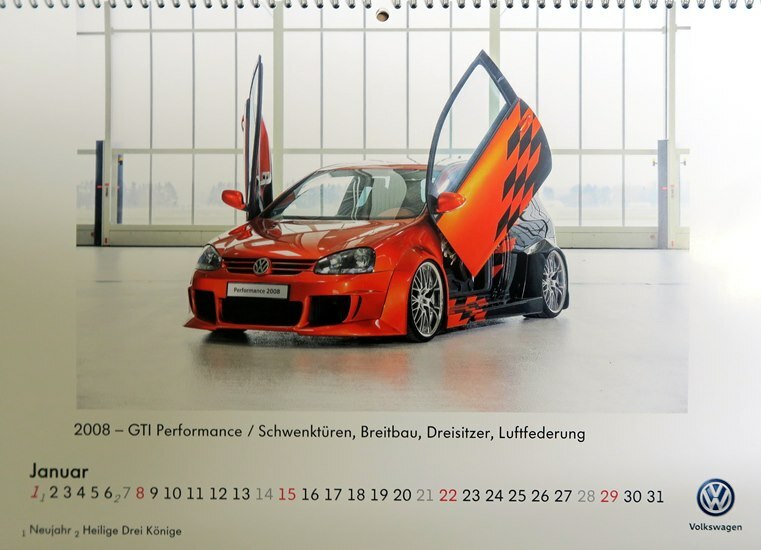 In 42 x 30 cm format, the 12 large month-by-month pages of the new calendar show some of the finest exotic GTI creations designed and built by the Volkswagen Academy / Vocational Training Unit in Wolfsburg. Unique Golf GTI have been created there for the GTI meet at Lake Wörthersee since 2008. 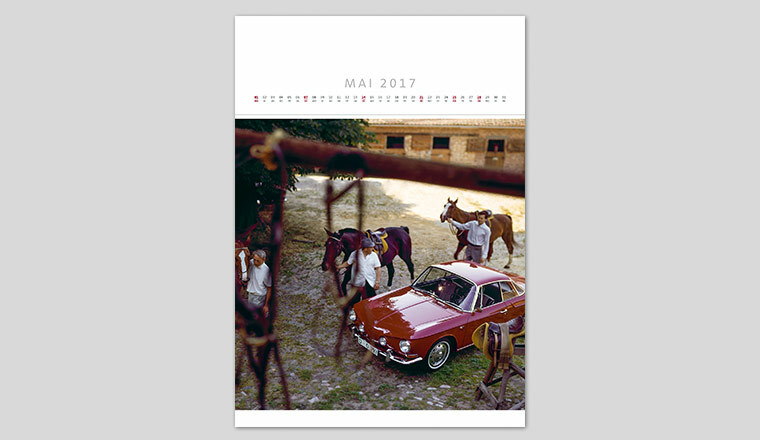 The very attractively made calendar costs €14.90 at the AutoMuseum and can also be ordered online at info@automuseum-volkswagen.de. Osnabrück Automobile Collection even more attractive. 26 October 2016. 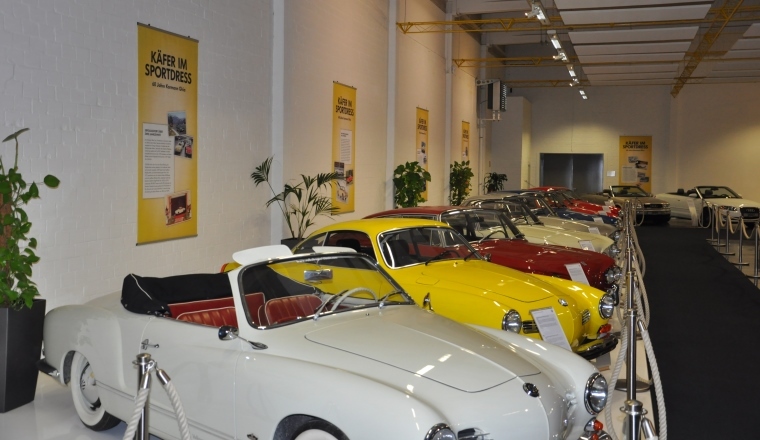 Volkswagen Osnabrück Automobile Collection presents a dozen exhibits from the company's own Karmann Ghia history in their exhibition hall. 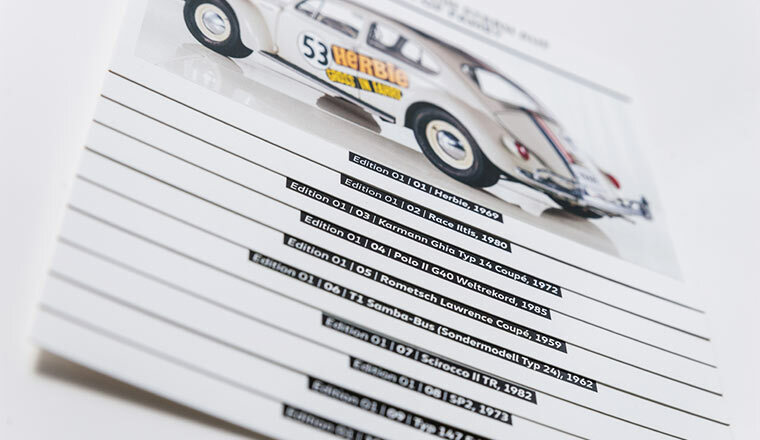 Everything you need to know about the Karmann Ghia Type 14 and Type 34, as well as the SP2 model manufactured in Brazil. 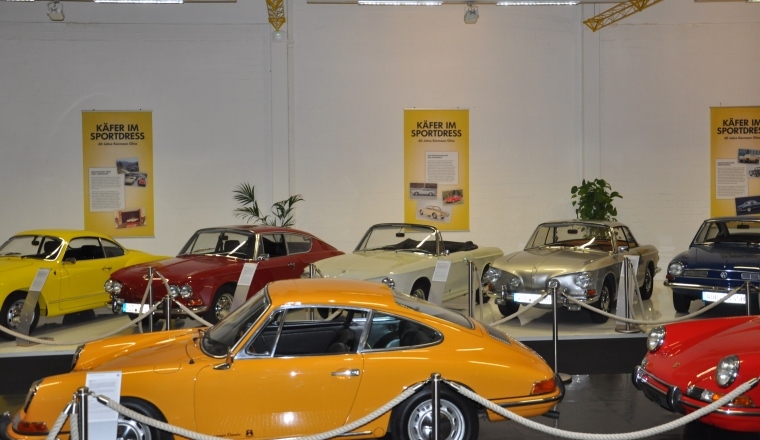 There are also another 15 exhibits such as Beetle, Golf, Scirocco and Corrado, all of which were produced by Karmann. 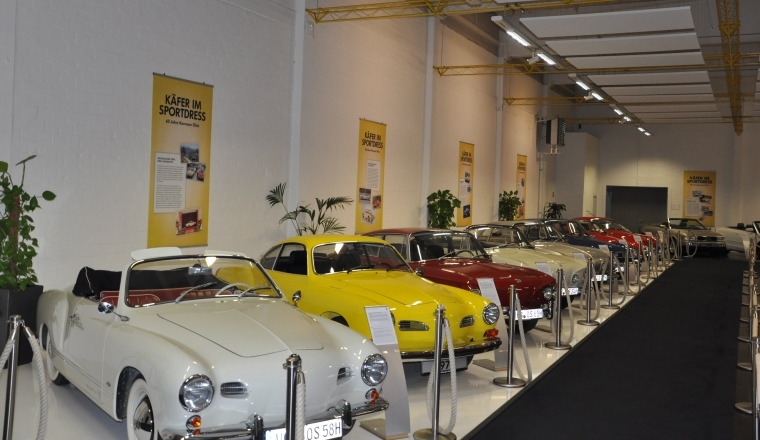 The yellow and black explanatory panels in the background were created in collaboration with the Volkswagen AutoMuseum Foundation, where the sixtieth anniversary of the Karmann Ghia was celebrated in 2015. 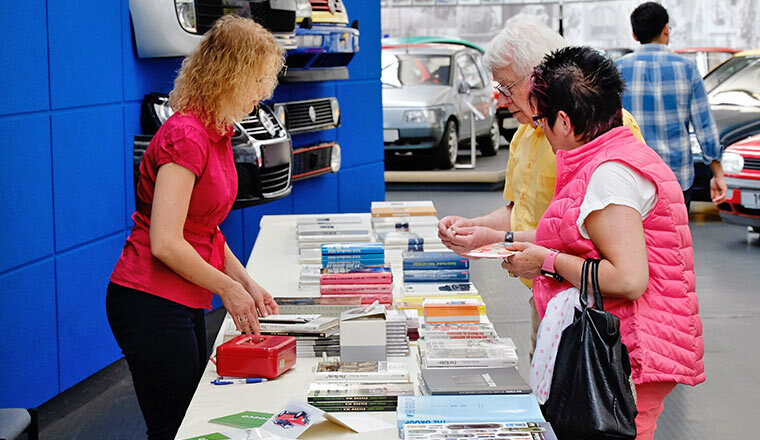 To visit the exhibition, sign up for a factory tour in plenty of time at besucherdienst@volkswagen-os.de as there are long waiting lists! 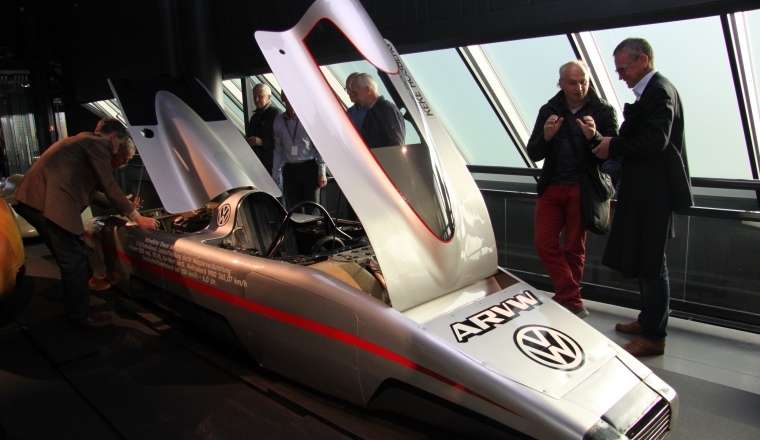 ARVW at the Riga Motor Museum. 18 October 2016. 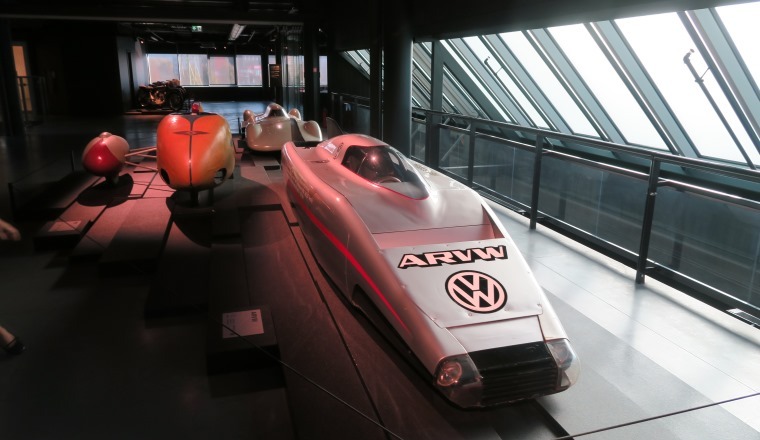 In autumn 1980 a “flounder”, made in the wind tunnel named Aerodynamic Research Volkswagen (ARVW) with a turbocharged six-cylinder diesel taken from the LT, broke a number of class and world records, some of which still stand today. The car driven by Keke Rosberg is in the AutoMuseum, while the identical, never-used replacement car has been on long term loan in Latvia for a quarter of a century. 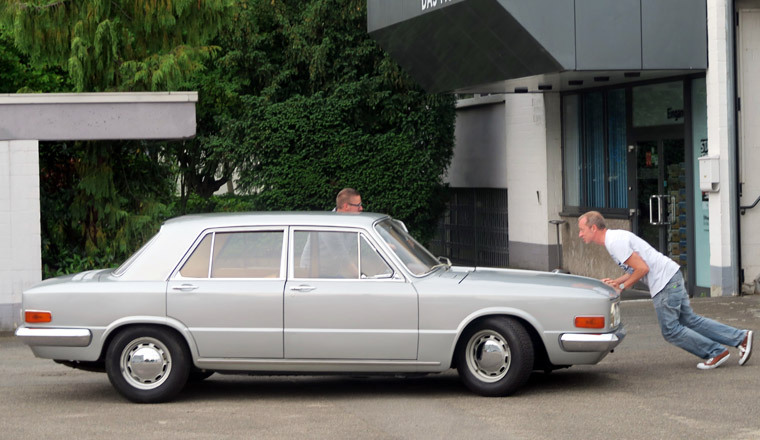 Following the recent opening of the completely redesigned Motor Museum Riga, which is well worth seeing, the director of the German AutoMuseum, Eberhard Kittler, came to see the replacement car. Its neighbours are two, seemingly insubstantial but record-breaking vehicles built in the Soviet era called EKE (1952) and MADI Pioneer 2M (1963). 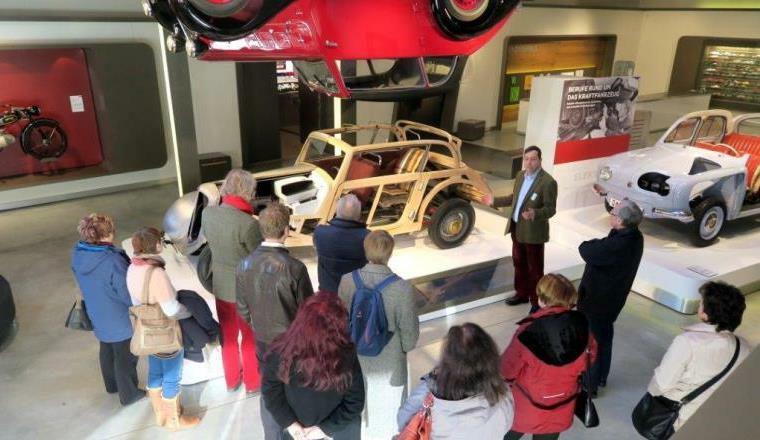 Kittler then gave a technical lecture on the ARVW and other prototype exhibits of the Wolfsburg brand museum in front of a very interested 30-strong audience of experts. 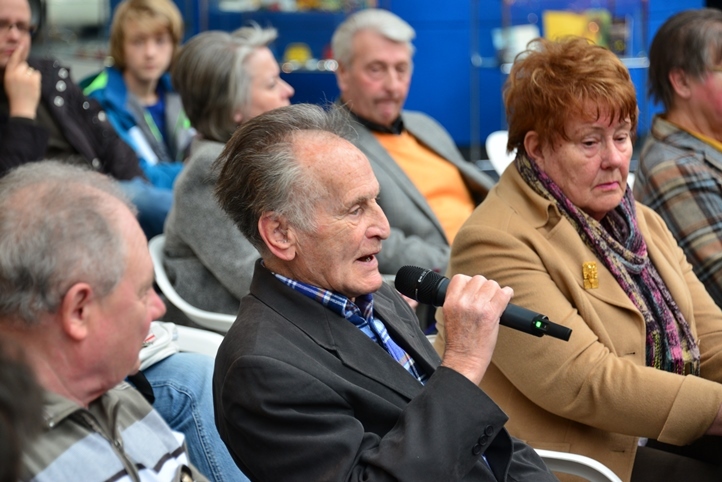 This lecture was given in English – as is commonplace in the Baltic region – with the Motor Museum also offering explanations in Russian. 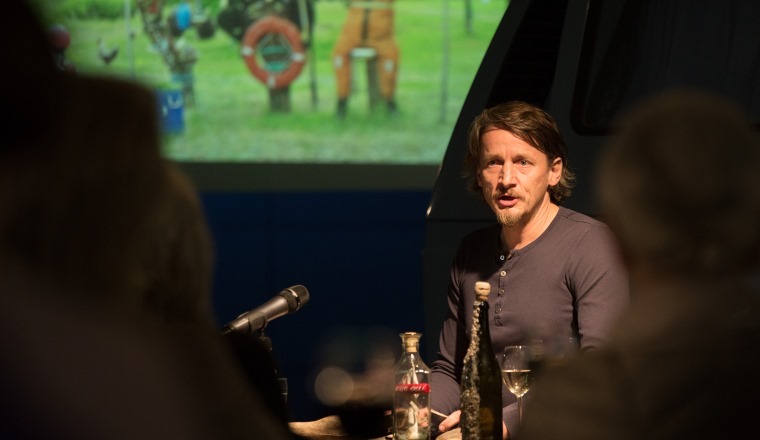 Messages in a bottle: Author Oliver Lück gives a reading at the AutoMuseum. 18 October 2016. "Every beard is of course as impressive as the person who wears it." With this favourite sentence, as Oliver Lück confides to his audience at the reading of "Flaschenpostgeschichten" (Messages in a bottle) at the AutoMuseum, he describes the appearance of fisherman Arne. Fisherman Arne is one of the protagonists whose life Lück describes in his eponymous book. The catalyst for this was the Latvian woman Beruta who Lück met in 2008 on his journey to writing his first book. She had found 40 messages in bottles, but had never answered a single one. Lück took on this task and there was a kind of chain reaction, which revealed the tight network of writers and finders of messages in a bottle. He gets replies even to this day, says Lück. Hence the idea for the book and another journey to the international Baltic Coast. 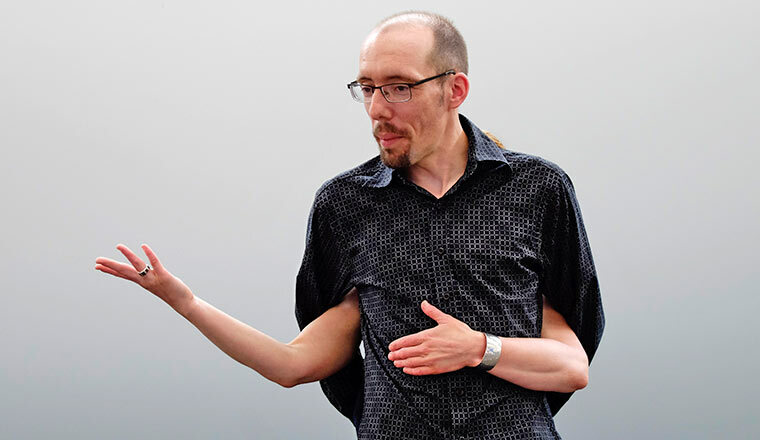 He has some anecdotes himself as a result of his research, such as dealing with his homemade bottle automaton, which he amused his audience with between reading selected chapters. 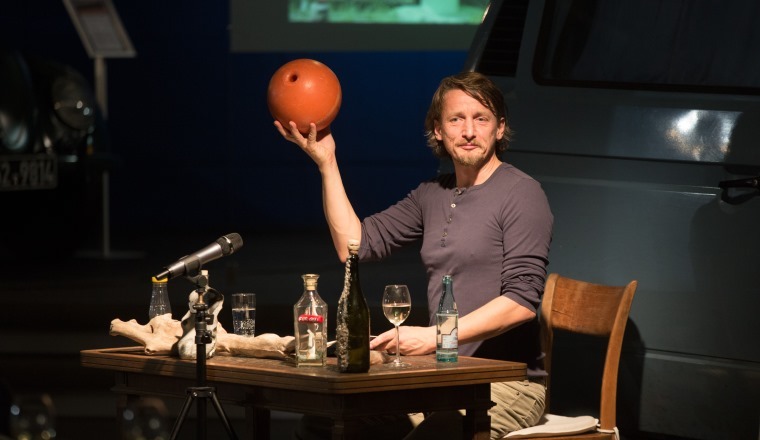 It was a very personal evening buoyed by plenty of humour, as well as thoughtfulness and great sympathy from the audience for the fate of people connected to the messages in a bottle. 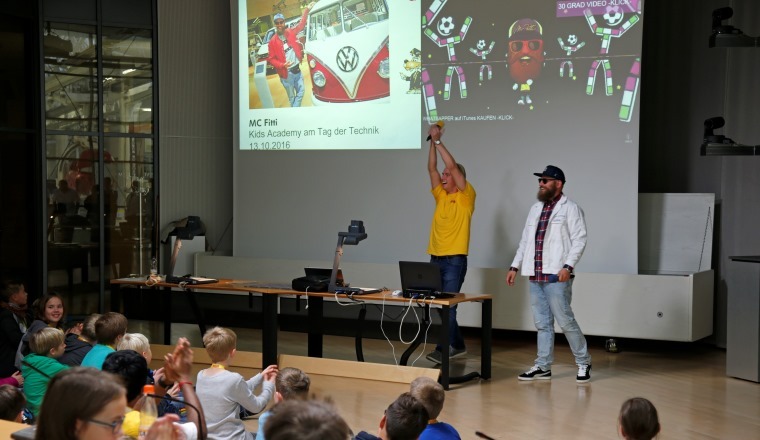 Herbie thrills the children at Technology Day at the VW factory. 13 October 2016. 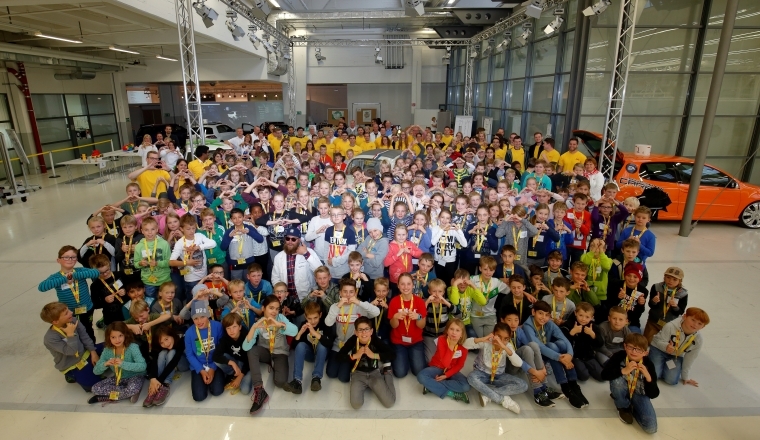 Every year in the autumn holidays, the foundation “Antonius Holling Stiftung” of the Catholic Christopherus Community in Wolfsburg, in cooperation with patron Elisabeth Pötsch, invites school children aged between eight and twelve to the Technology Day in the pilot hall at the Volkswagen factory. 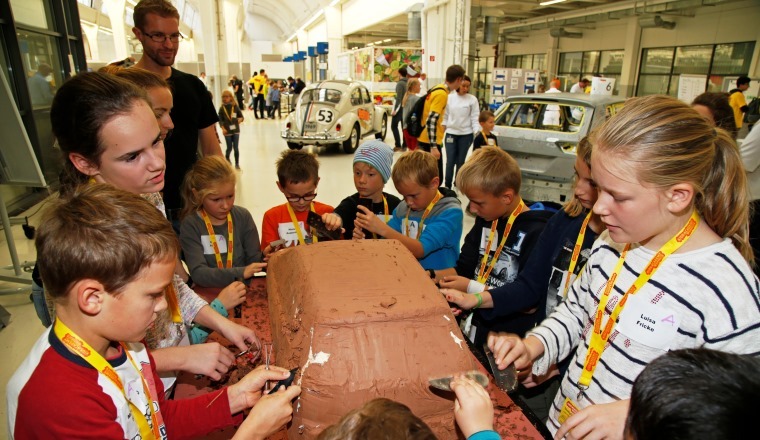 Several interactive stations gave 180 girls and boys the chance to discover the technical details of car manufacture in a fun way, such as how the design is taken from a clay model or the VR goggles. 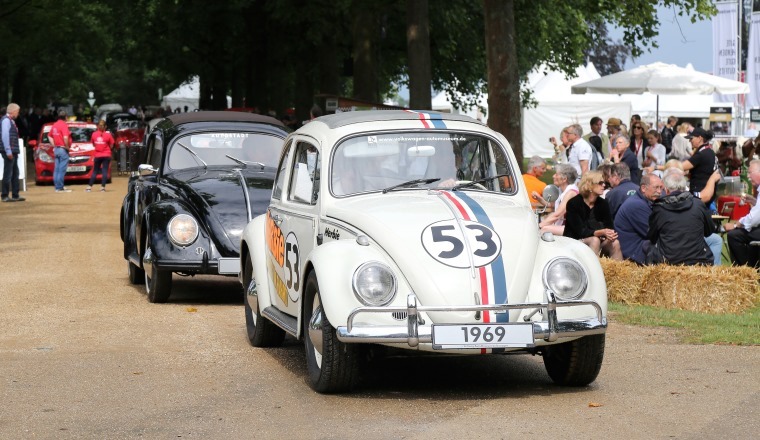 Volkswagen AutoMuseum's original Herbie gave a glimpse into history and was enthusiastically admired by the children. And MC Fittie was also one of the visitors. 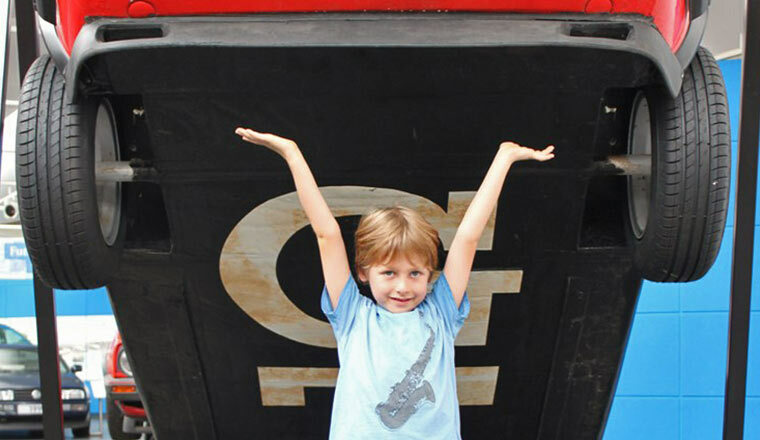 Winners of the "Strong performers" photo competition awarded. 4 October 2016. 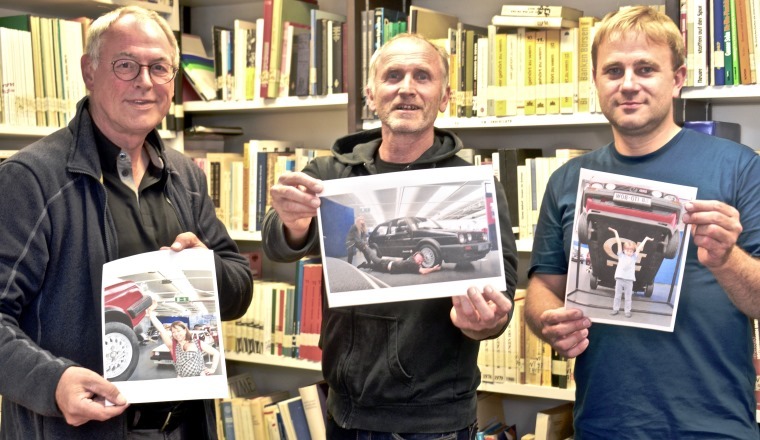 Nearly 50 visitors took up the invitation to take part in the photo competition run by the AutoMuseum during the special exhibition on the 40th anniversary of the Golf GTI and entered their strong performers for consideration. 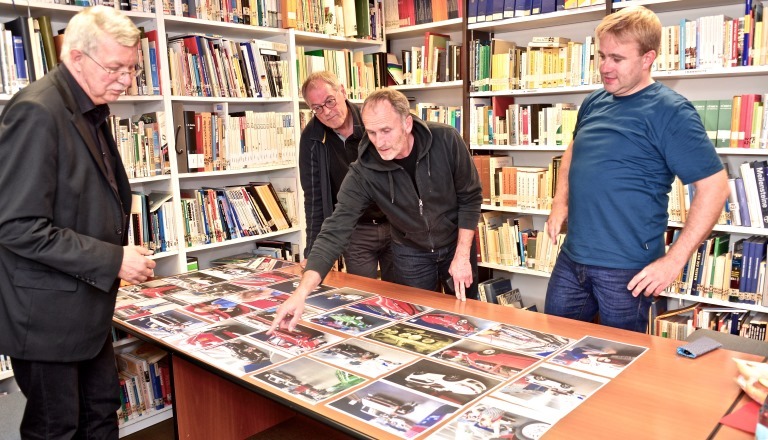 As well as looking for photographic talent, the expert jury consisting of the three Wolfsburg professional photographers Lars Landmann, Matthias Leitzke and Roland Hermstein were looking in particular for scenic interpretation. Not an easy choice as all participants had a story to tell with their photographs. 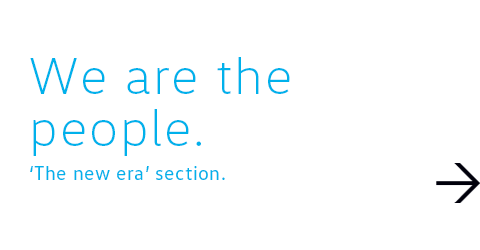 We have displayed the winning photographs and the jury at work here. "Take a second look" pre-opening. 27 September 2016. 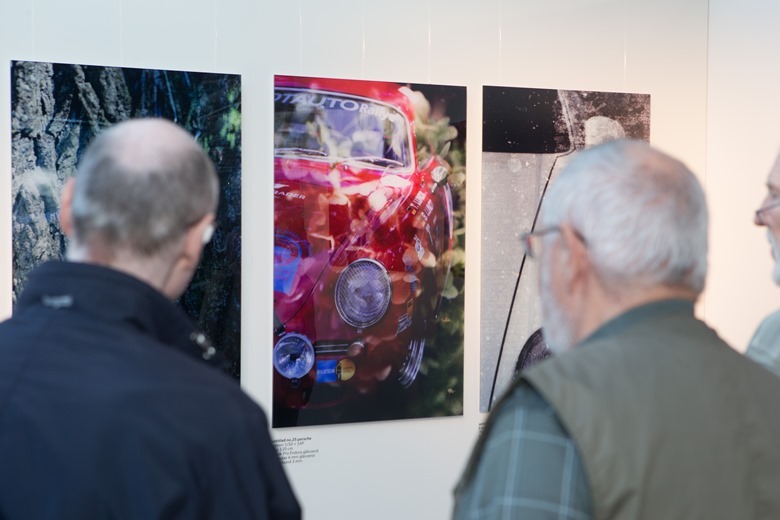 Around 50 guests came by invitation to the Volkswagen AutoMuseum for the pre-opening of the "Take a second look" photo exhibition by the Potsdam artist Jakob Kähler. They were impressed by his photography created using the double exposure technique. Kähler has fused two of his hobbies here. 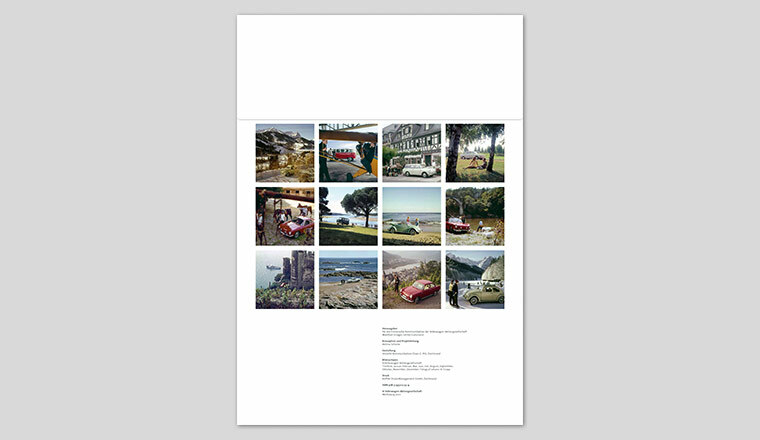 Analogue photography and his passion for historic sports cars are easy to recognise in the images. However, the second subject in the photo is not always so easy to find. The visitors had a lot of fun tracking it down. The exhibition runs until 23 December 2016. Take a look at the website www.double-exposures.de to learn more about Kähler, his photographs and the technique of double exposure. 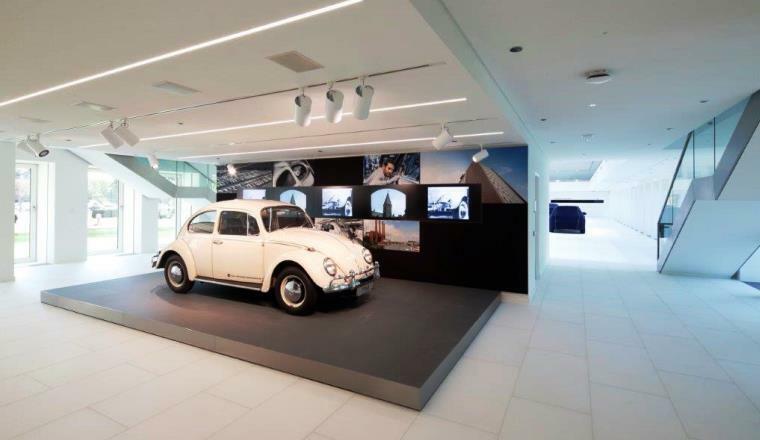 Volkswagen AutoMuseum exhibit embellishes company tower. 15 September 2016. Having been closed for around two and a half years while it was gutted and completely refurbished, the listed administration tower block, a landmark of the plant and of the City of Wolfsburg, has reopened. 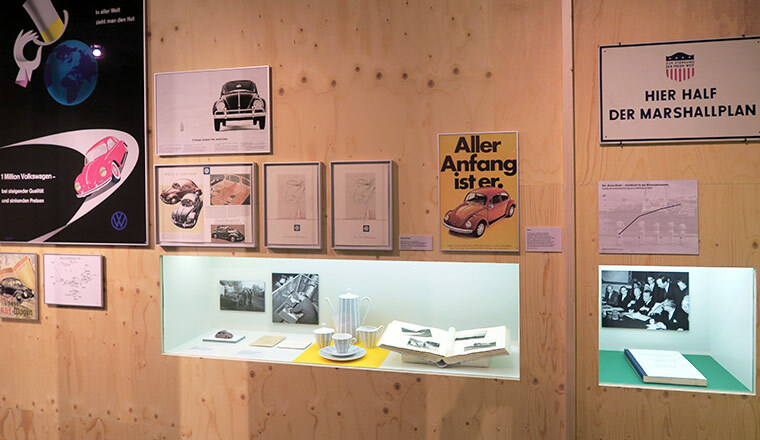 On the ground floor of the 13-storey building, the designers have gone back to the original format, creating an exhibition space just as there was in Nordhoff's day. 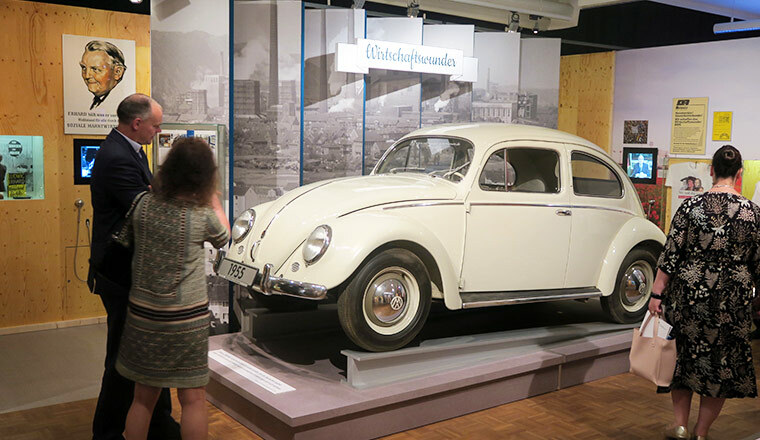 The exhibits lovingly put on show there include a 1966 Export Beetle from the Volkswagen AutoMuseum. It is intended to remind staff and visitors of the company's roots. Motorsport exhibition in DRIVE Berlin. 7 September 2016. 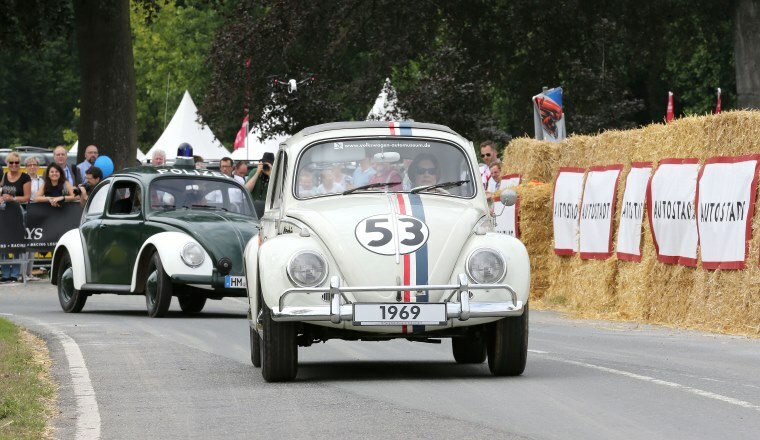 To mark the 50th anniversary of Volkswagen Motorsport, DRIVE in Berlin, on the corner of Friedrichstraße and Unter den Linden, is staging an exclusive exhibition of historic racing cars. 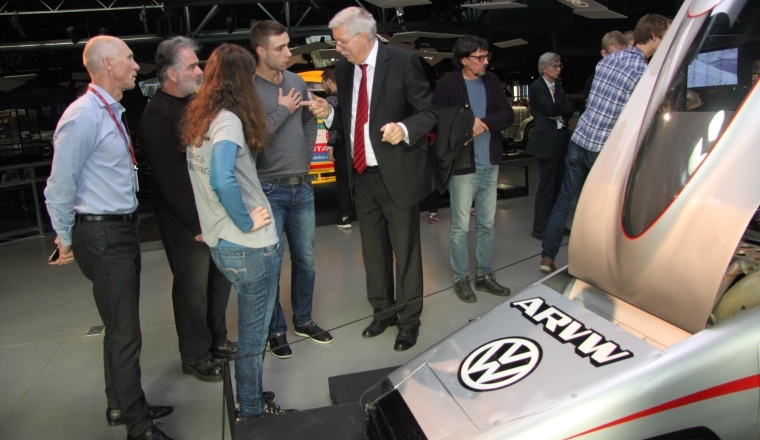 They include the AutoMuseum's Rheila Golf GTI, which was explained to museum director Eberhard Kittler by the successful team of that time, Alfons Stock and Paul Schmuck. Klaus Niedzwitz and Rainer Braun rummaged around in their memories on the subject of Formula Vee; Jochi Kleint recalled the nightmarish drive with the twin-engine Golf up Pikes Peak. Racing drivers 'Strietzel' Stuck, Tom Gottschalk and Sébastien Ogier were also asked about intriguing details by host Patrick Simon. The exhibition is still on and runs until 30 October. 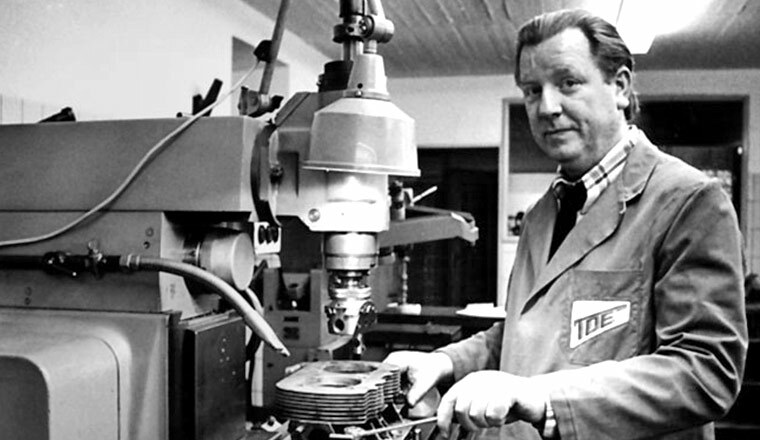 Volkswagen legend Theo Reckhorn has died. 28. August 2016. 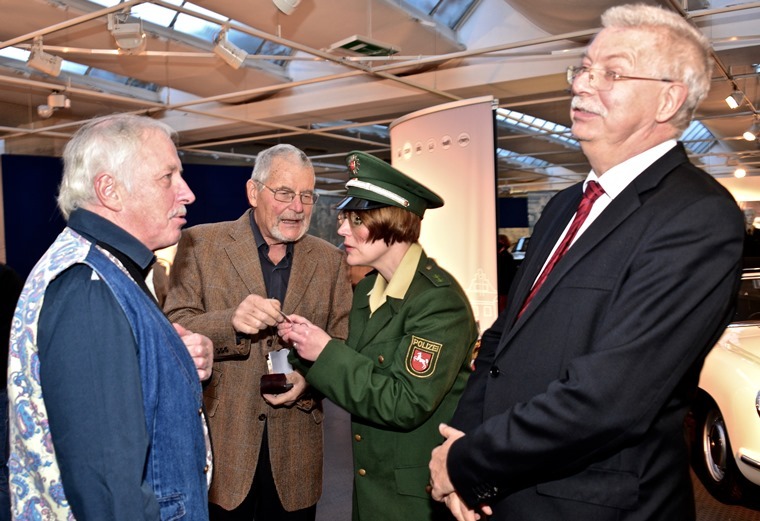 Theodor Reckhorn's performances in the AutoMuseum were always entertaining and exciting. He died aged 88 at his creative and home town of Wolfsburg. 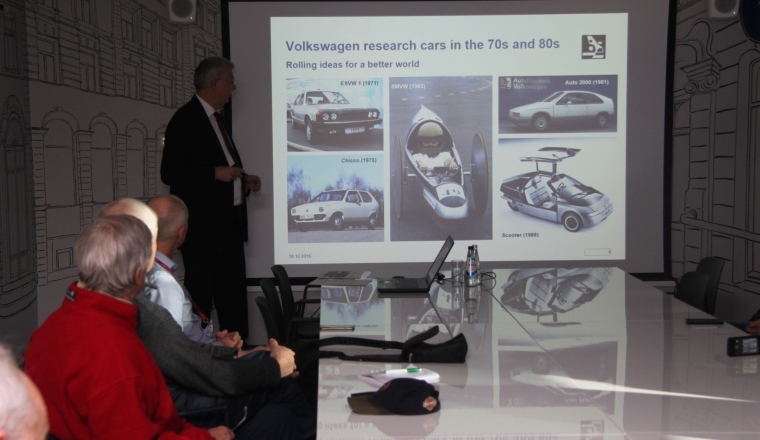 He last headed the Vehicle Body Prototyping Research & Development department at Volkswagen. 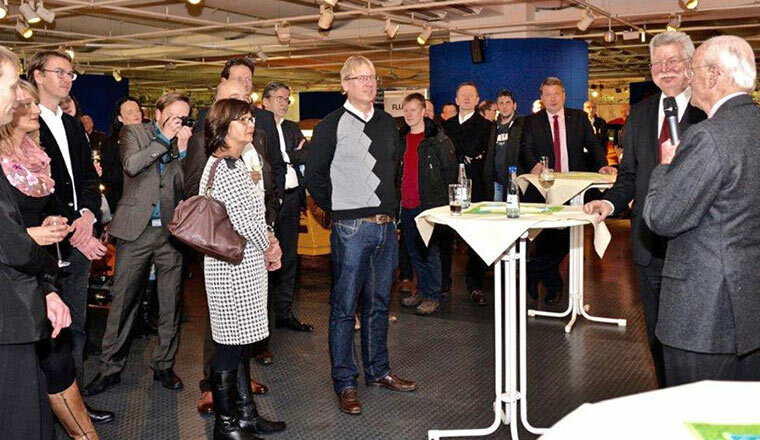 During this time, he willingly contributed his rich professional experience that he gained in Hannover Linden at Hanomag. 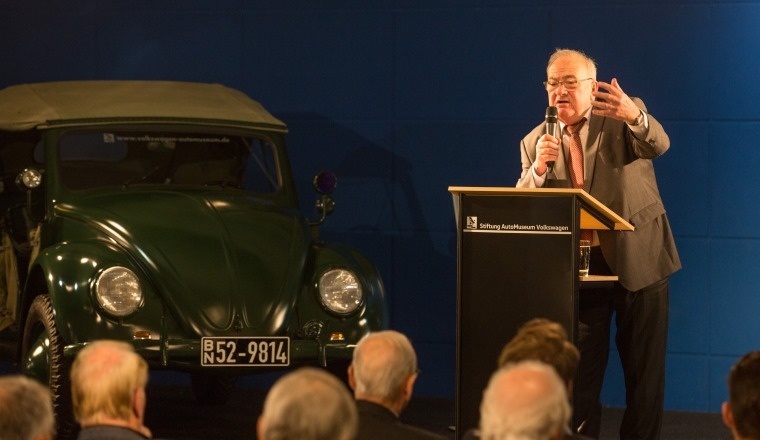 After his retirement, he devoted himself to his passion – the restoration of classic cars, especially classic Volkswagen ones. 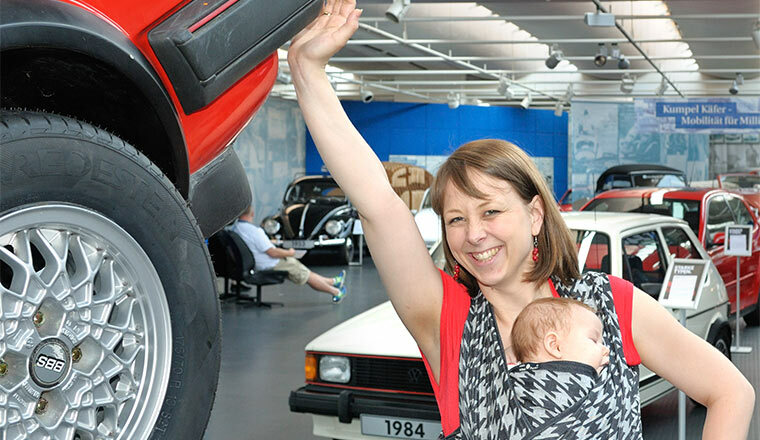 The AutoMuseum is now enriched by several classics restored by him such as the Samba, Beetle convertible and VW saloon. Enthusiasts and fans of the brand will miss him and his knowledge and expertise. Technological showpiece with gesture control in the AutoMuseum. 23 August 2016. 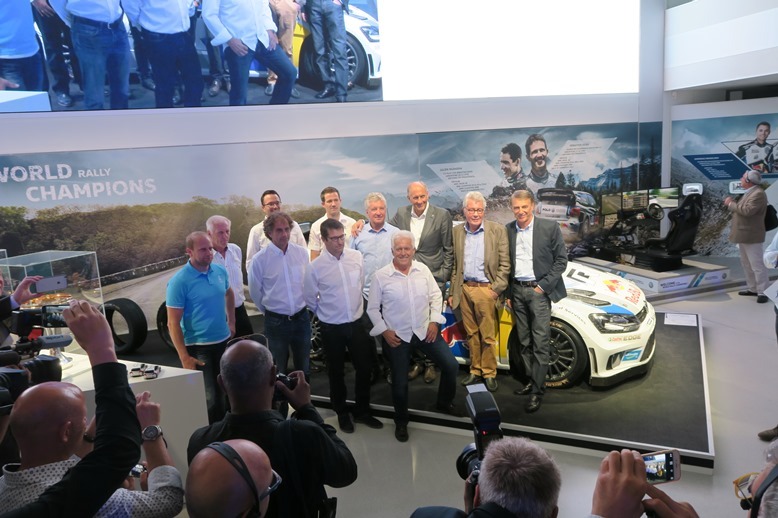 With the official handover of the Golf R Touch, the Volkswagen AutoMuseum has gained a pioneering technology showpiece with extremely simplified operation. 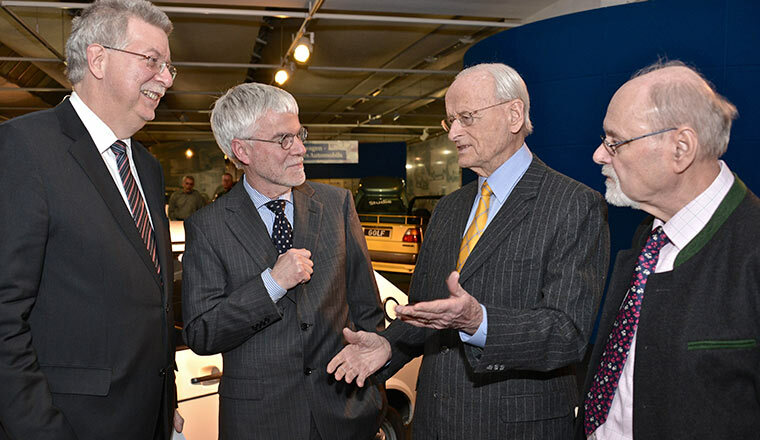 The Volkswagen car development engineers, Mark Peter Czelnik and Nils Kötter, explained to museum staff and representatives of the press how the car's functions can be controlled merely by gestures. 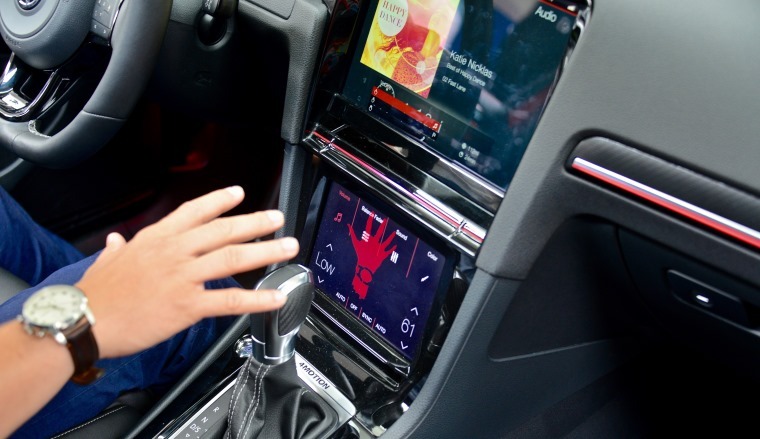 Three large displays help here – two in the centre console and one behind the steering wheel – through which the full infotainment system can be programmed. Likewise, the sunroof or windows can be opened using gestures as well as operating the lights and adjustable seats. Interested visitors can try out the technology of the car at the AutoMuseum, supervised by our expert staff. We request you register in advance. 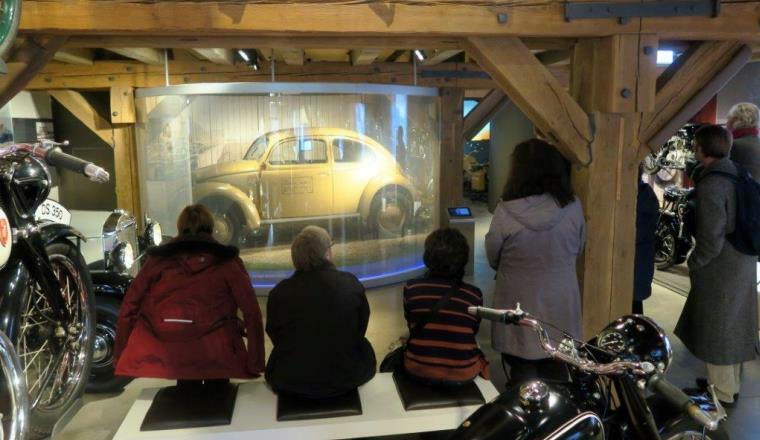 The AutoMuseum takes part in the Beetle Sunshine Tour. 19 to 21 August 2016. 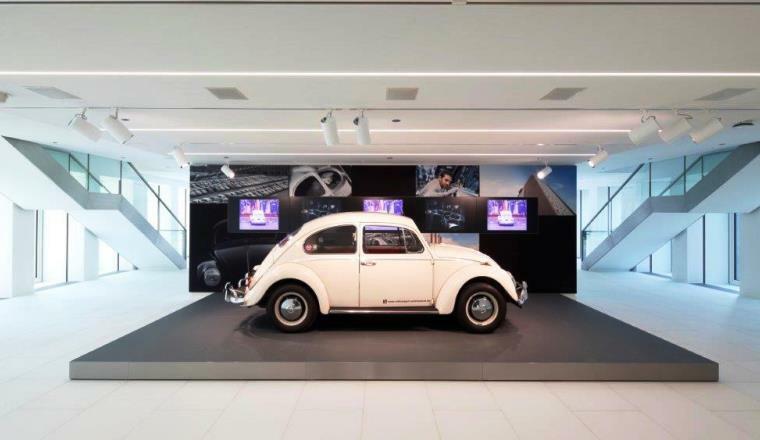 For the twelfth time, the Volkswagen AutoMuseum Foundation supported this cult event with Beetle exhibits from its collection. 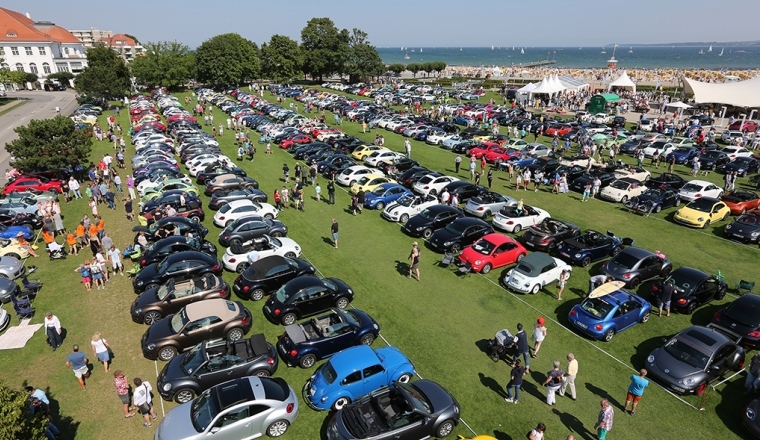 The total Beetle Mania from 1998 was the reason for beginning this event in Lübeck Travemünde, just like the Rizzi and Otmar Alt-Beetle. 62 motor journalists from around the world took part in this international event. 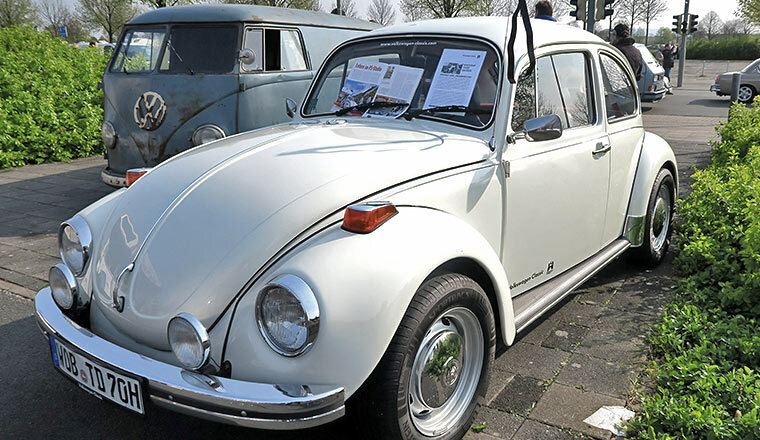 The Jeans Beetle, also from the AutoMuseum's collection, also delighted the public - bringing back fond memories of the seventies. 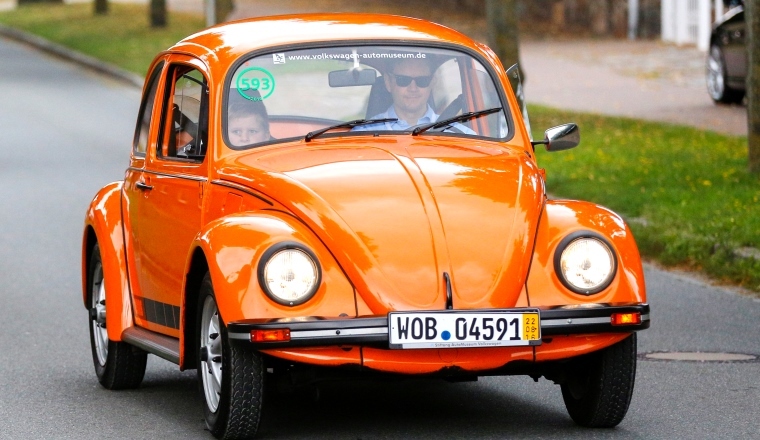 The highlight of the event was the sight of 640 VW Beetles setting off from Travemünde to Kultur Gut Hasselburg (Hasselburg Manor) and back, with Luna Schweiger, actress and daughter of Til Schweiger also participating. A second Rovomobil has surfaced in Eisenach. 7 August 2016. Since the early 90s, a beetle-based streamlined car called a Rovomobil, built in the GDR, has graced the AutoMuseum's collection. 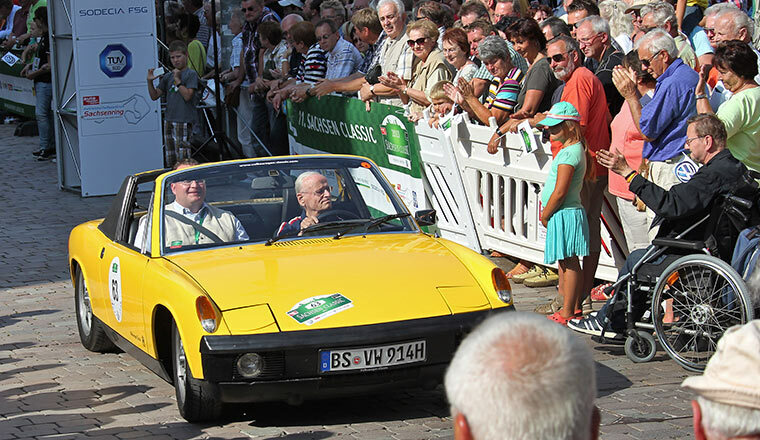 Dr Eberhardt Scharnowski and Klaus Arndt built this vehicle together with a very similar second version in the '70s. 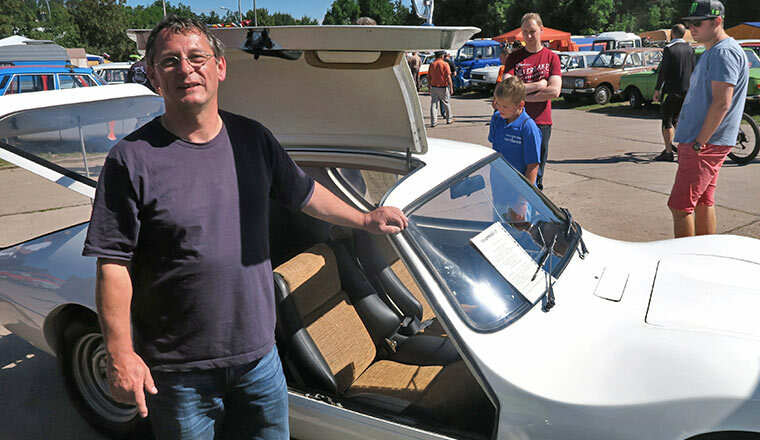 The second Gullwing, more modern in detail and not completed until 1981, appeared unexpectedly during the Wartburg drivers' “Heimweh-Treffen” meeting in Eisenach. It was recently acquired by Wolfram Scharnowski, son of the original builder. 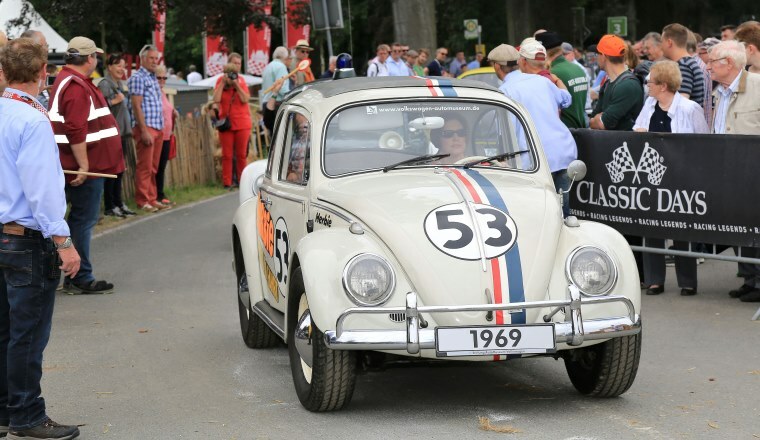 Herbie attends the “beetle scramble” at the Classic Days event at Schloss Dyck. 5 to 7 August 2016. 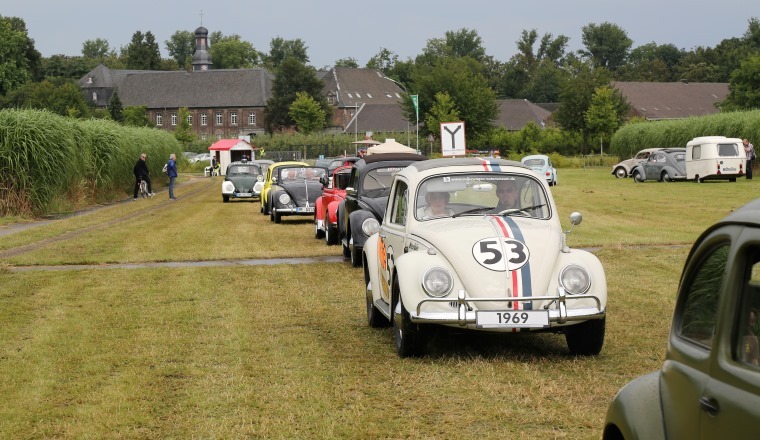 The Autostadt Wolfsburg visitor centre had a special highlight in store at the Classic Days at Schloss Dyck castle: the “beetle scramble”. 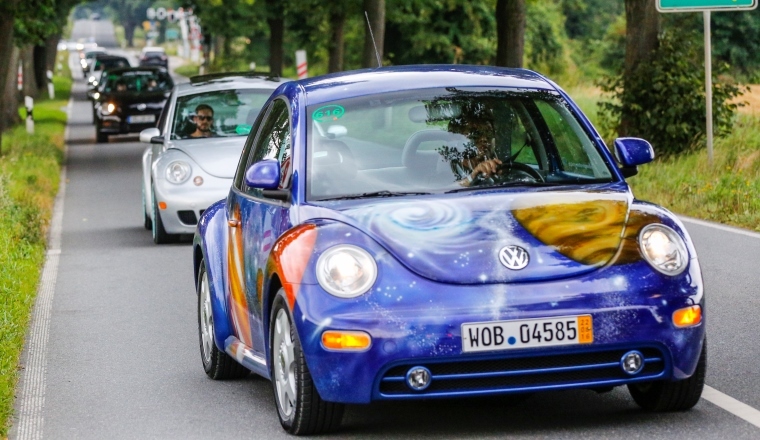 Around 20 Beetles took part – some from the collection in the “ZeitHaus” museum at the Autostadt, others from members of “Brezelfenstervereinigung e.V.” (Pretzel Window Club), as well as the original “Herbie Beetle” from the Volkswagen AutoMuseum Foundation. 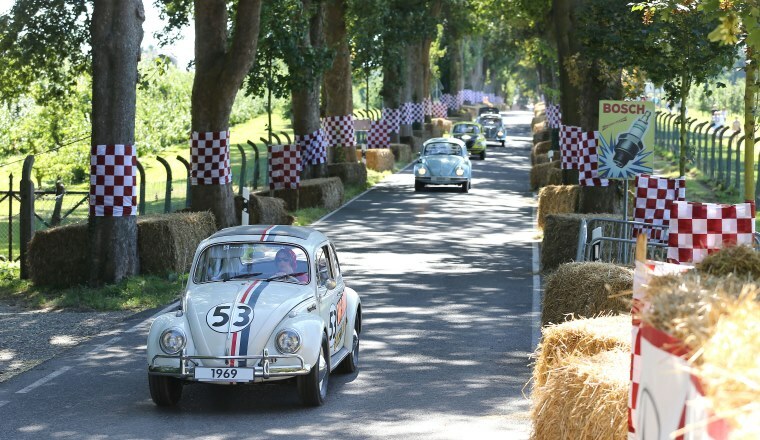 The beetles went twice round a “racetrack” set up by the organisers and going around the Castle and were cheered loudly by the many spectators. 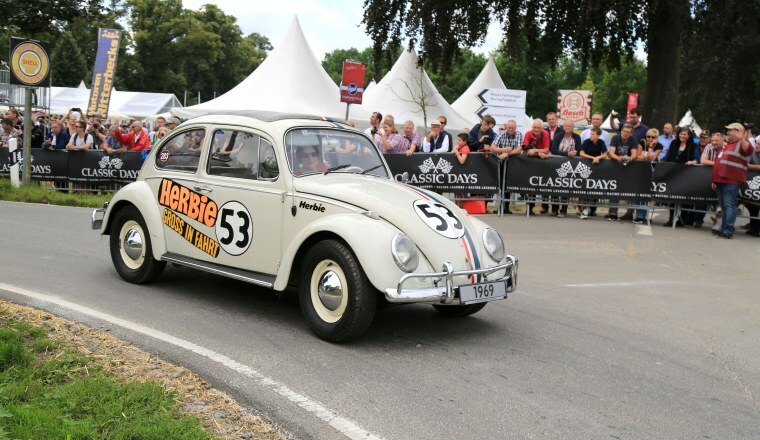 Herbie sparked an enormous amount of enthusiasm – while the Rometsch Coupé, which was contributed by the Brezelfenstervereinigung, and the Beutler Beetle flatbed from the Autotadt, driven by racing legend Christian Geißendörfer, also got plenty of applause. Around the castle, visitors could admire vintage and classic cars of almost every age and of every colour for three days in the sunshine. 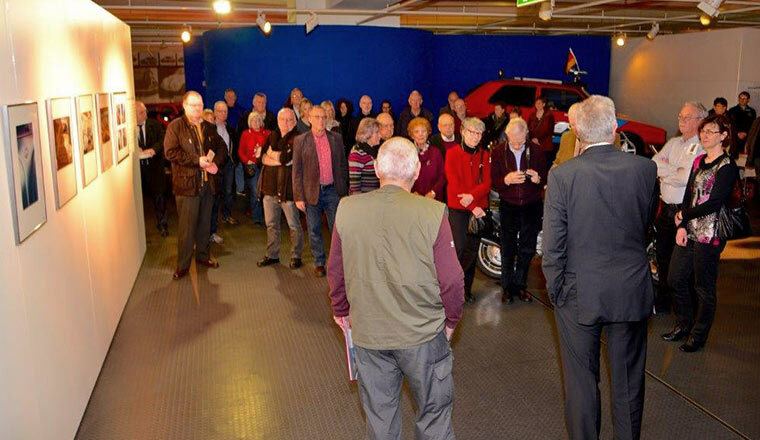 Participants in the Original Golf 1 IG meeting visit the AutoMuseum. 15 July 2016. 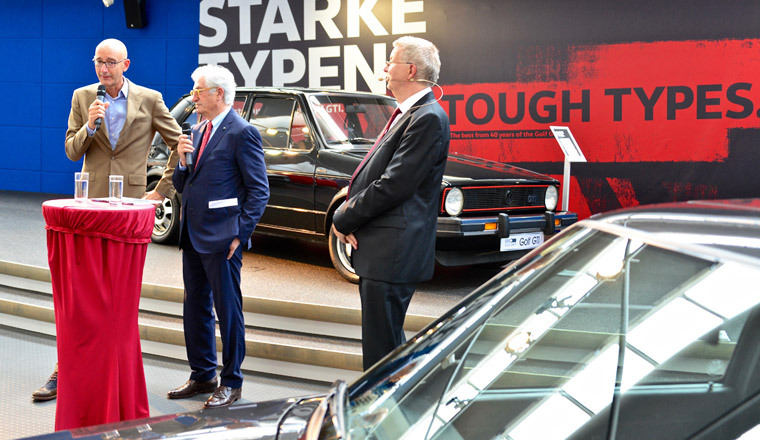 During the annual meeting of the Original Golf 1 IG club in Wolfsburg, the Volkswagen AutoMuseum invited participants to take an exclusive tour of the special exhibition celebrating the 40th anniversary of the Golf GTI. 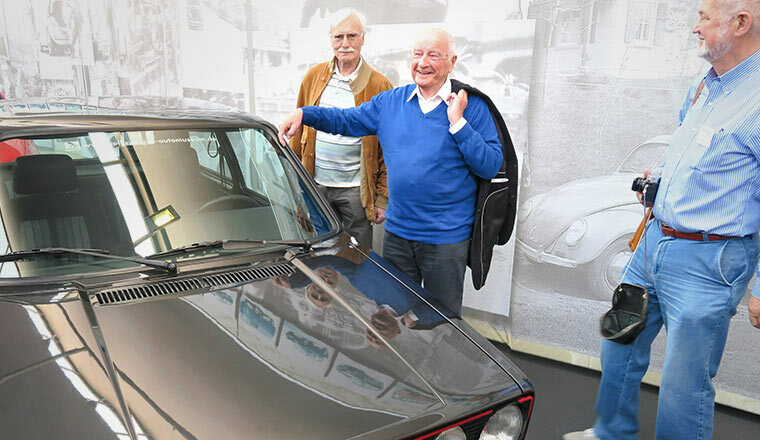 Sixty-five Golf fans didn't need to be asked twice: they drove up to the museum in their Golf 1 models, many of which were first-generation Golf GTIs. 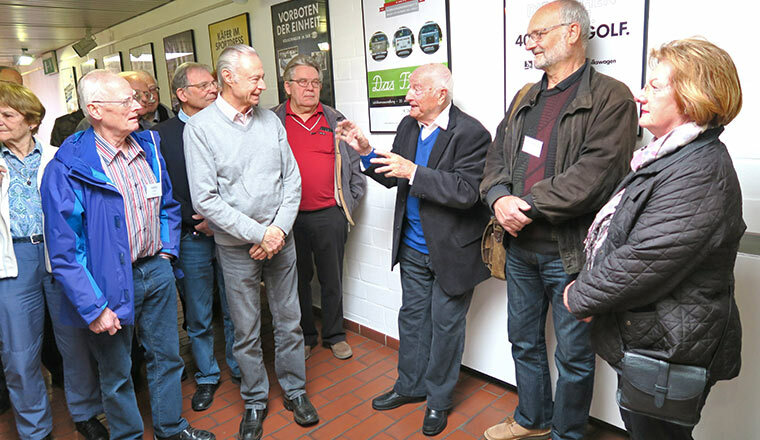 After being given a brief introduction to the exhibition and its models by AutoMuseum Foundation Chairman Eberhard Kittler, the club members took a closer look at the GTIs on display. 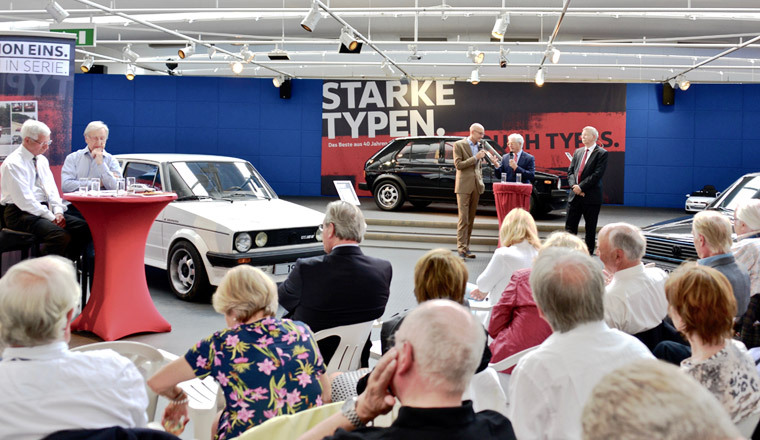 The visitors were particularly interested in the original Golf GTI from 1976, the prototype from 1975 and the Golf II Limited, of which only 71 units were ever built. 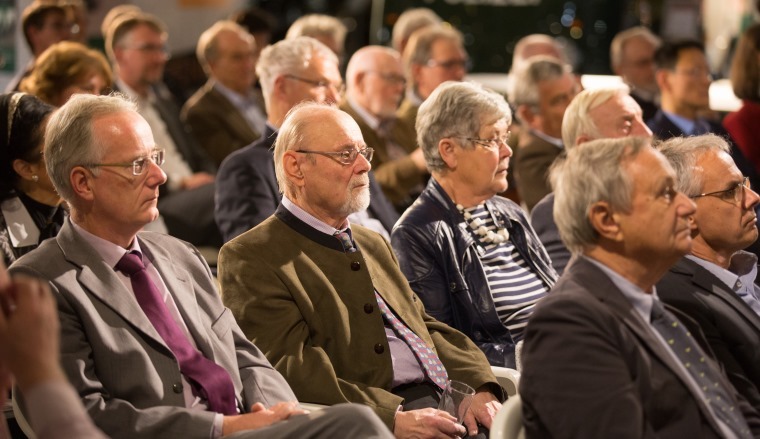 Professor Carl Horst Hahn turns 90. 1 July 2016. 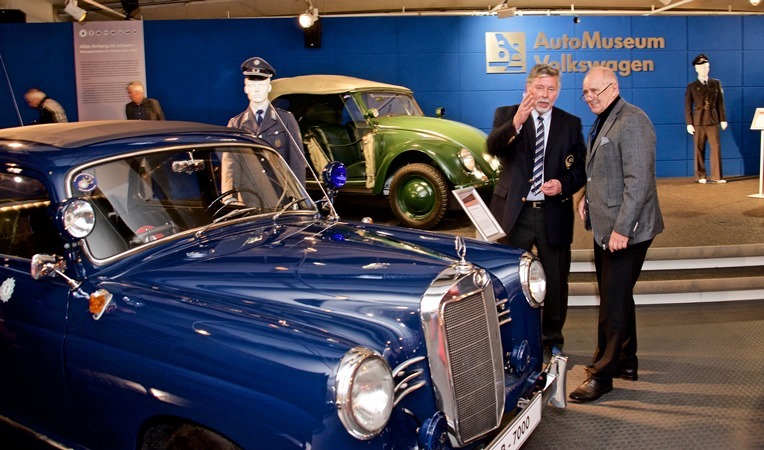 Professor Dr Carl Hahn, who is likely the most important patron of the AutoMuseum, was born in 1926 in Chemnitz as the son of a DKW manager. At the beginning of the 1950s, Hahn and August Horch went on long drives to search for a new location for Auto Union in West Germany. In 1953, he was appointed Assistant to Volkswagen CEO Heinrich Nordhoff. Five years after that, he became Head of Volkswagen of America, where he initiated the clever ads for the Beetle and the Bulli. 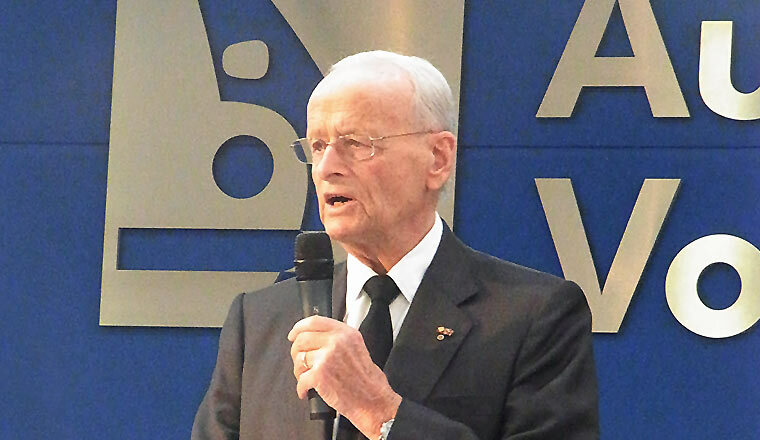 Hahn then served as CEO of Continental from 1972 to 1982, before returning to Volkswagen AG as Chairman of the Management Board, a position he held until 1993. During his time as Chairman, Hahn was responsible for the acquisitions of Seat and Skoda, the launch of profitable business operations in China and the establishment of Volkswagen Sachsen. 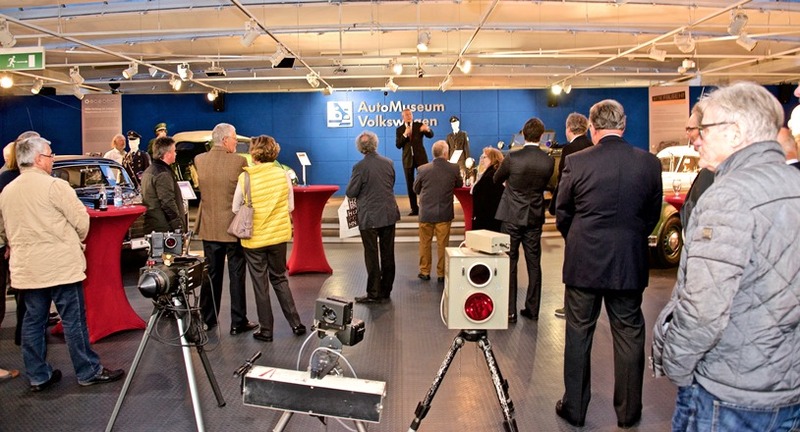 Hahn also initiated the launch of the AutoMuseum in 1985 and continues to support the museum to this day. We wish him all the best on his 90th birthday! 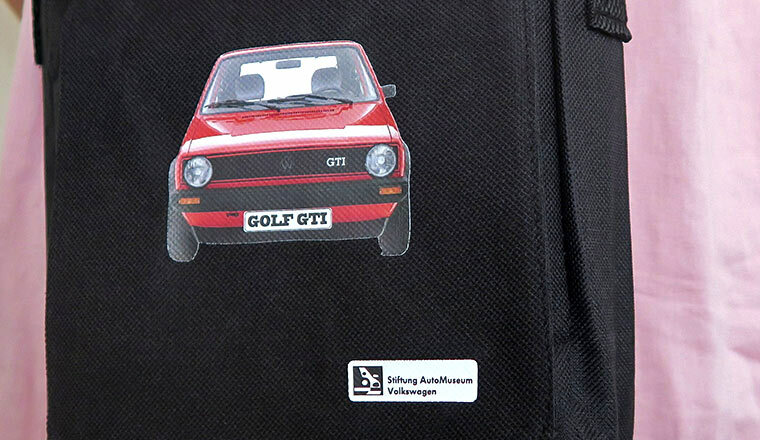 New: Exclusive Golf GTI shoulder bag now available. 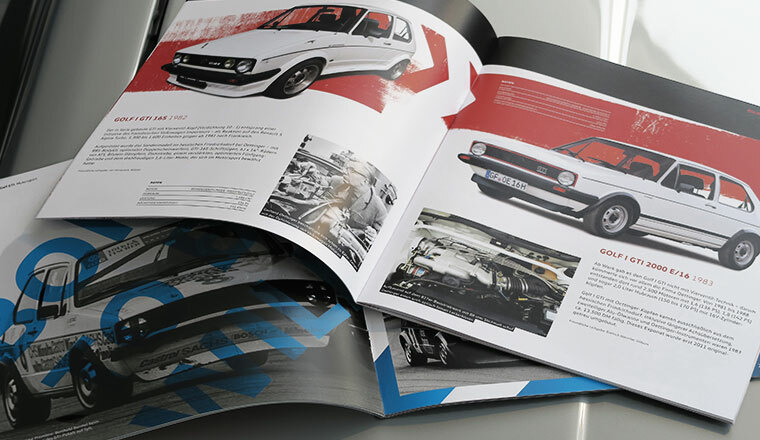 Golf GTI 40th anniversary brochure available. 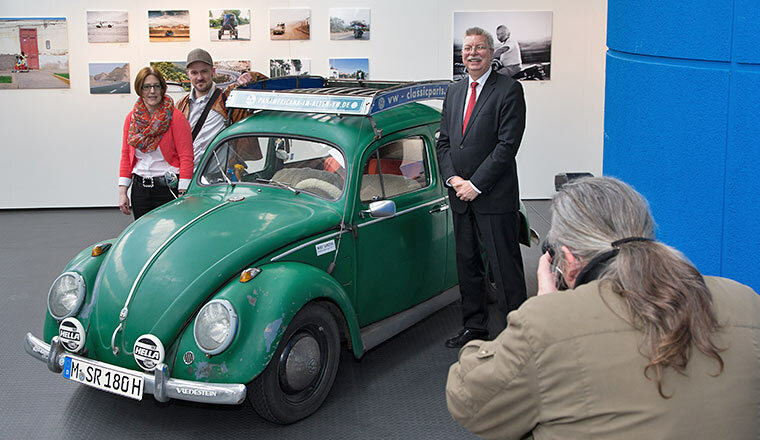 1955 Ovali Beetle joins legends at Leipzig Contemporary History Forum. 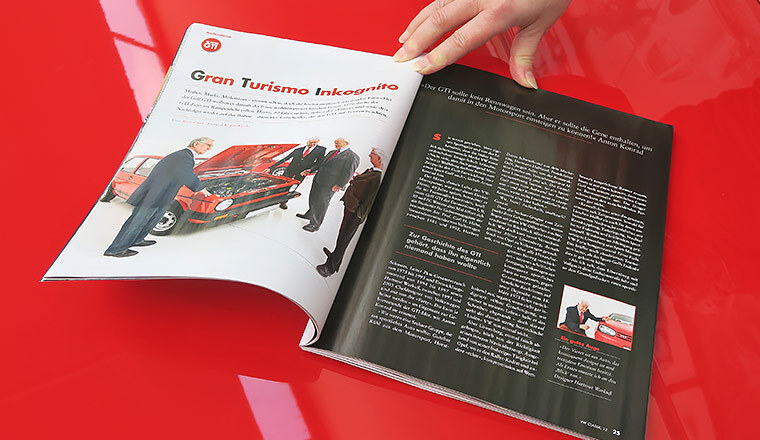 Pirelli GTI advertises special exhibition to mark the 40th GTI anniversary. 13 June 2016. 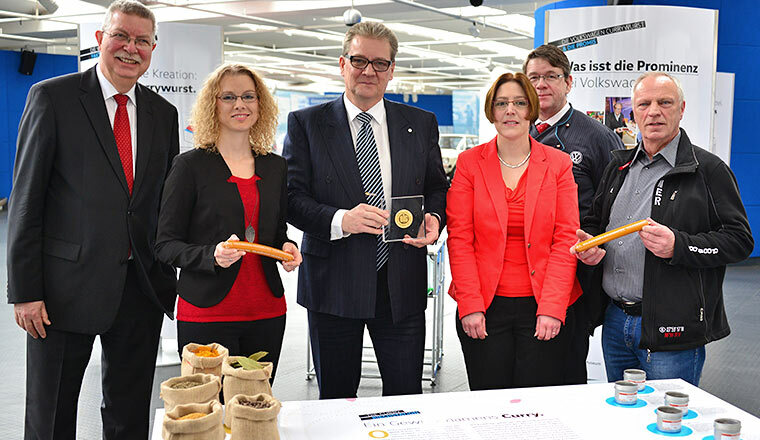 The high-rise administrative building at the Volkswagen plant in Wolfsburg now boasts a further attraction. 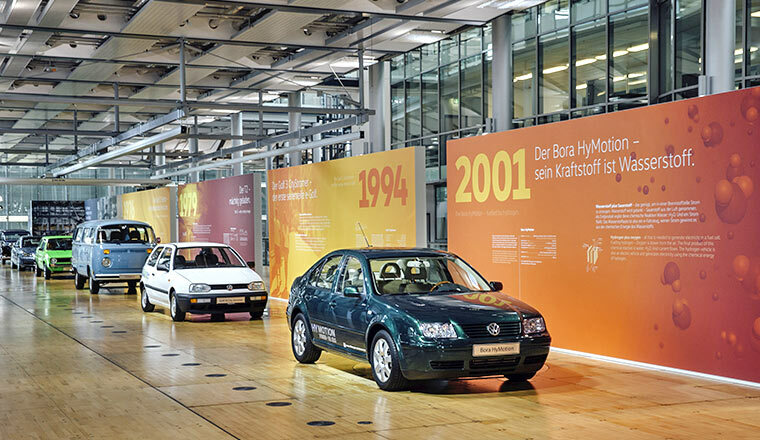 The Volkswagen AutoMuseum is advertising the special exhibition there “Strong performers. 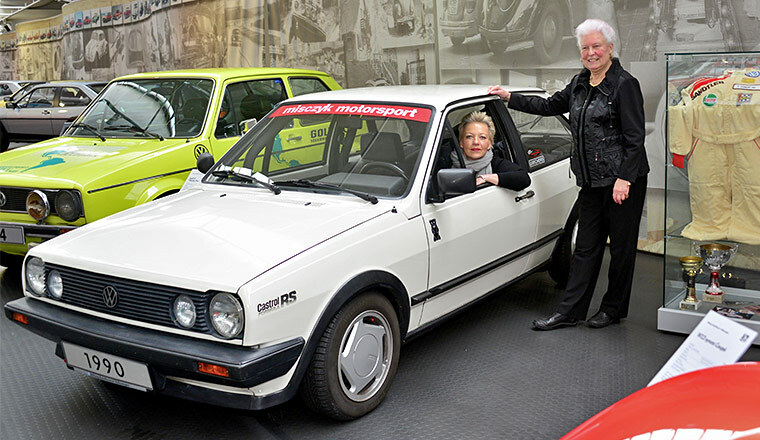 The Best of 40 Years of the GTI.” with its 1983 Golf GTI Pirelli. 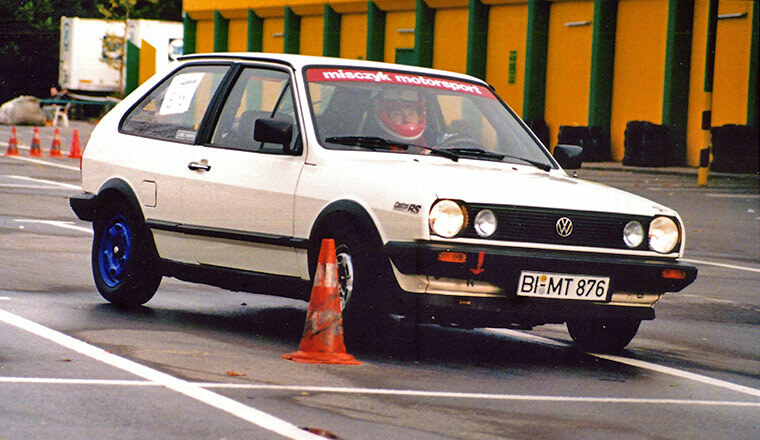 The Pirelli GTI was a special model that was sold in a limited edition of 10,500 vehicles shortly before the first GTI generation was discontinued. The car with the “P” in its rims was popular back then, and today it is a sought-after collector's item. 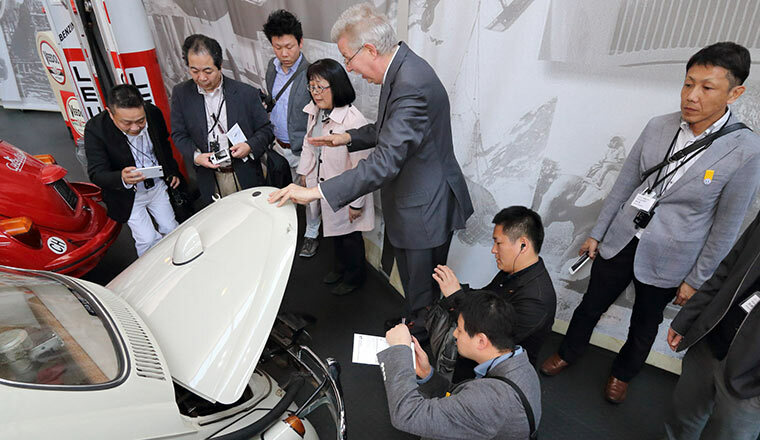 This is also demonstrated by the interest of the staff, who enjoy taking a close look at the car themselves. 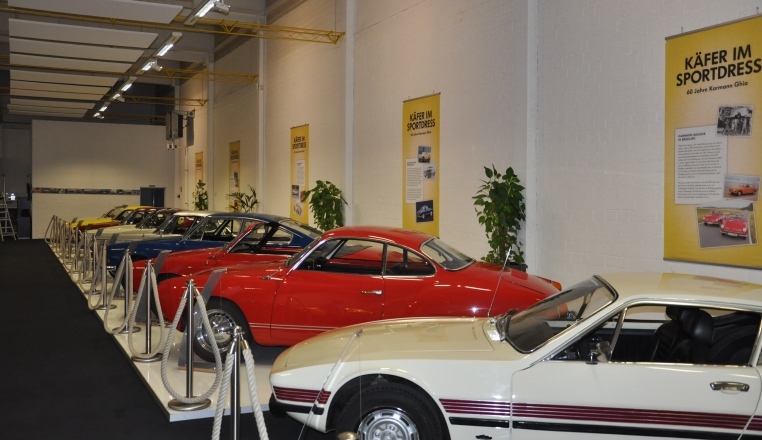 Exhibits in the GTI exhibition showcased by the magazine Classic Cars. 13 June 2016. The Golf GTI is of interest to both visitors to the Volkswagen AutoMuseum and media representatives. 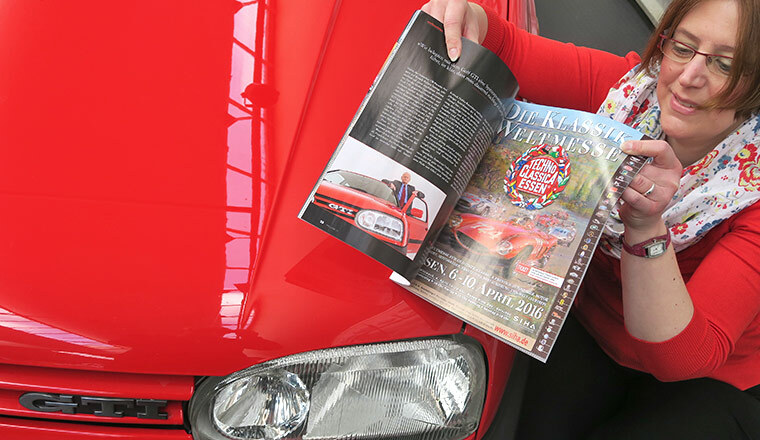 Editor Ingo Eiberg was therefore spoilt for choice when it came to choosing which of the (for the most part) rare exhibits in the special exhibition to mark the 40th birthday of the cult classic to profile for his article in the magazine Auto Zeitung/Classic Cars. The four Golf GTIs selected – the reconstruction of a 1975 prototype, the four-door 1977 Golf GTI from Giugiaro, a GTI 16s with four-valve technology and the legendary Pirelli GTI from 1983 – were skilfully showcased by photographer Klaus Huber-Abendroth. The article will be published in issue 9/16, which will be available from newsagents from August. As the final photo model the spotlight was on the EA 128 – a luxurious six-cylinder prototype designed for the US market in the 1960s. Its exciting story will be presented in issue 8/16. AutoMuseum's Golf GTI at the Ohre Classic. 11 June 2016. 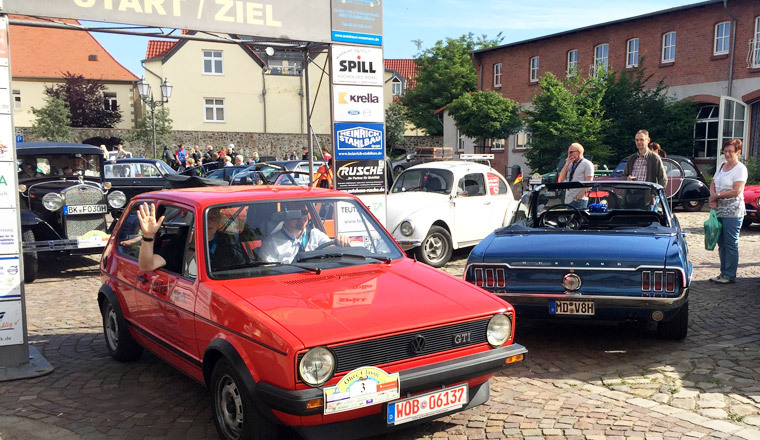 Now in its eighth year, the Ohre Classic attracted 130 classic pre- and post-war vehicles - including a Golf GTI from the AutoMuseum and other Volkswagen models. 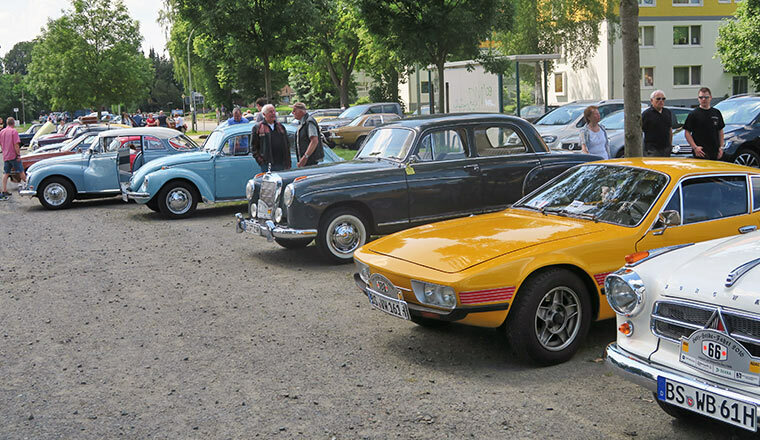 This year was the third time that the museum has taken part in the classic car drive around Magdeburg. 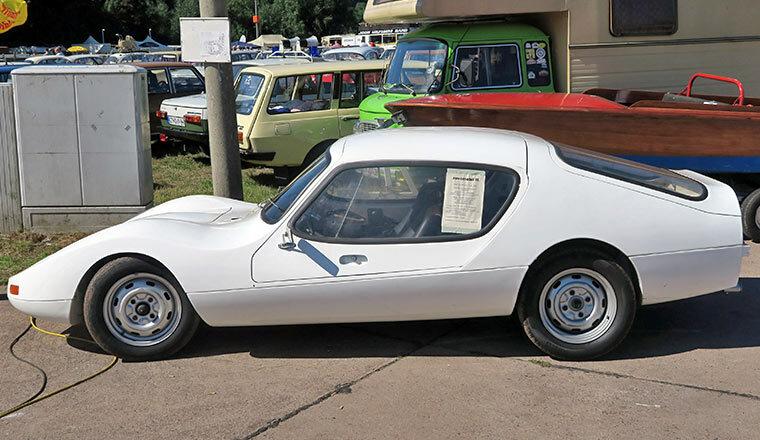 The 1978 Mars red compact sports car was driven by the Mayor of Wolmirstedt, Martin Stichnoth. 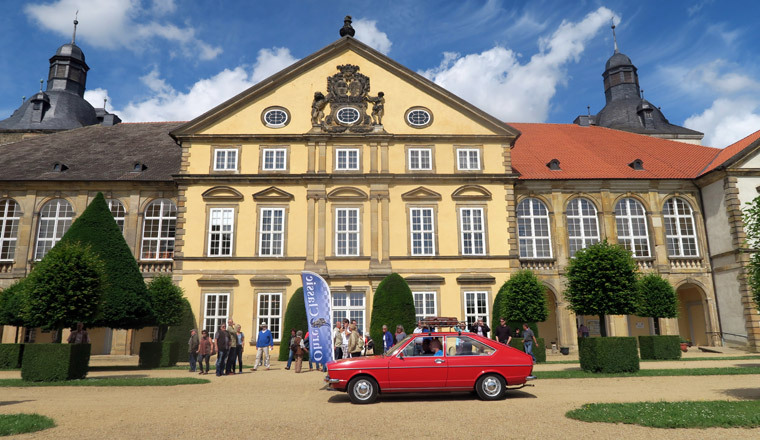 Around 150 km long, the route led via Haldensleben market square to the well worth seeing Baroque mansion in Hundisburg and on to Solepark Schönebeck. Its start and finish was at Wolmirstedt Castle. 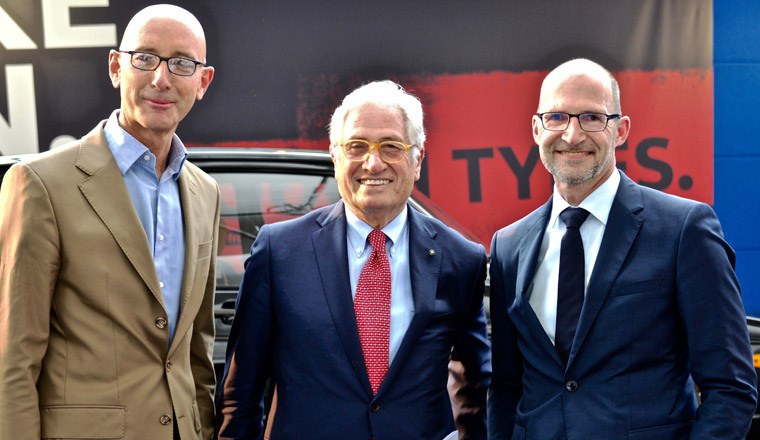 Star designer Giorgio Giugiaro opens “40 years of the GTI” at the AutoMuseum. 09 June 2016. 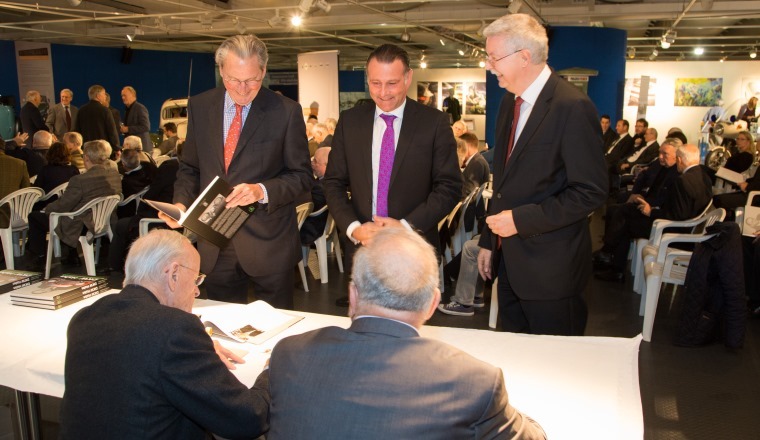 With an audience of around 100 invited guests Giorgio Giugiaro opened the special exhibition “Strong performers. 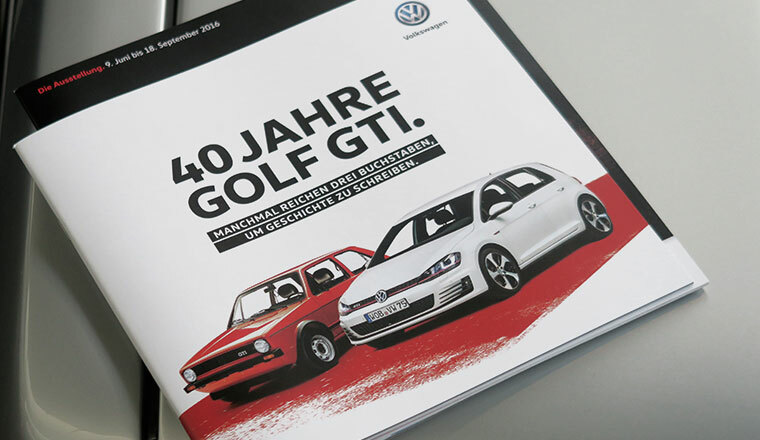 The Best of 40 Years of the GTI.” He animatedly described how he was commissioned to design the new Volkswagen model generation –Scirocco, Passat and of course, the Golf. 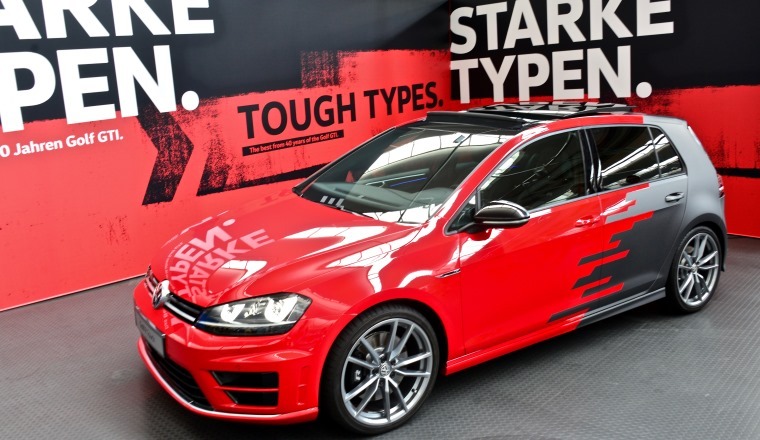 It was he who came up with the idea of the red stripes on the radiator grille of the later Golf GTI. 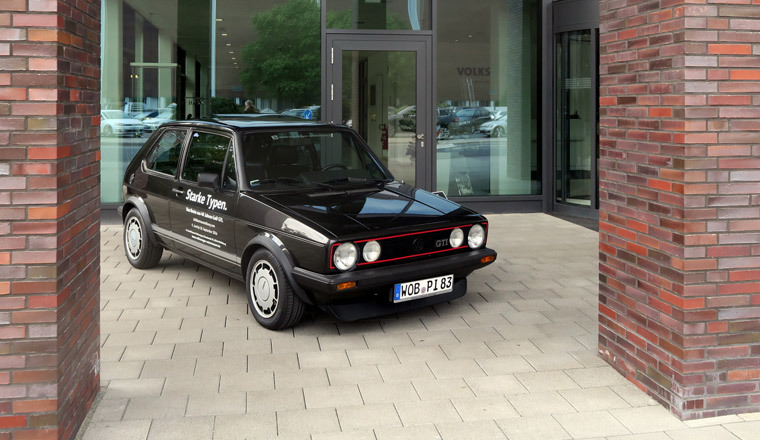 Giugiaro is proud that his four-door 1977 Golf GTI can be admired as a highlight on stage at the exhibition. 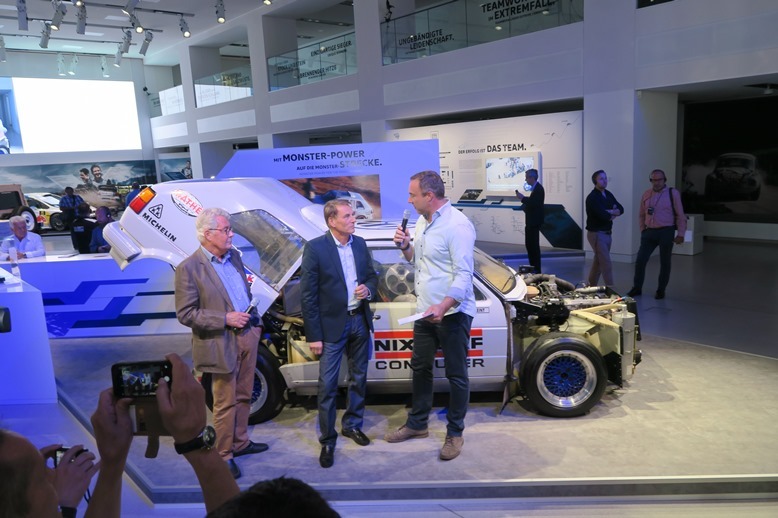 Further celebrities attending the evening event included Hans-Joachim Stuck, who explained in a humorous manner why in the 1970s he preferred the Golf GTI over other sporty cars. 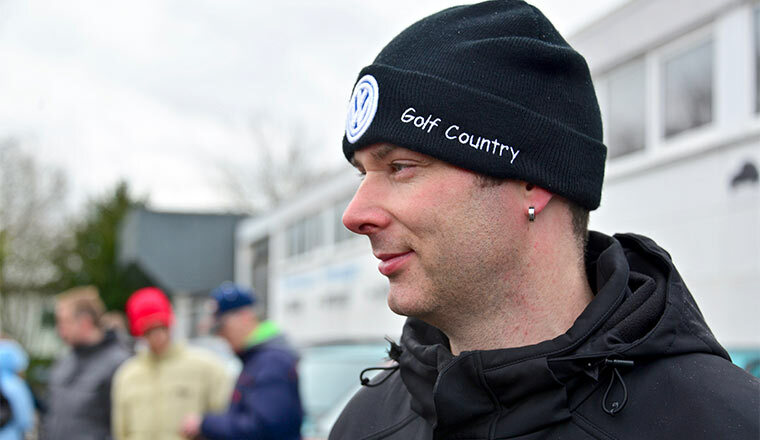 Anton Konrad and Herbert Schuster, two of the “makers” of the Golf GTI, talked with presenter Knut Simon about the winding path taken from the idea to the realisation of the Golf GTI. 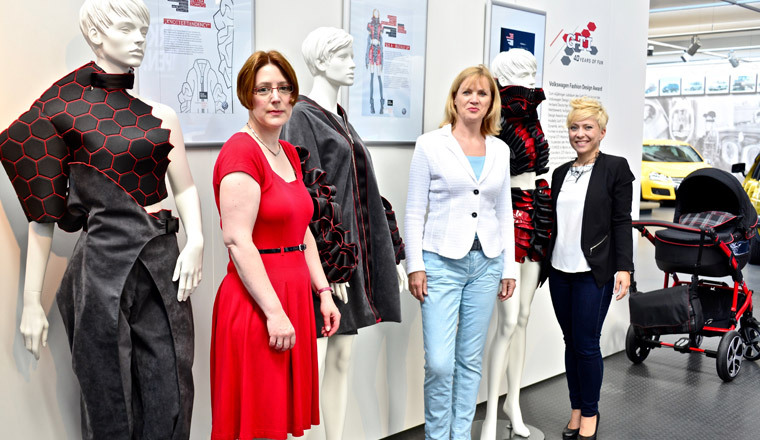 Friederike Plock-Girmann, Head of Volkswagen Design Lifestyle and Performance and initiator of the Volkswagen Fashion Design Award, built up suspense as she described the path from the first to the seventh GTI generation. A selection of costumes created from materials used in the current special model Golf GTI Clubsport went down very well with the guests. 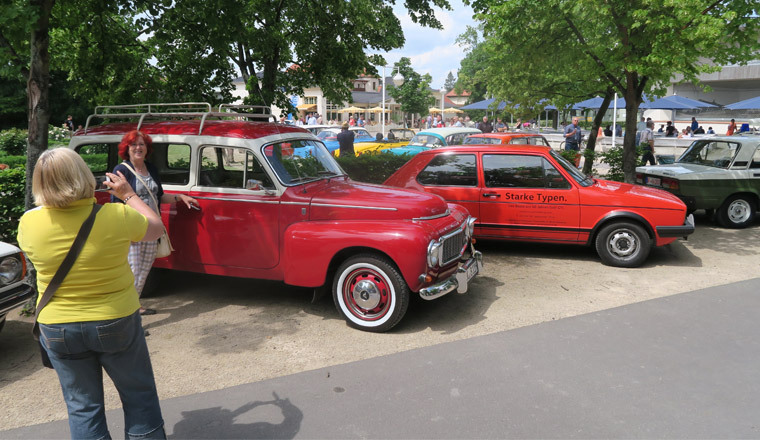 AutoMuseum at the Harz-Heide tour 2016. 05 June 2016. 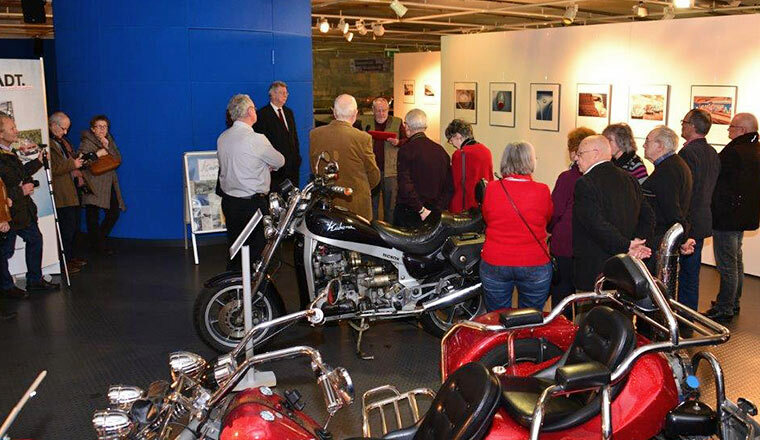 The AutoMuseum foundation has long supported the traditional tour that has taken place since 1990. 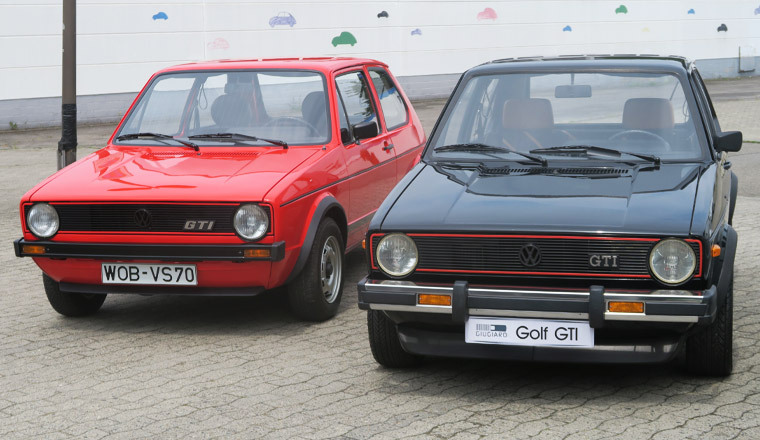 In view of the Golf GTI anniversary, this time two early models from the AutoMuseum took part – a 1978 model and a 1983 Pirelli Golf GTI. The technical details of these cars kept attracting the attention of the spectators and lots of photos were taken. The attractive 150 km route led from Braunschweig to Helmstedt and back, and even the locals got to see areas previously unfamiliar to them. 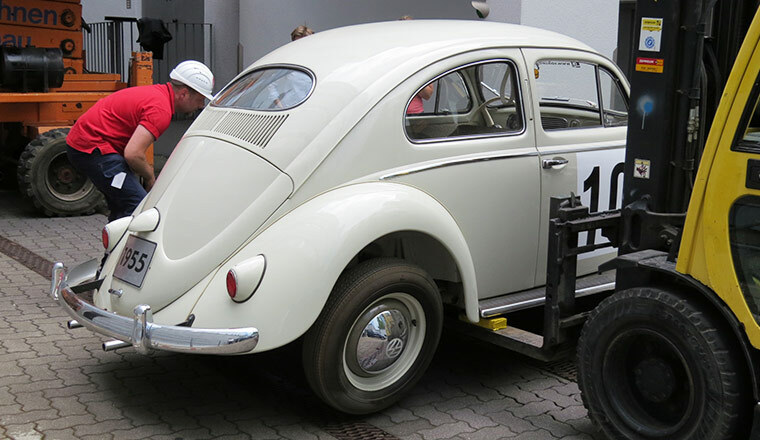 In addition to the GTIs from the AutoMuseum, the total of 140 two- and four-wheel vintage vehicles included a dozen further Volkswagens: eight Beetles, one type 3, a Karmann, an SP2 and an early second series Golf GTI with a two-valve engine. 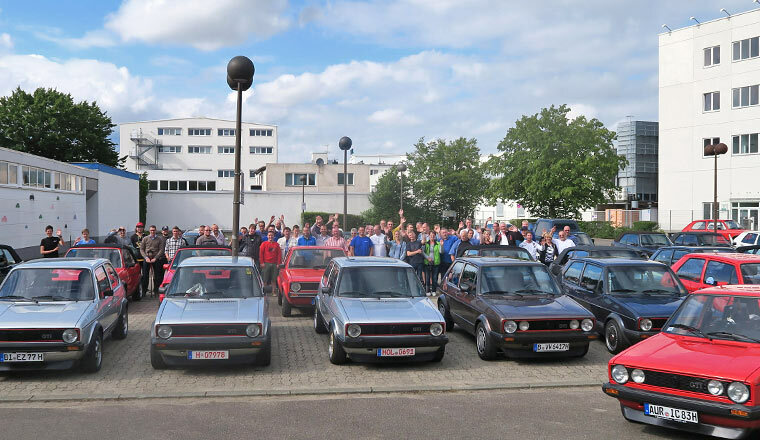 Golf GTI fan club visits the AutoMuseum and VW plant. 03 June 2016. 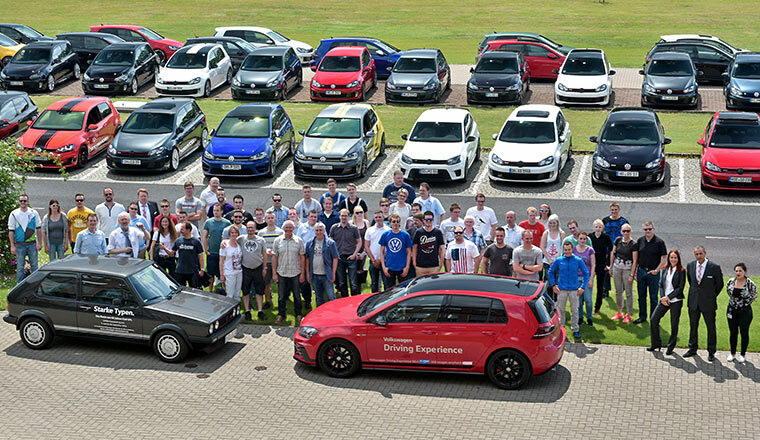 Shortly before the opening of the special GTI exhibition at the AutoMuseum, 60 members of the German GTI fan club came to Wolfsburg for their summer get-together. 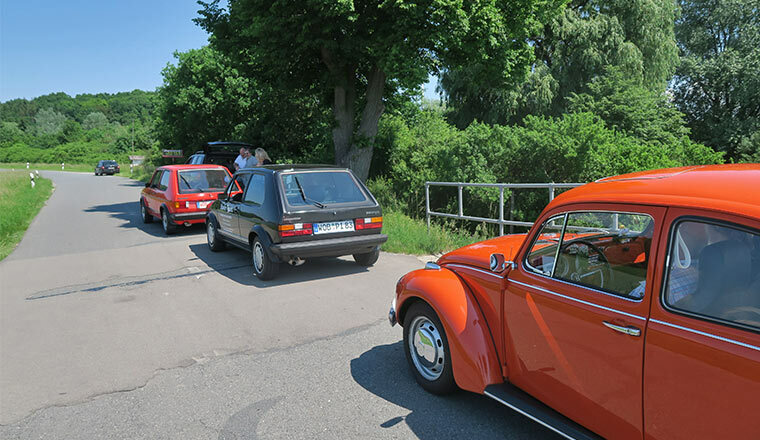 The GTI enthusiasts came from all over Germany – and some even from Austria – to celebrate the 40th anniversary of the cult car. 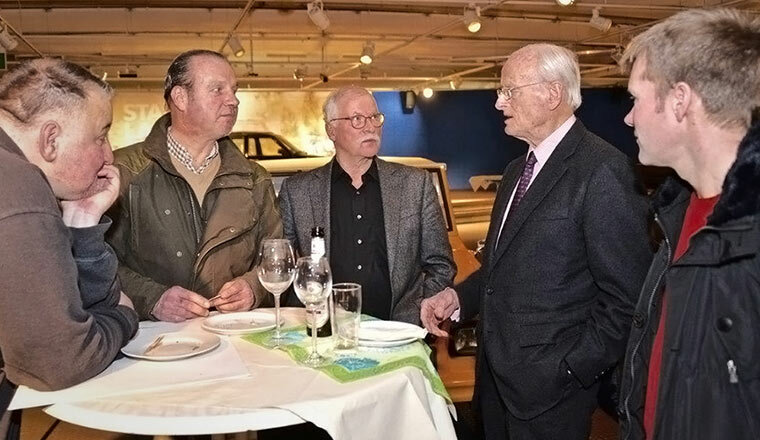 After a welcome by Eckberth von Witzleben and Dennis Vöste, the participants were offered a foretaste of the GTI exhibition, which is still being set up at the AutoMuseum. 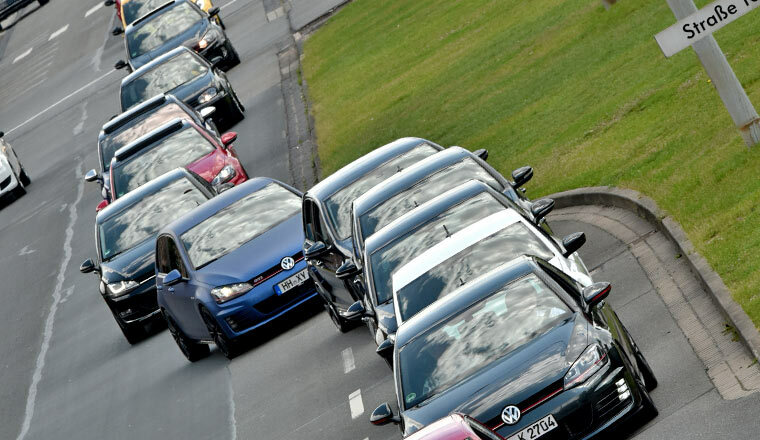 After this, 42 Golf GTIs drove to the VW plant in Wolfsburg in a convoy. 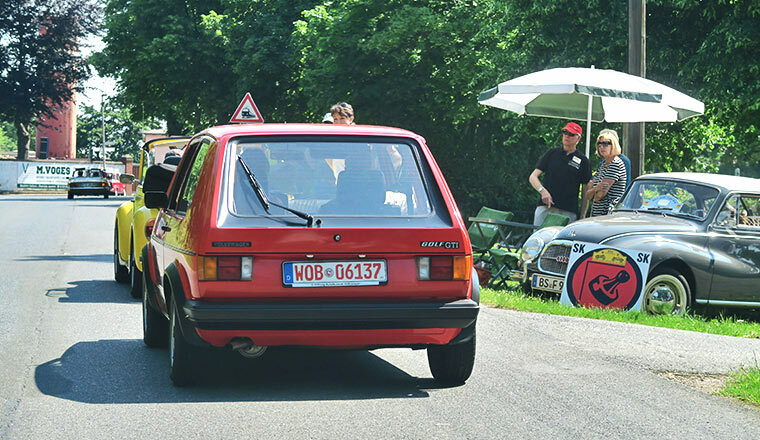 A highlight was a 1983 Pirelli Golf GTI from the museum's collection as one of the forebears of the participating vehicles, most of which came from the later model generations V to VII. Upon arrival at the plant interesting presentations about VW motorsport and a tour through the vehicle production were on the agenda. 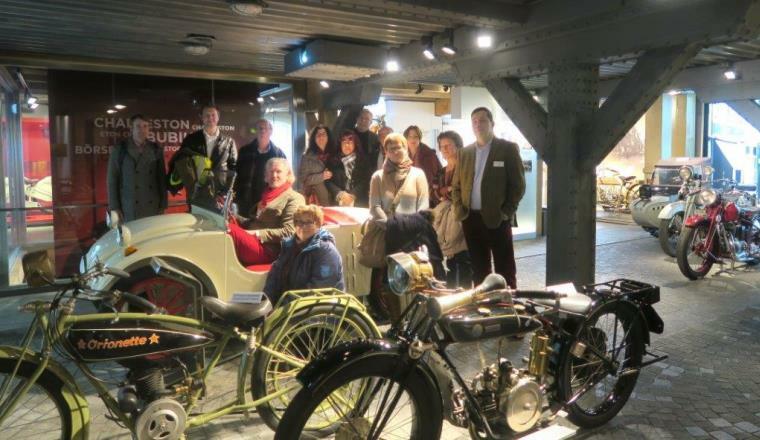 Vibrant supporting programme on Museum Day goes down well with visitors. 22 May 2016. 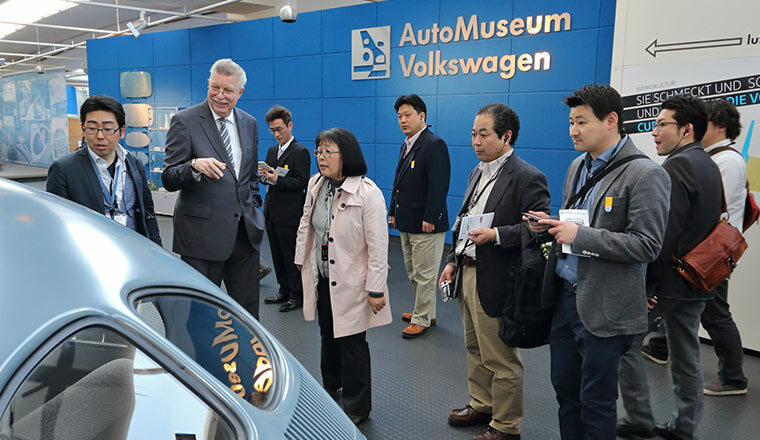 There was lots happening on International Museum Day in and around the Volkswagen AutoMuseum. 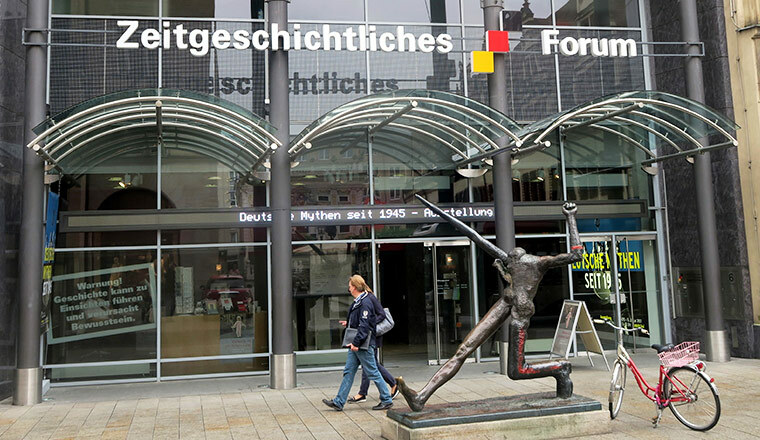 The Berlin Theatre Company - without any rehearsal - not only had the listeners gripped, but they were also able to call out and determine the progress of the Currywurst-based story themselves. 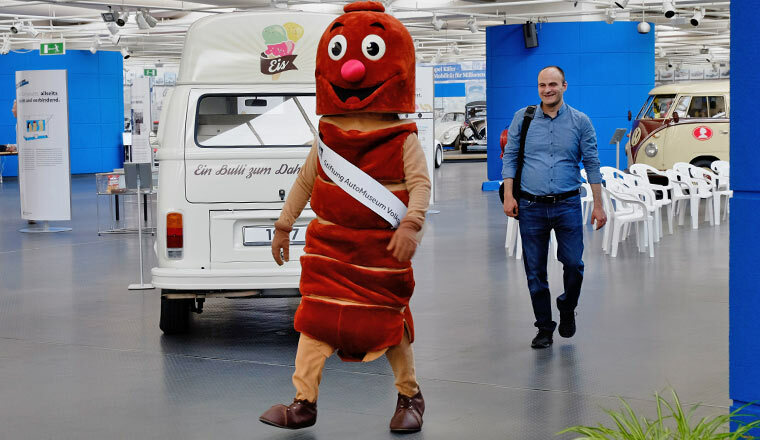 QWoo, the mascot of the German Currywurst Museum in Berlin was thrilled by every visitor who had their photograph taken with him. 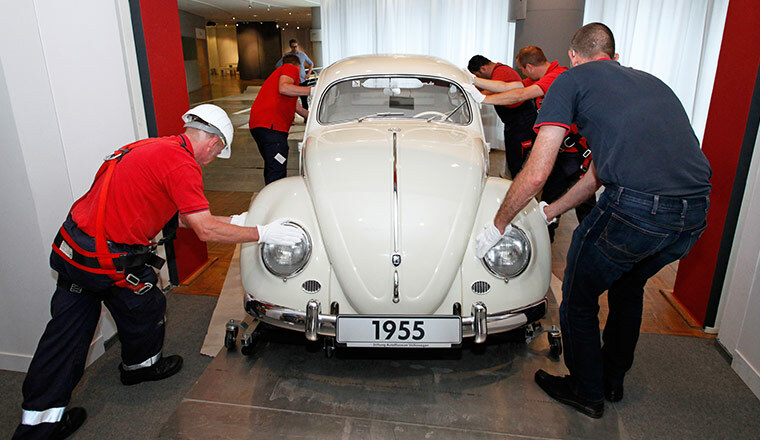 Something that the two employees of the Volkswagen Service Factory were not going to miss out on! Before and after their short break for the camera they served visitors the delicious Volkswagen Currywurst. 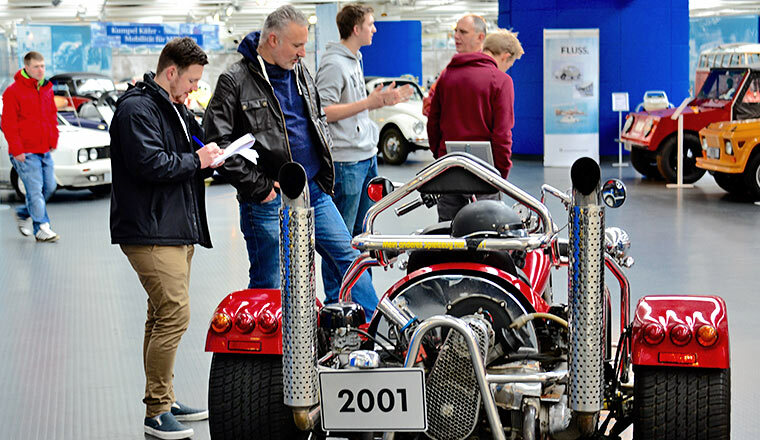 Thanks go to everyone involved, who made visiting the AutoMuseum an unforgettable event. 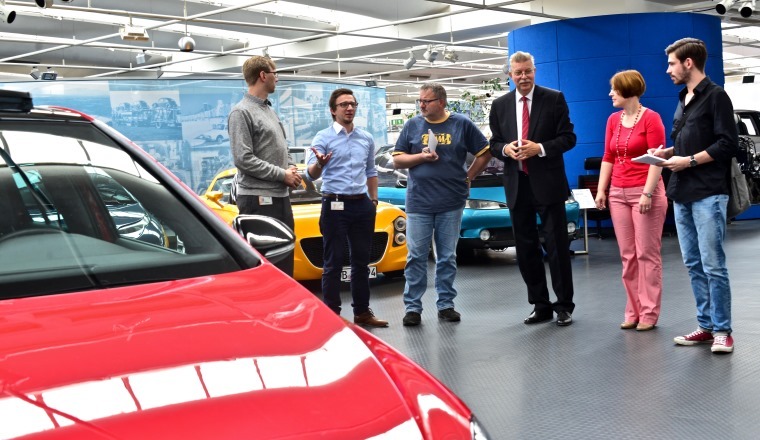 Staff from the Lada factory in Togliatti visit the AutoMuseum. 12 May 2016. 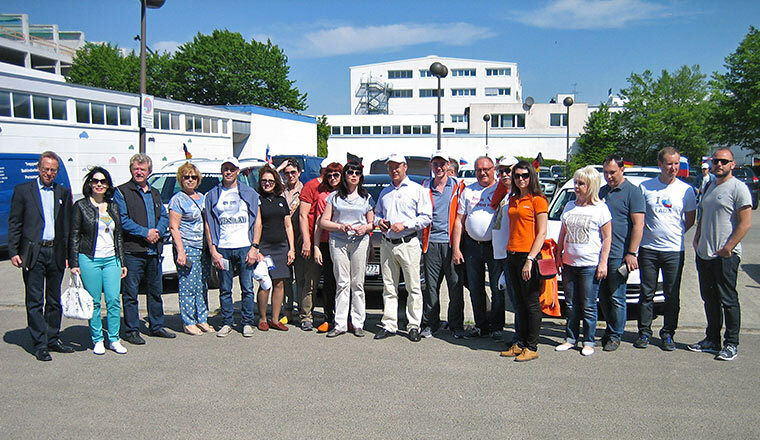 To mark 25 years of partnership, the City of Wolfsburg had invited employees of the Lada factory in Togliatti, Russia, to pay a visit. 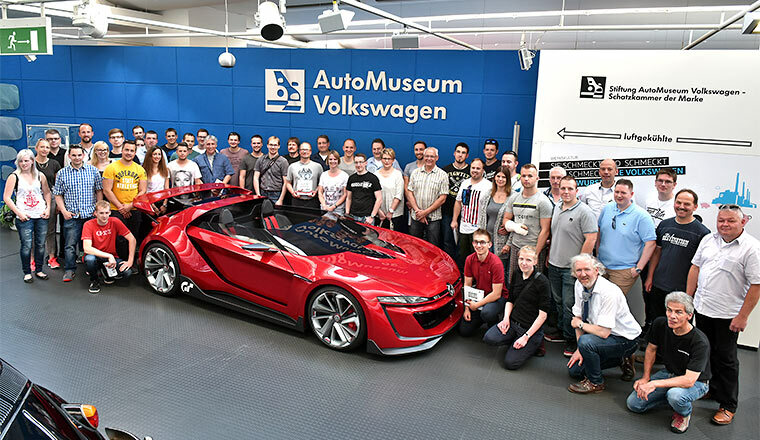 The participants, around 30 in number, made the drive to Wolfsburg in current models from their product portfolio. 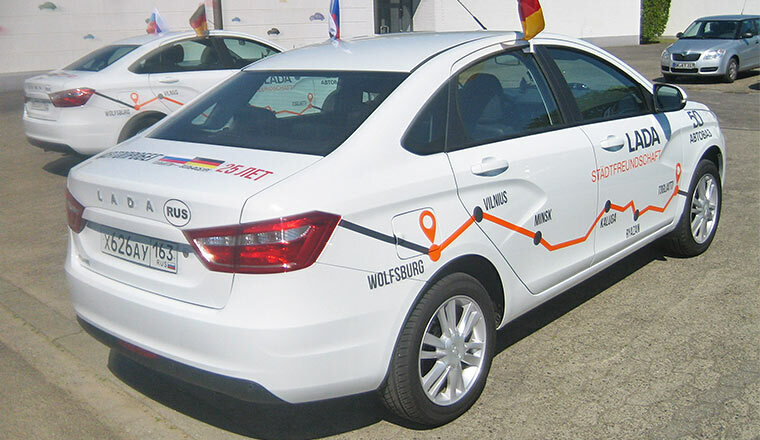 The route covered around 3,800 kilometres and took them via the Russian Volkswagen site of Kaluga and Vilnius in Lithuania. 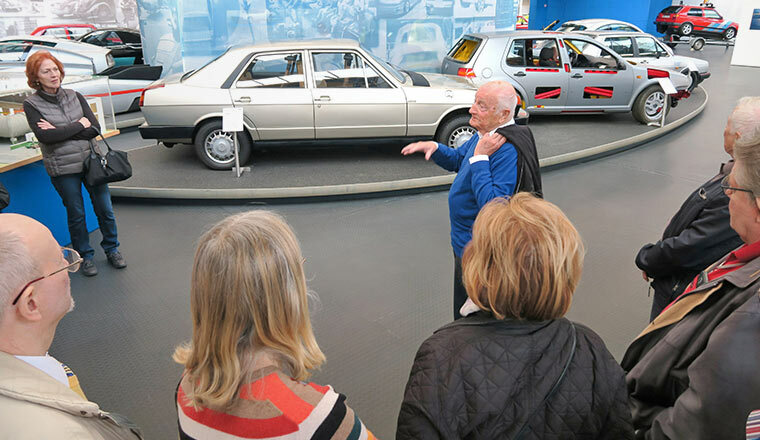 Once in Wolfsburg, the participants had the opportunity to visit the Volkswagen AutoMuseum and were duly impressed by its historic vehicles. 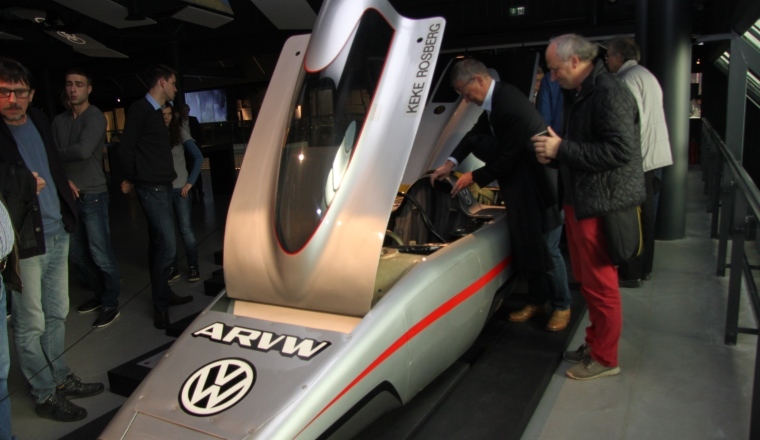 Following a subsequent visit to the Autostadt and an address by the Mayor of the City of Wolfsburg, they set off on their return journey. Peru Evening in the AutoMuseum. 3 May 2016. 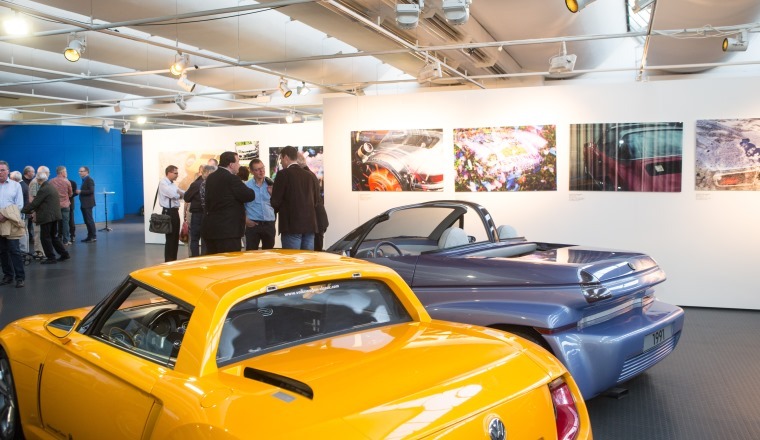 Staged as part of the 'Panamericana and much more' photo exhibition, the exclusive presentation of impressive pictures from along and beside this legendary road was attended by around 30 guests. 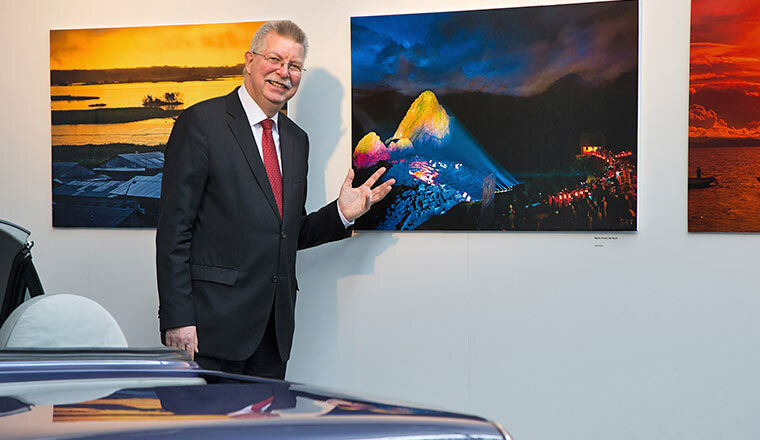 Peru's Consul General, Ernesto Pinto-Bazurco Rittler, made a special journey up from Munich to welcome the visitors and suggest they pay a visit to his home country – Peru, after all, does offer astonishing geographic diversity including lakes and oceans, the Nazca Desert and the Amazonas. 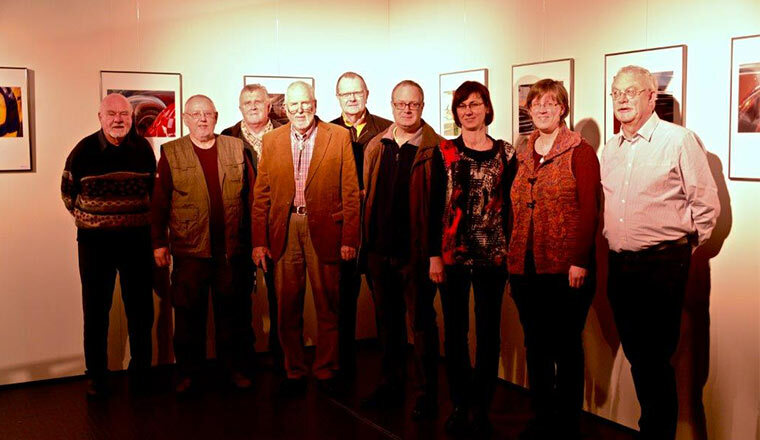 Wolfsburg Photographic Club members in attendance were especially thrilled by the perspectives and angles that the pictures gave on a previously rather little known country. 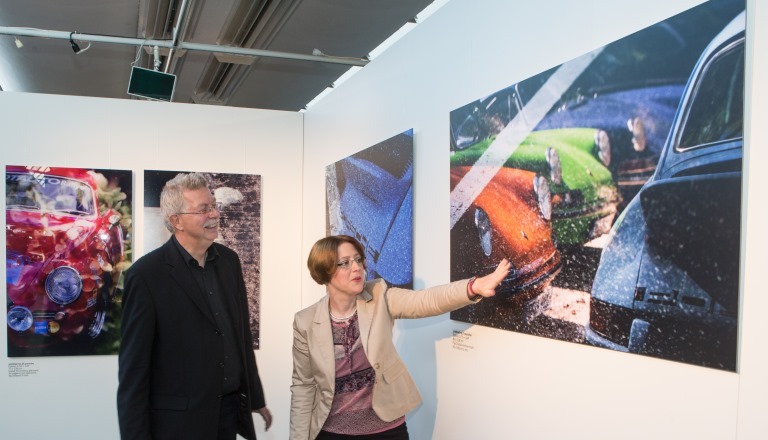 Representatives of Volkswagen AG enjoying the photographs included designer Frederike Plock-Girmann and Head of Group Communications, Hans Gerd Bode. The exhibition runs until 22 May 2016. 21 April 2016. 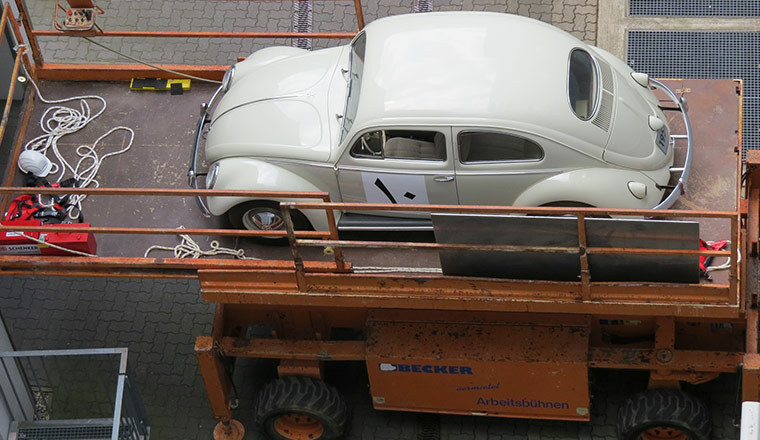 Theo Decker in Essen ('TDE') was one of the best-known Beetle tuners. He began speeding up Beetles at the end of the 1950s and his automobile creations remain to this day some of the most fascinating air-cooled cars. Typical modifications included his twin and dual carburettor conversion kits, hotter camshafts and optimised pistons, where he, of course, always did the work on the cylinder heads himself. He also wrote books on making Beetles faster and rendered outstanding service to the Formula Vee scene. 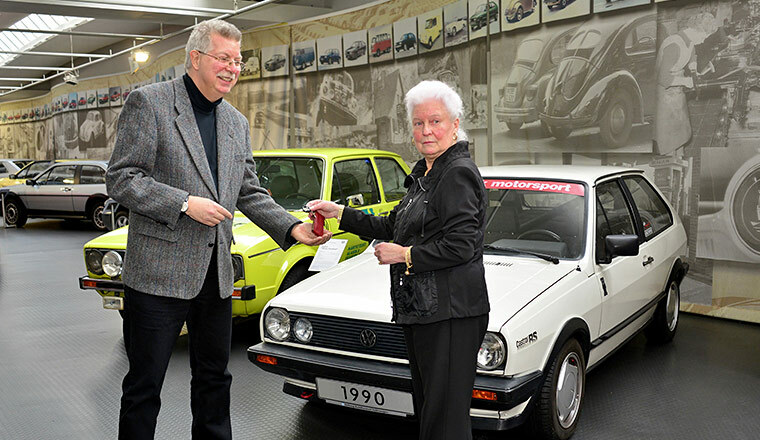 Theo Decker, who along with his wife Isolde was one of the AutoMuseum's most loyal friends, died aged 82 on 21 April. 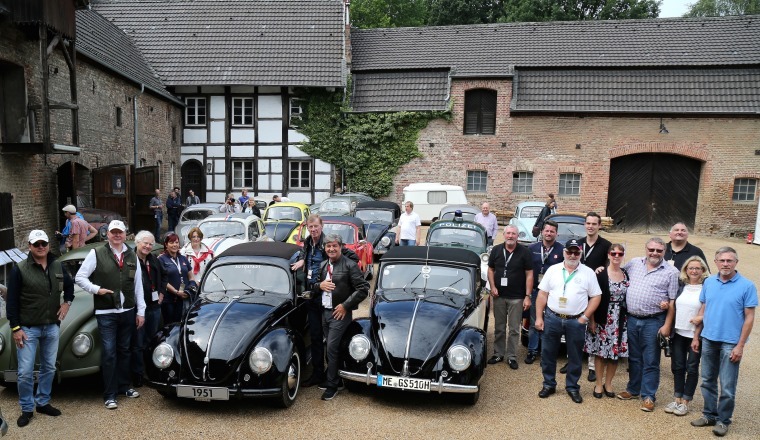 Our colleagues at Volkswagen Classic exhibited a 1302 Beetle with black mourning ribbon in his honour at the May Beetle Meet in Hannover. 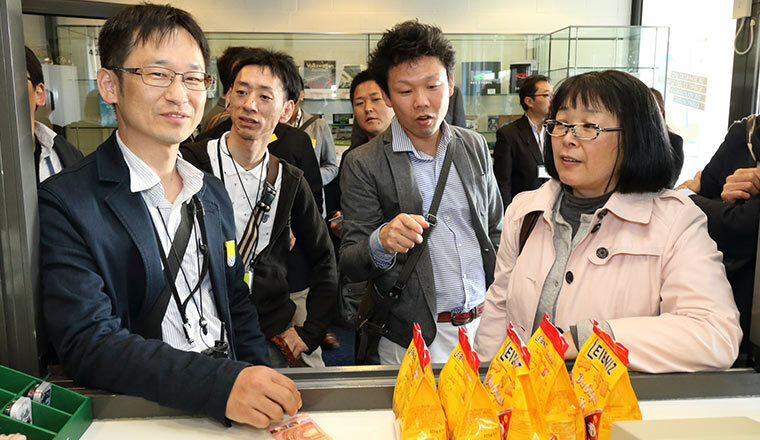 Japanese dealers at the AutoMuseum. 20 April 2016. 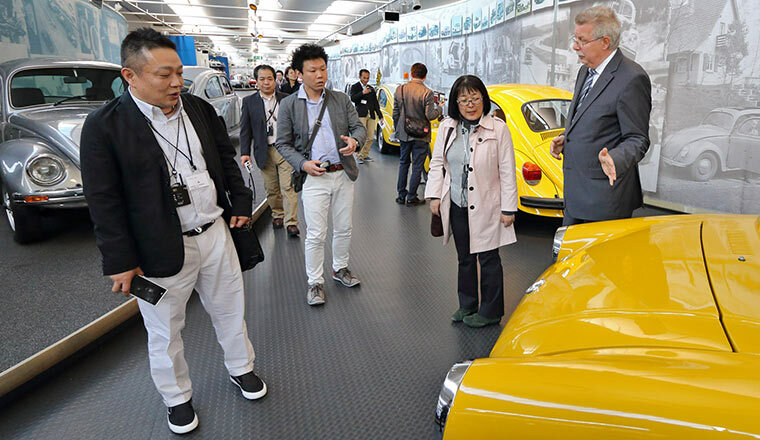 A group of around 40 sales executives from Japanese Volkswagen dealerships visited the brand museum in Wolfsburg. 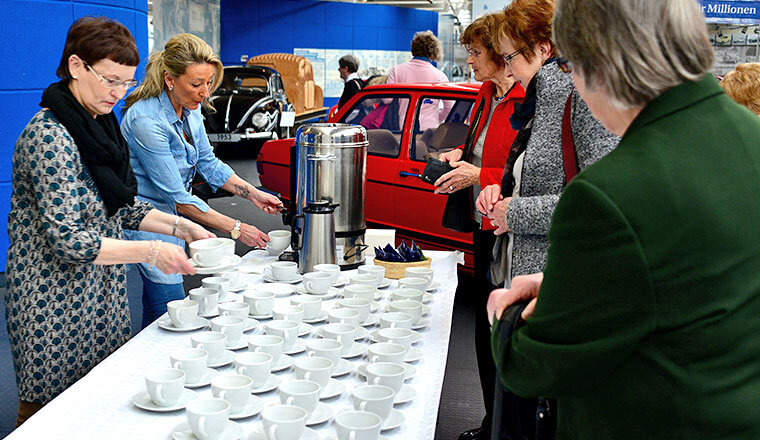 Thirsty for knowledge, the visitors really enjoyed their foray back into early Volkswagen history. 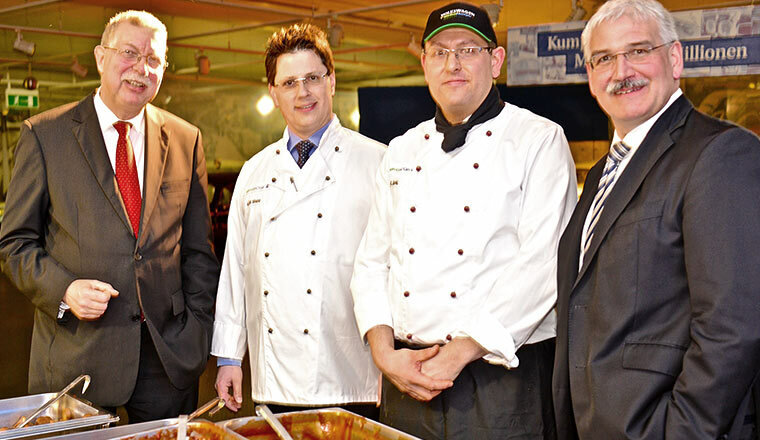 Amphibious Beetles, a Fridolin and Herbie were all of great interest to them, as was the special Currywurst exhibition. 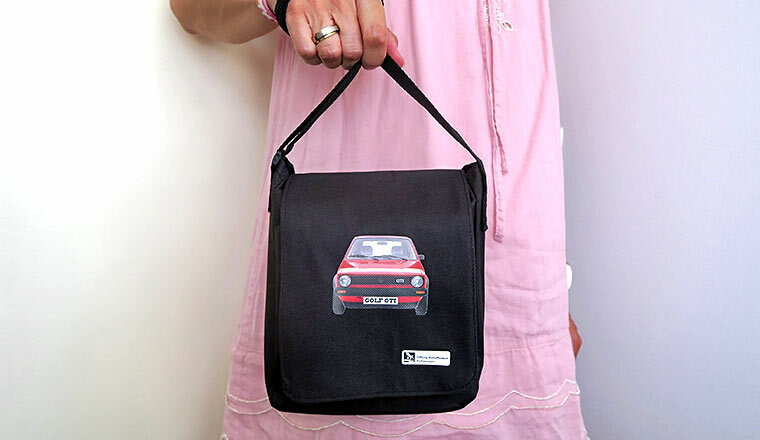 The AutoMuseum's shop has seldom been so busy – literally every visitor stocked up on all sorts of paraphernalia and souvenirs. 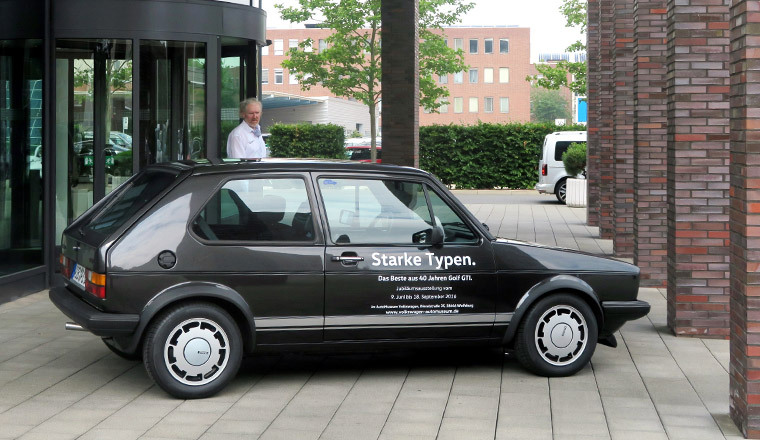 New Wiking-brand model of the “Golf GTI” goes on sale. 15 April 2016. 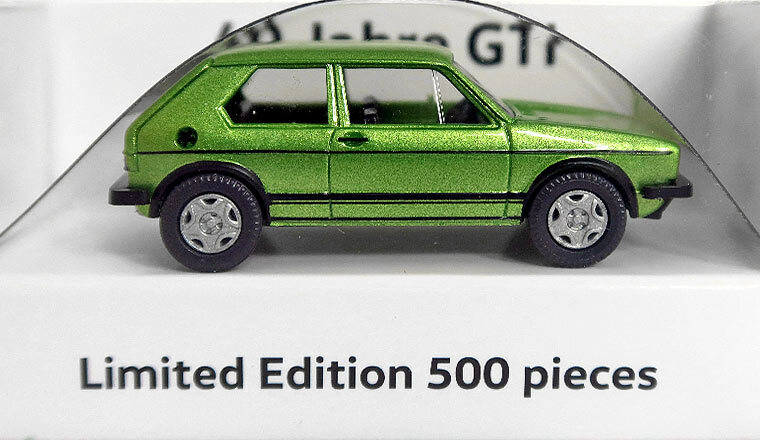 Once again this year, Volkswagen Classic is offering a Wiking-brand model, 1:87 scale, for sale on the occasion of the Techno Classica car show. 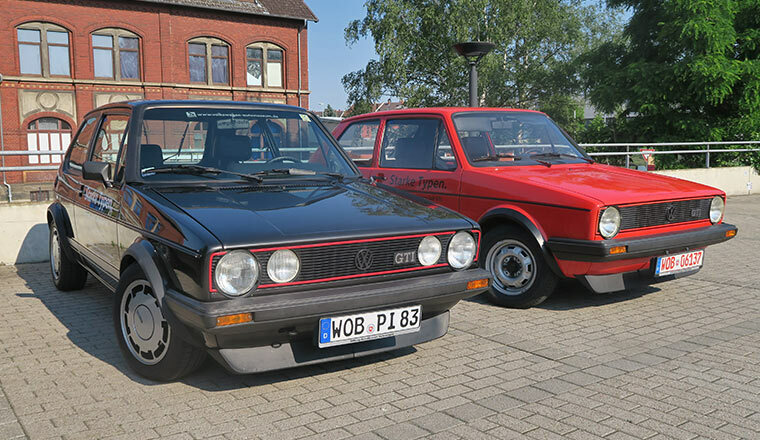 It is the ultimate classic among compact sports cars: the first generation Golf GTI on the occasion of its 40th anniversary. The model is available from the Volkswagen AutoMuseum in diamond silver or viper green metallic colour. 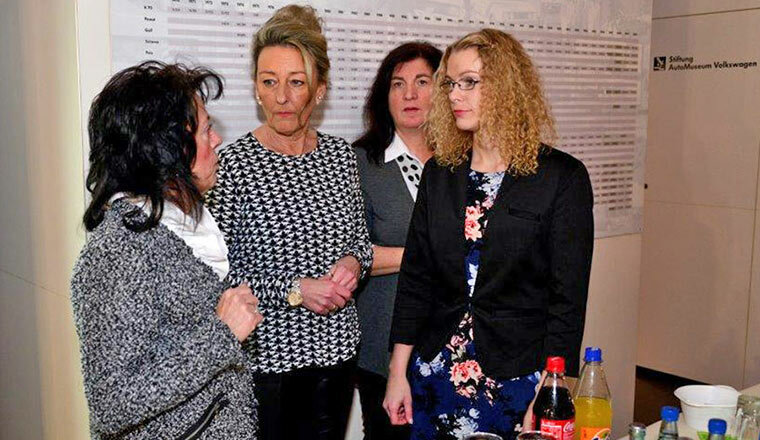 Its production is being limited to 500 units at a sale price of €17.90 – as long as supplies last. Upon request, we can ship this product to you after prepayment including shipping costs. 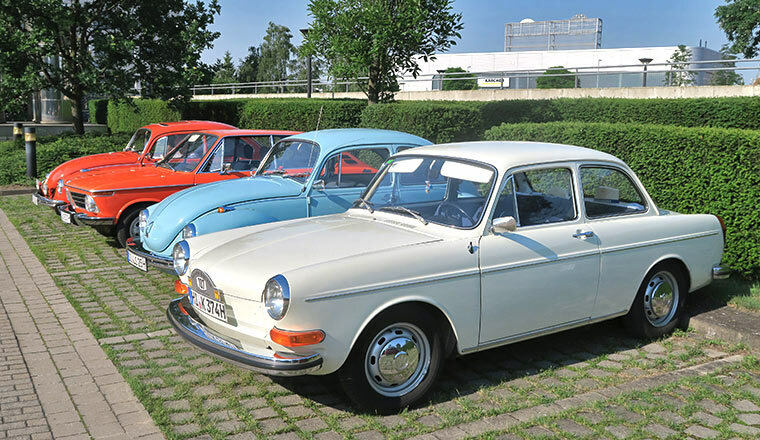 If you are interested in this model, please contact us at: info@automuseum-volkswagen.de. Technicians worthy of merit visit the AutoMuseum. 10 April 2016. 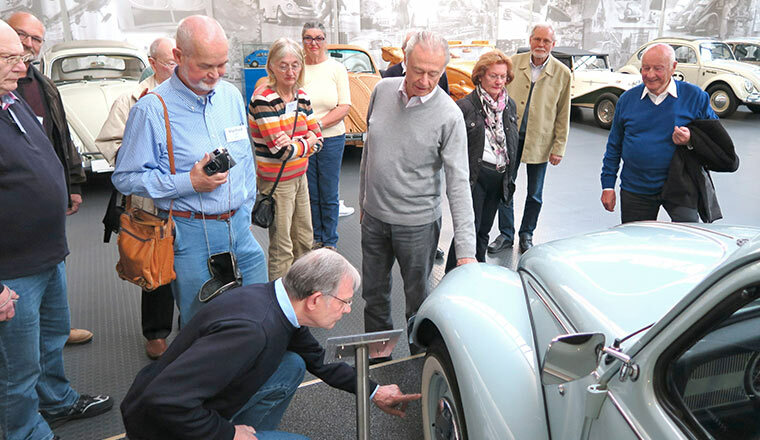 Professor Fiala and his former assistants and students visited the AutoMuseum for this year's ATB (TU Berlin Graduates) meeting, where the group of 30 got to grips with the historic technology material on a 90-minute special tour. 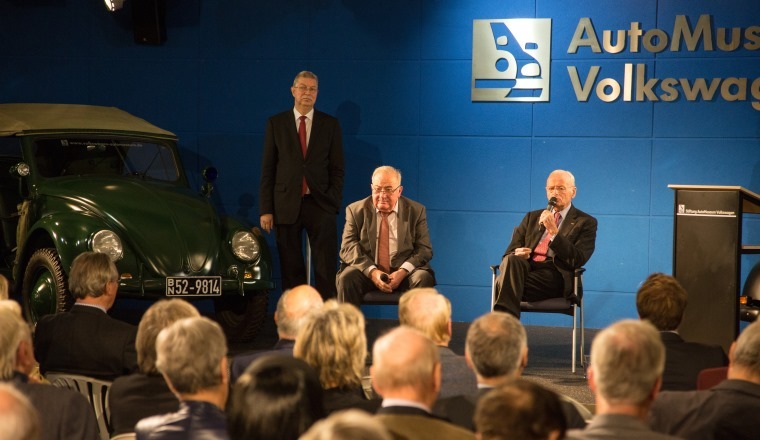 Ernst Fiala, who was Head of Research and Development at Volkswagen from 1973 to 1988, remembered countless events which he related with humour and spontaneity. For instance how he banished the chrome VW Beetle logo for cost reasons, but then put a lot of effort into the ESVW 1 which was so successful that Audi wanted to have it as their 100 C2 successor. That a bitter injustice was done to the K70, which stood no chance against the rivalries between Neckarsulm and Wolfsburg/Salzgitter. Or how he made the all-wheel “Bulli” VW minibus palatable to VW CEO Schmücker by letting a British competing product fall by the wayside. He considered the introduction of the Golf 1, which launched the modern automobile age at Volkswagen, to have been his most important achievement. Loan exhibitions from the AutoMuseum to the Transparent Factory. 8 April 2016. 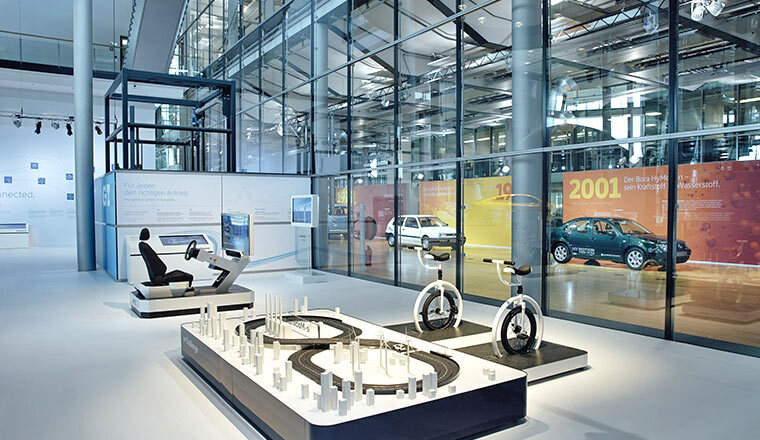 The "showcase for electric mobility and digitalisation" experience can be currently seen in the Transparent Factory (Die Gläserne Manufaktur) in Dresden. Interested visitors get an insight into the future of the automobile and at the same time are taken on a journey through the innovative drive concepts of the Volkswagen of yesterday, today and tomorrow, culminating in the Sports Coupé Concept GTE, a sports car concept design with plug-in hybrid technology. 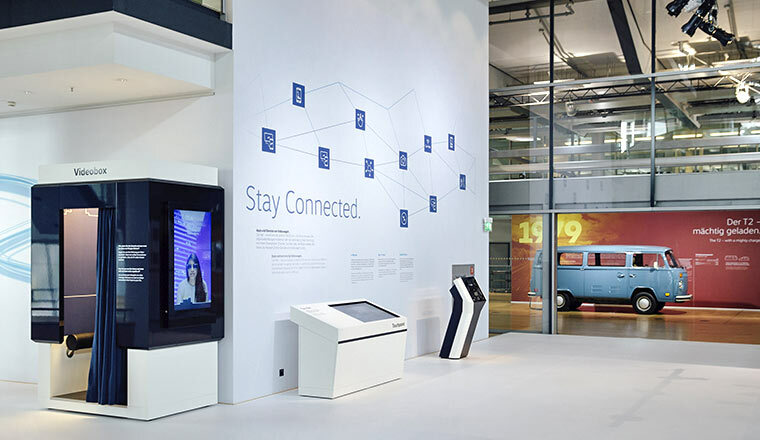 The AutoMuseum Volkswagen is supporting the exhibition with a first generation e-Golf and a Bora HyMotion with hydrogen-powered fuel cell drive. 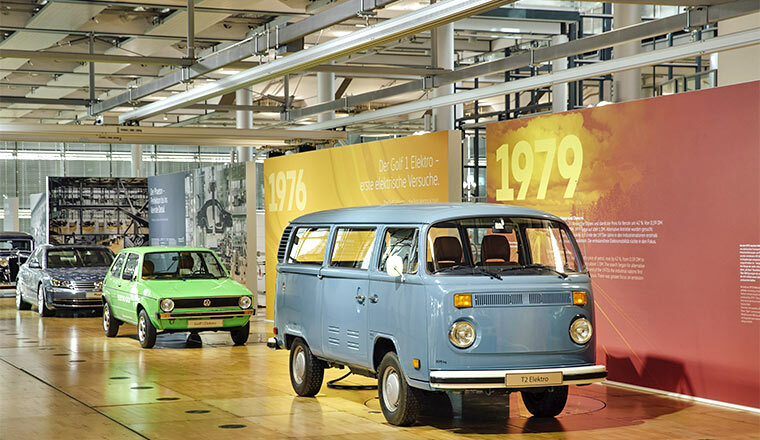 Also on show is a T2a VW bus with electric drive, which was previously exhibited at the AutoMuseum. For more information visit www.glaesernemanufaktur.de. 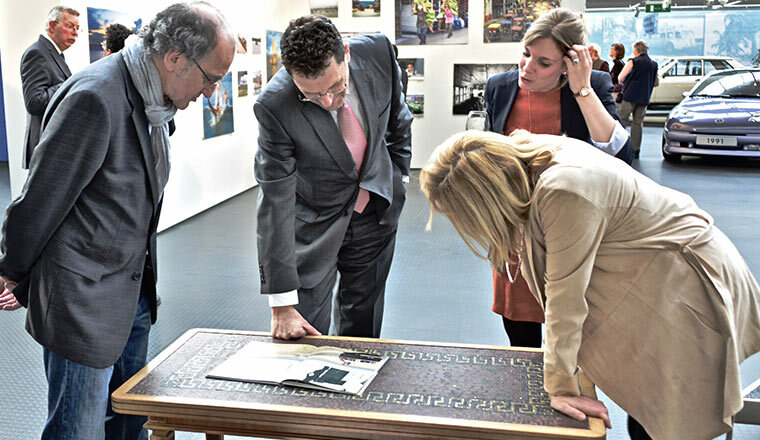 "Panamericana and much more" photo exhibition opens. 22 March 2016. 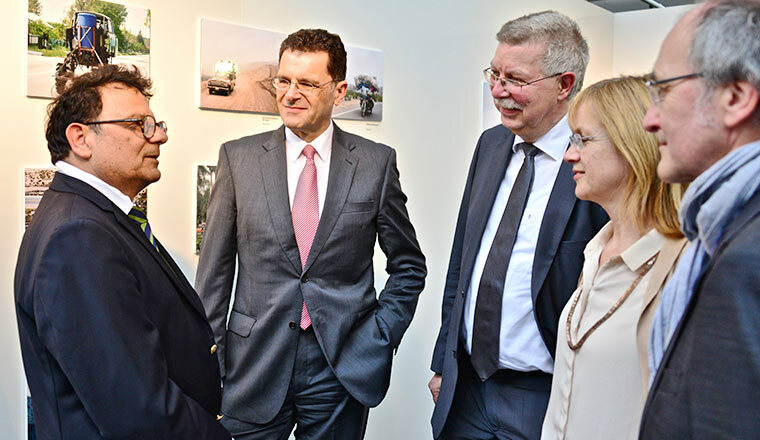 Eberhard Kittler and Susanne Wiersch opened the third exhibition of the MobilArt series with a press conference. The 70 or so photos describe life in and around the Peruvian part of the most famous street in the world – the Panamericana. The works of Marco Schwarzer, a freelance cameraman, are extremely impressive. In 2009 he accompanied and filmed two young Germans during their trip along this legendary road with their green Beetle – lovingly named "pea" (complete with quintessential "Rheumaklappe" ventilation flap). Schwarzer knows much of what the photographer's eye has captured from his own experience – such as the annual festivities at Machu Picchu by night. Excerpts of the film, as well as the "pea" itself, can be seen in the AutoMuseum. 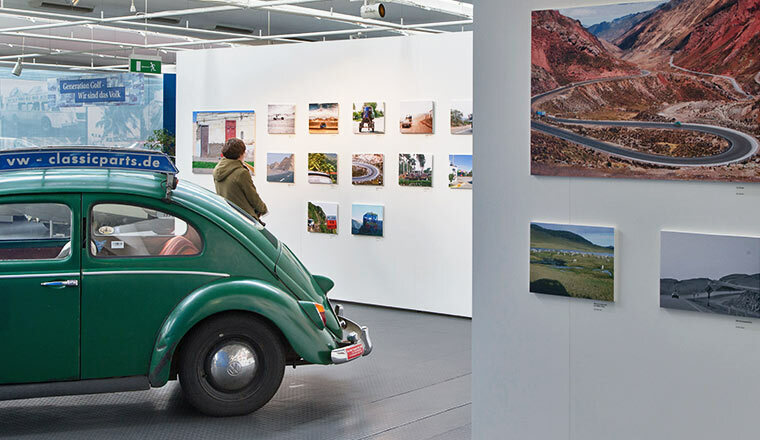 The photo exhibition is the personal initiative of the Peruvian Consul General, who will be visiting the Volkswagen AutoMuseum at the end of April. 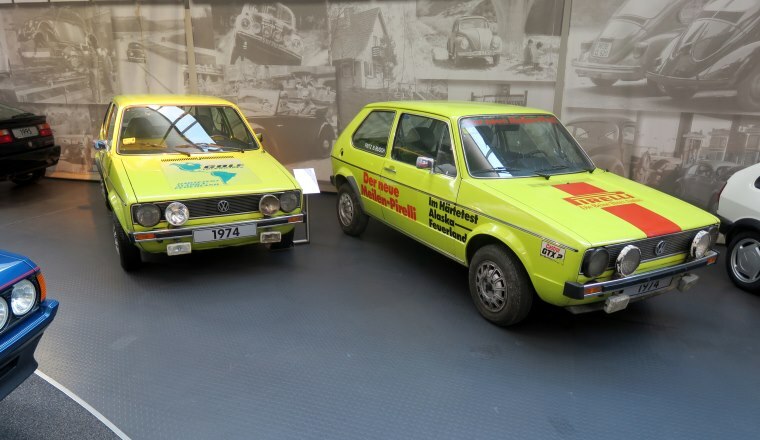 A car from the permanent exhibition will boost the theme – the yellow 1974 Golf I which Fritz B. Busch drove the entire length of the then 30,000 km long Panamericana. 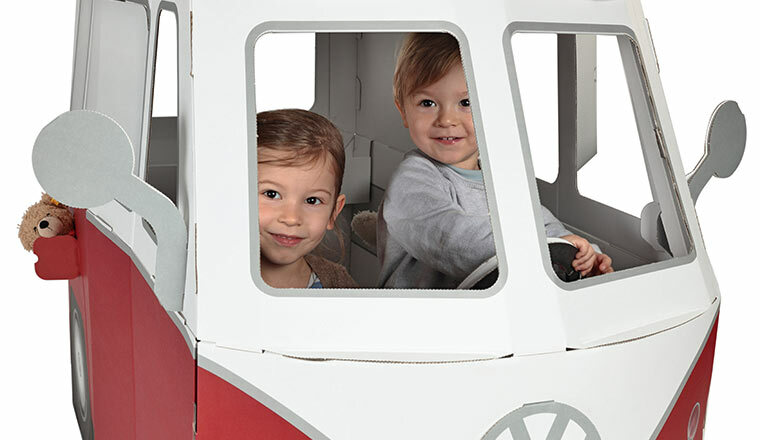 Fun and games on the "Bulli" VW bus for the little ones. 24 March 2016. 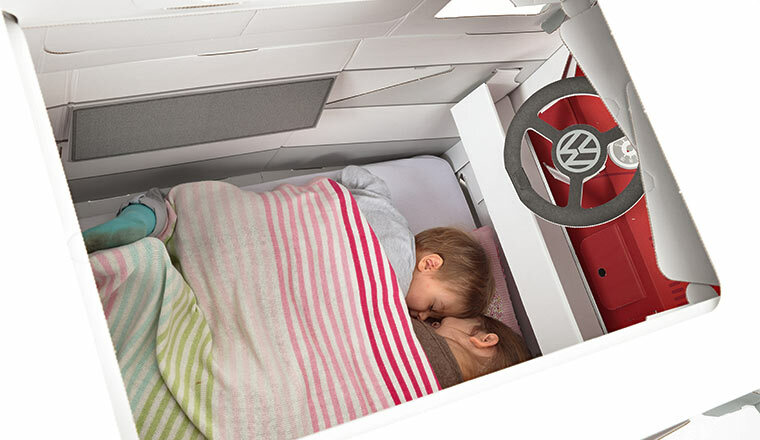 Young children (aged 2 to 7) can now go on a long trip – with a "Kampini" bus measuring about 1.40 m in length by Kick-Pack GmbH in Braunschweig. 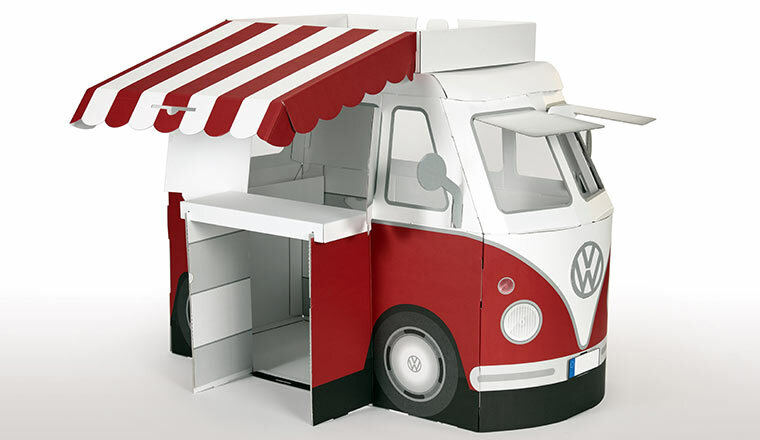 The smart Volkswagen Bulli made of sturdy cardboard is easily assembled and lets children’s' imagination run wild: whether as a mobile grocery store, ice cream van or puppet theatre, this robust bus is extremely versatile. 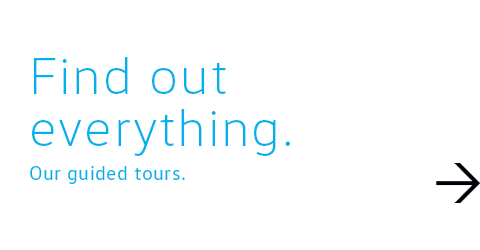 And it offers even more: the "cave" inside invites tots to have a nap and hide secret things. 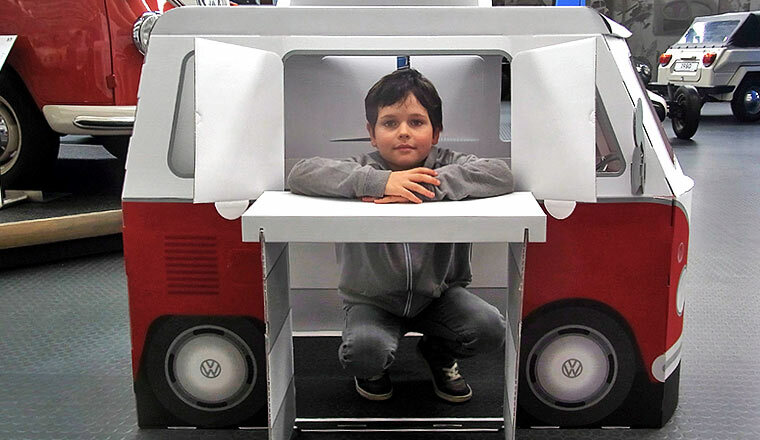 Made from 100 per cent renewable resources, "Kampini" is available in the AutoMuseum Volkswagen shop for € 69.90. Can also be shipped upon request (shipping costs charged extra). 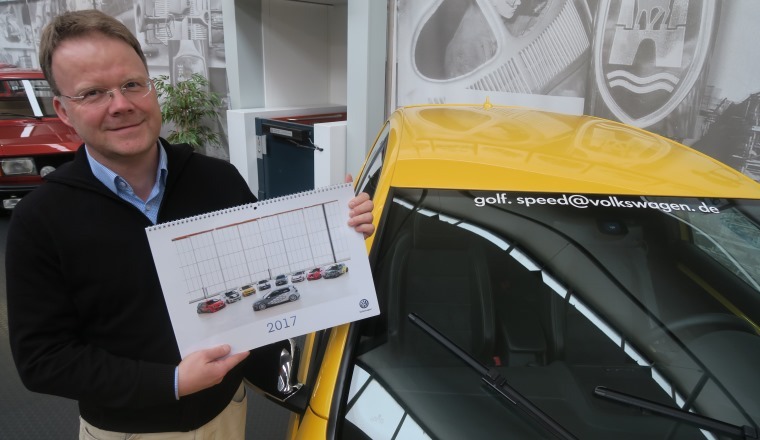 GTI anniversary story featuring a Golf from the AutoMuseum. 16 March 2016. 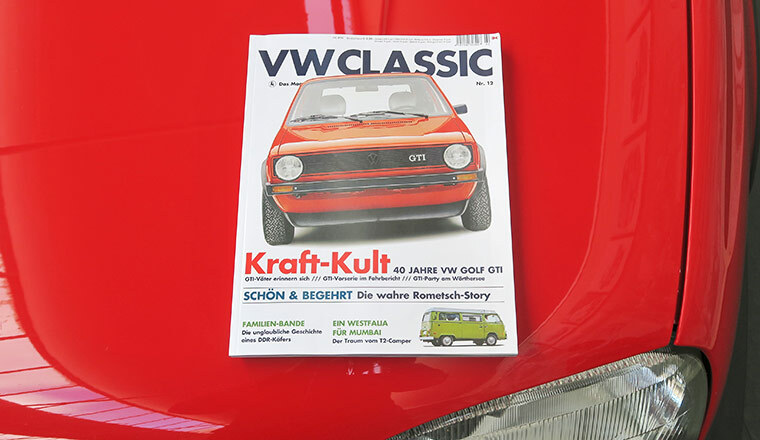 What is probably the best story relating to the Golf's 40th anniversary appears in the brand new 'VW Classic' magazine, available from newsagents from today for €6.90. 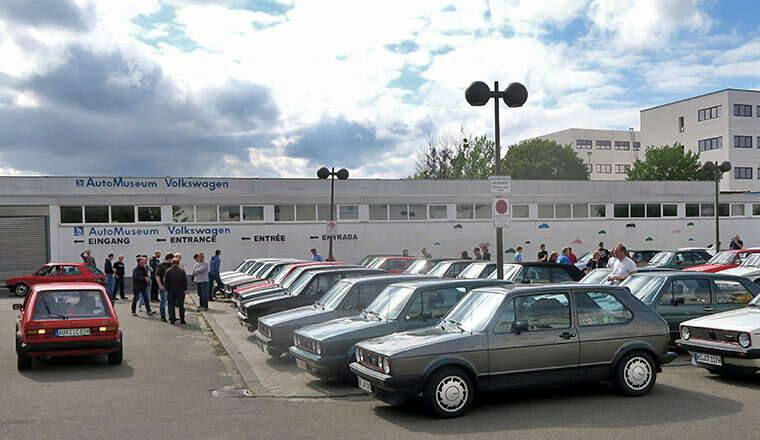 For the nine-page, very wittily written article by Knut Simon several GTIs of the first four generations gathered in the Autostadt vehicle depot – including the AutoMuseum's Golf Mk3 GTI Edition. 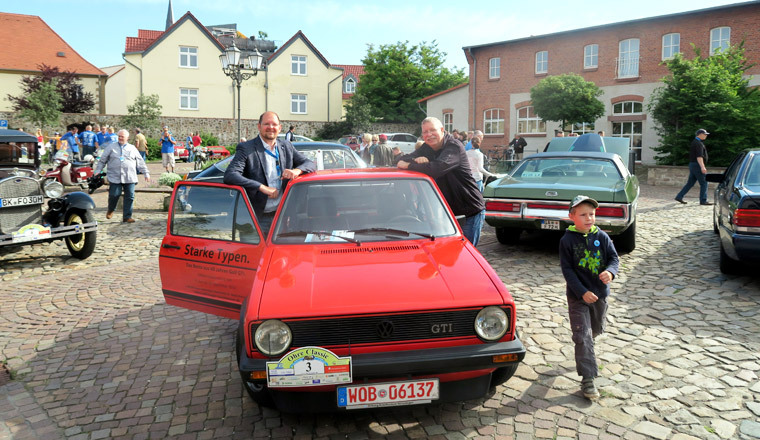 In the article Simon also interviews 'GTI inventors' Anton Konrad and Herbert Schuster, plus former Volkswagen boss Dr. Carl Hahn and former chief designer Hartmut Warkuss. 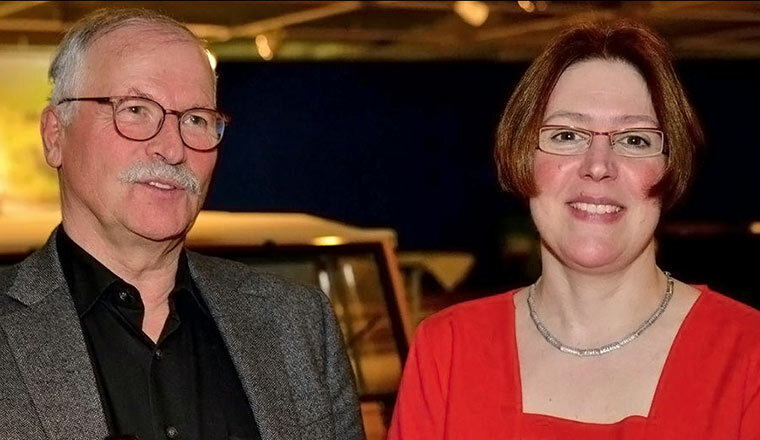 Also well worth a read in this issue is a report on the history of Rometsch, featuring an in-depth look at the Grundmann collection (Hessisch-Oldendorf). Among other stories that we would particularly recommend is a multi-page article on Rolf Stoevesand and his 'Dr. 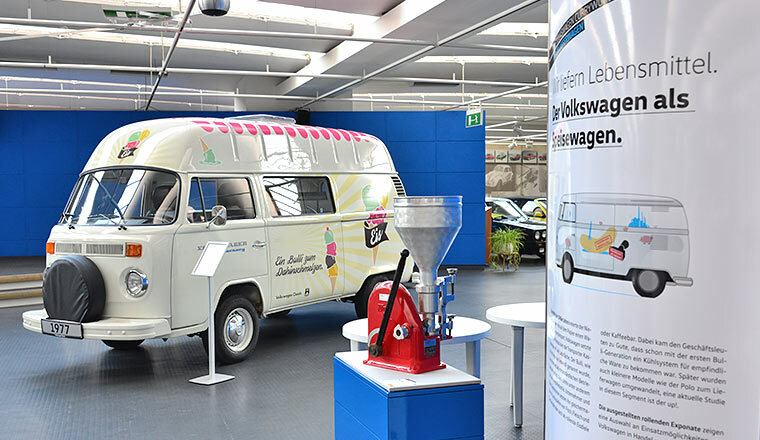 Oetker Housewife Advice' minibus, which can currently be admired in the Volkswagen AutoMuseum. 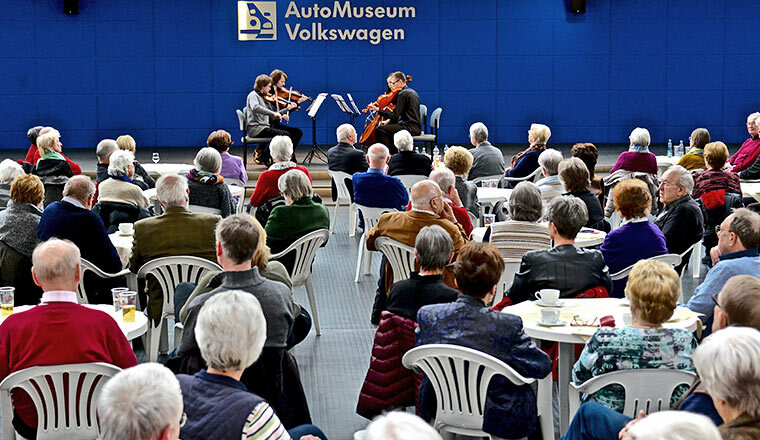 Classic music in the AutoMuseum. 6 March 2016. 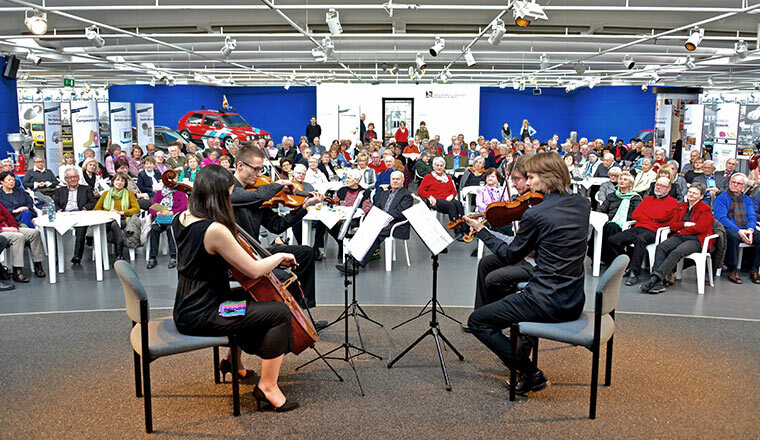 Four young musicians from the Czech Republic (two on violin, one on viola, one on cello) generated a Sunday morning crowd at the AutoMuseum. 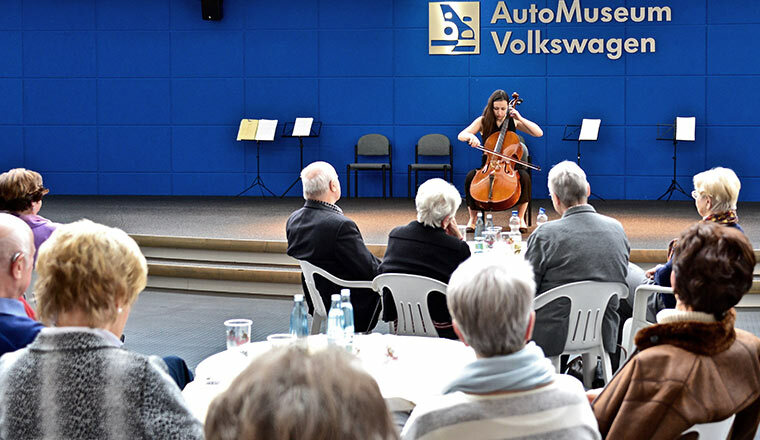 The non-profit organization “Prag live” were performing for the second time in the car collection – and around 200 people turned up, including guests from Eritrea. As well as true classics by Bach, Bizet and Dvorak, the audience was treated to new interpretations of film music and evergreens such as “Summertime” by Gershwin and “Yesterday” by the Beatles. Three encores proved that the young musicians had indeed hit the right note. 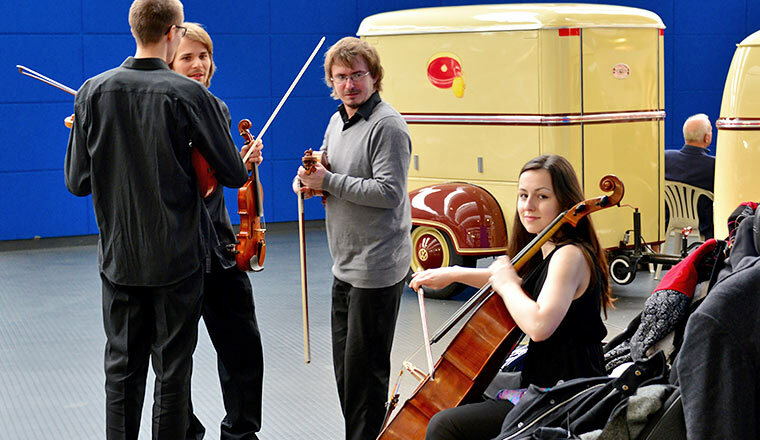 “Prag live” will be back again to provide a cultural highlight at the AutoMuseum by 2017 at the latest. 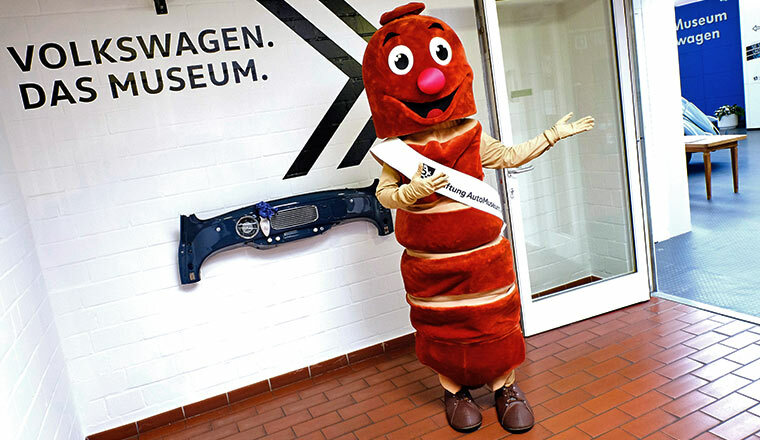 Now also in the AutoMuseum: The Volkswagen Currywurst. 3 March 2016. 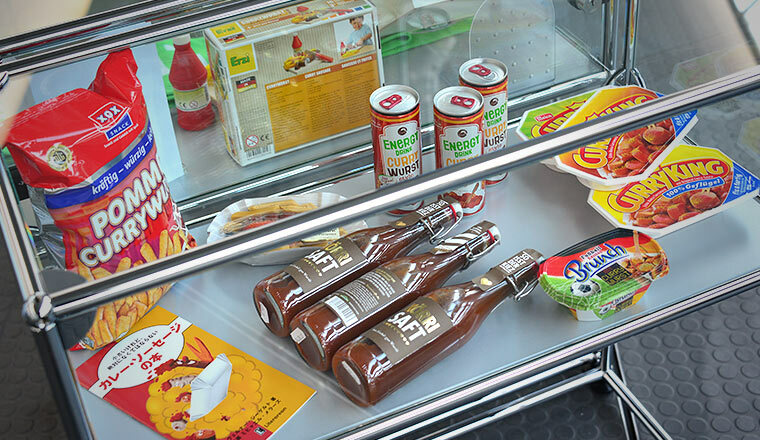 The Volkswagen “Currywurst” curry sausage has found its place in the Volkswagen Auto Museum – and is conquering the hearts of guests at the exhibition of the same name. 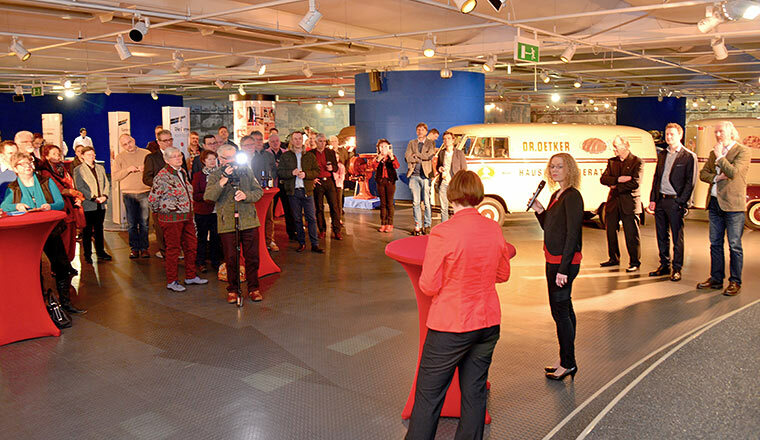 In their informal talk the two curators, Tina Berthold and Susanne Wiersch, fielded the most frequently asked questions on this special exhibition: How did you come to create an exhibition about the VW Currywurst? And: What is there to say about sausages at all? Guests were quite amazed that there was indeed so much to say about this classic and all its artefacts, now popular for over 40 years. Of course, the genuine Volkswagen article was available for tasting that evening. And anyone who is hungry for more can purchase the packaged sausages in the museum shop for the duration of the exhibition. 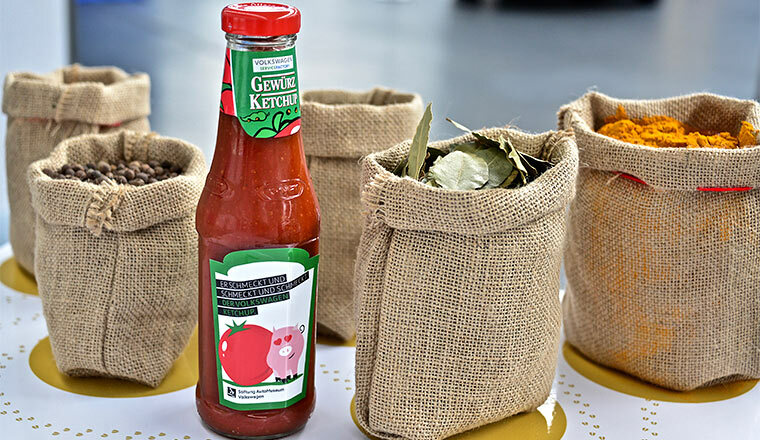 Likewise, the original Volkswagen Ketchup is available in a limited edition with an exclusive special exhibition display label. 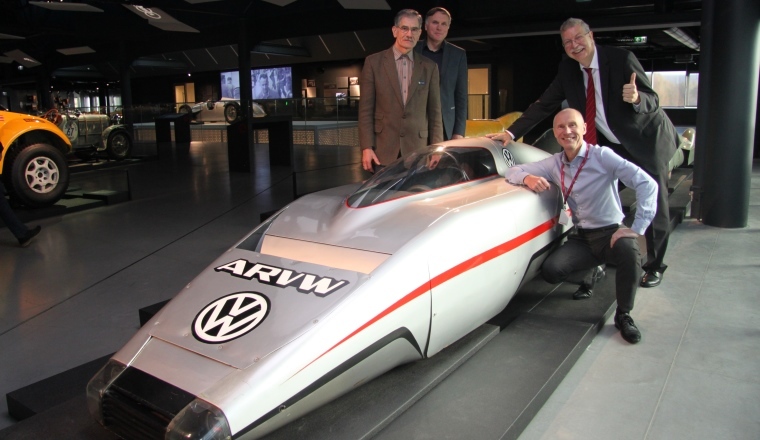 Thanks go to all lenders and sponsors of this special exhibition from the AutoMuseum, and especially to Martin F. Cordes and his corporate catering team at Volkswagen in Wolfsburg as well as the staff of the Deutsches Currywurst Museum in Berlin. 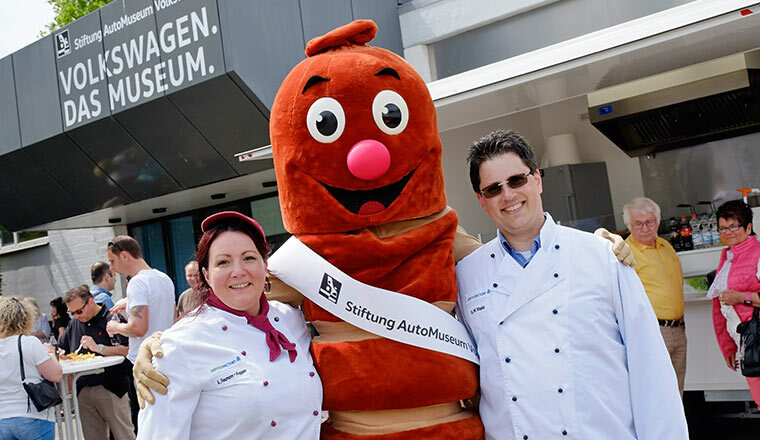 A final tip: the iconic sausage can be tasted in the AutoMuseum itself at International Museum Day on 22 May 2016. 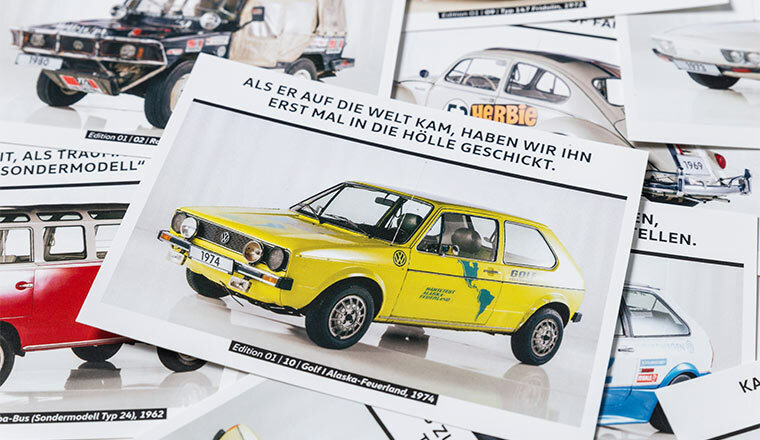 New postcard edition with AutoMuseum cult classics. 29 February 2016. 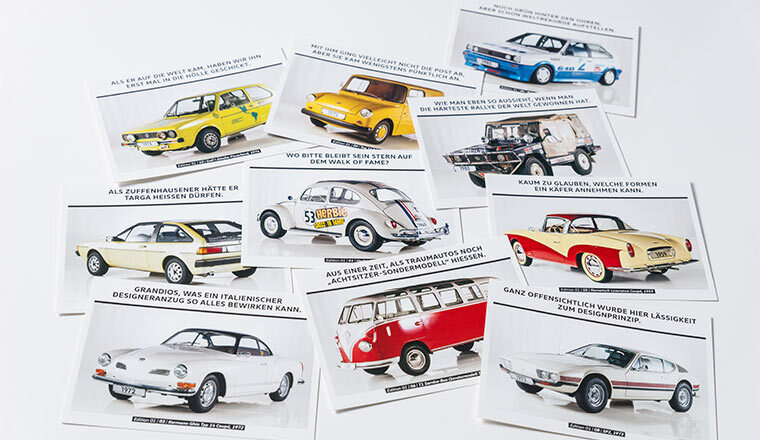 The redesign of the shop range at the AutoMuseum begins with a brand new postcard edition. The most requested (and most photographed) exhibits will be presented in ten high quality colour cards – each with a snappy slogan, some factual information and the most important technical data. 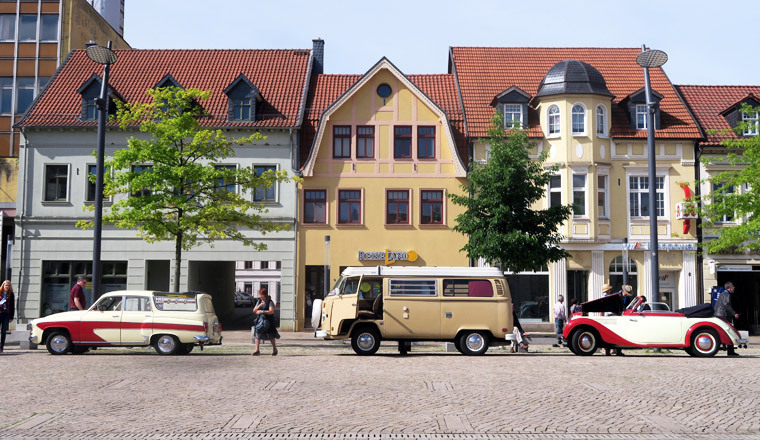 Among the cult classics for example are Herbie, Fridolin and the Samba bus. 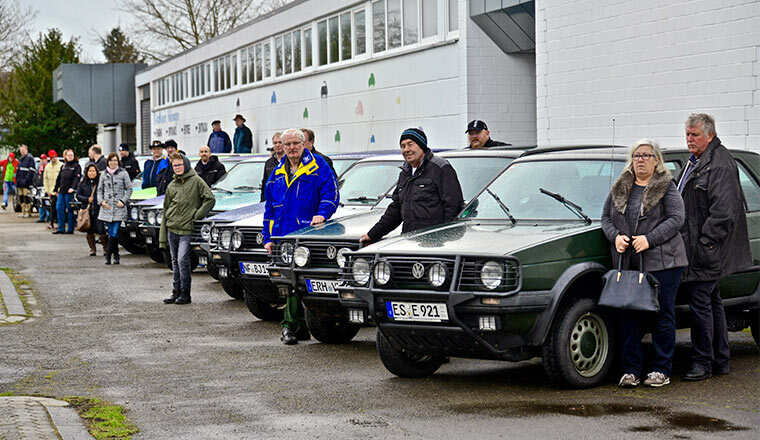 “Still wet behind the ears, but already setting world records”, were the words said about the record-breaking Polo G40, which once proved the reliability of supercharged engines at Ehra-Lessien. The cards in the museum shop cost as little as 50 cents each – they can also be sent to you on request if prepaid. 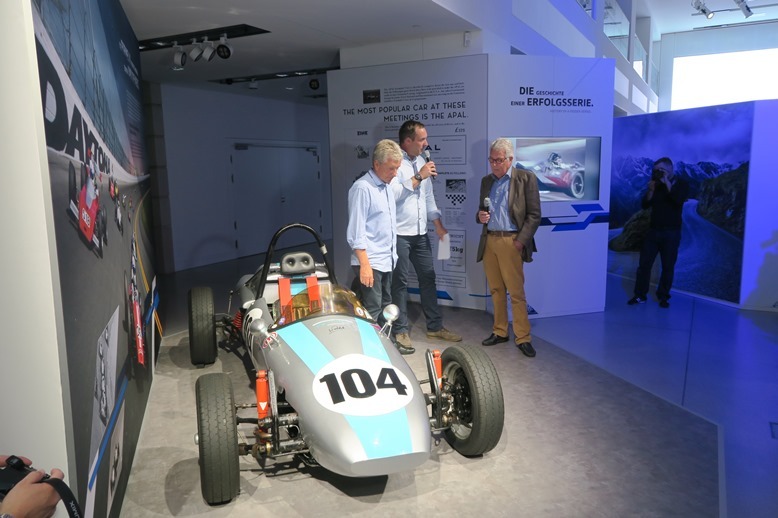 Racing Polo GT enriches permanent exhibition. 15 February 2016. 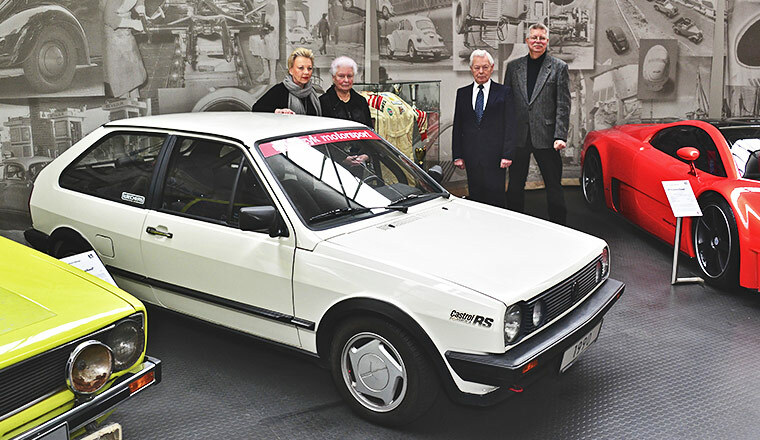 The Volkswagen AutoMuseum has gained a new attraction: a 1990 racing Polo Coupé GT. 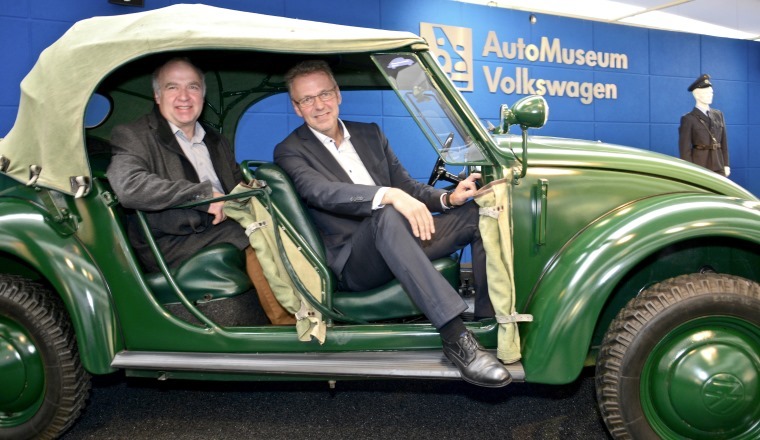 It was the final wish of Detlef Kaminski, who passed away last year, that his car should find a new home in the Volkswagen AutoMuseum. 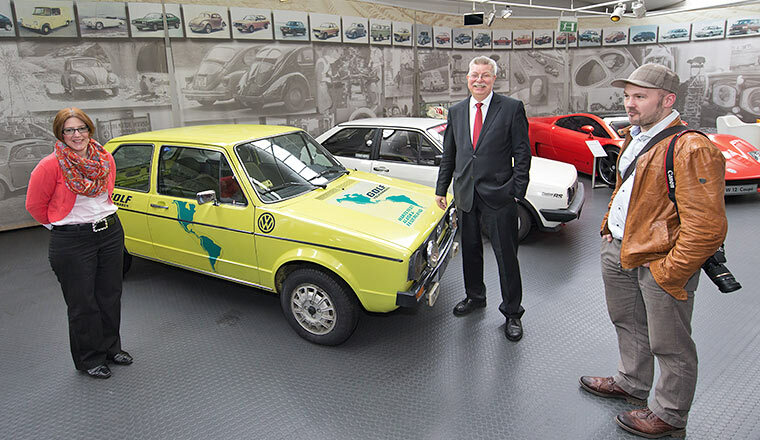 His parents, Helga and Georg Kaminski, saw to it that this wish was granted and today officially handed the Polo over to Eberhard Kittler, director of the Volkswagen AutoMuseum Foundation. 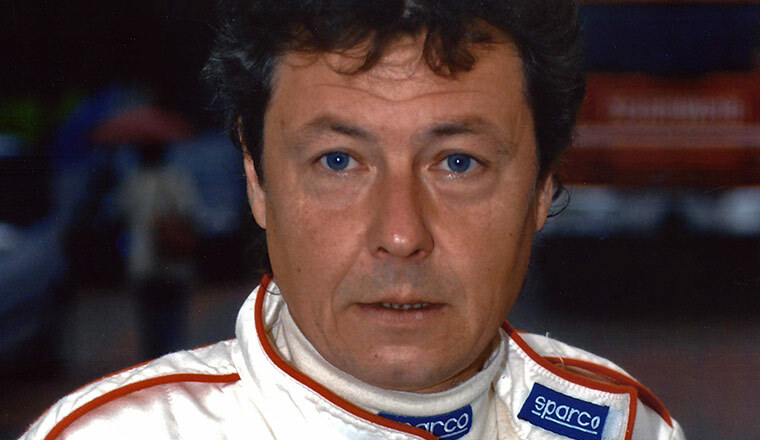 Kaminski was an active amateur racing driver. 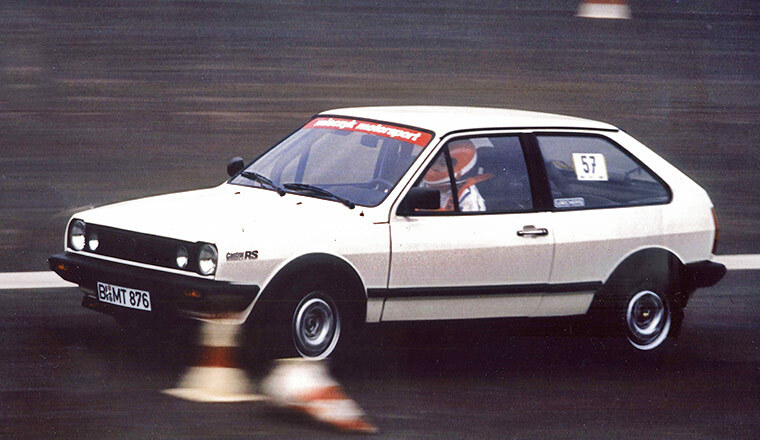 He began in Lower Saxony autocross and later switched to hill racing. Hauenstein was one of his favourite courses. For ten years, he was accompanied to every race by his partner Martina Brindöpke. Kaminski owned a total of six Polos, which he had slightly modified for racing use by Misczyk. However, he was particularly fond of his snow-white racing Polo GT – because it was the only one that he ordered to his own specifications. This vehicle, his helmet, racing overall and several of his countless trophies are now part of the AutoMuseum's permanent exhibition. Visit from the Lower Rhine. 30 January 2016. 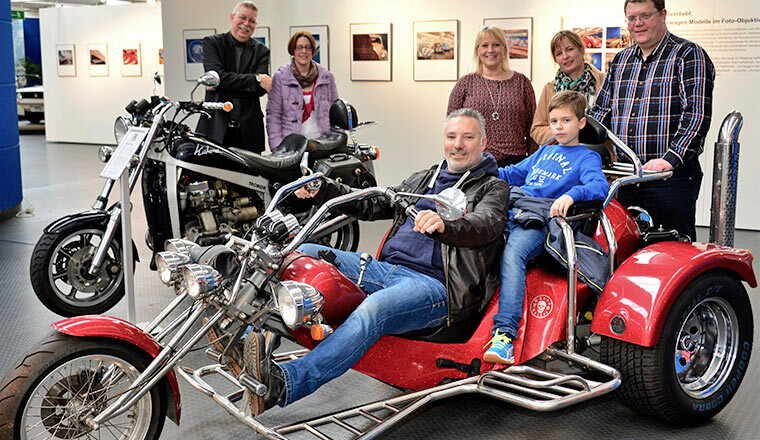 At almost the same time as the Country enthusiasts, Andreas Scholz paid a visit to the museum along with family and friends. He had kindly provided his trike with an old Beetle motor for the special 'River Deep – Mountain High. 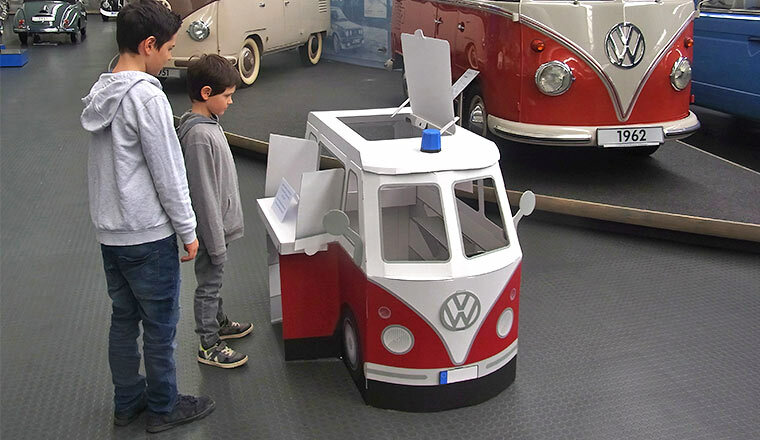 Fun cars from Volkswagen' exhibition. "Around Christmas we had such lovely weather - otherwise I'd have probably taken it out for a ride," laughed the man from the Lower Rhine, where, as everyone knows, the sun almost always shines. Golf fan Dirk Pauls had put him in touch with the museum. Together with Eberhard Kittler the visitors took a look at a few early experimental motors, which the museum has not yet been able to put on show. Country Fans in the Museum. 30 January 2016. 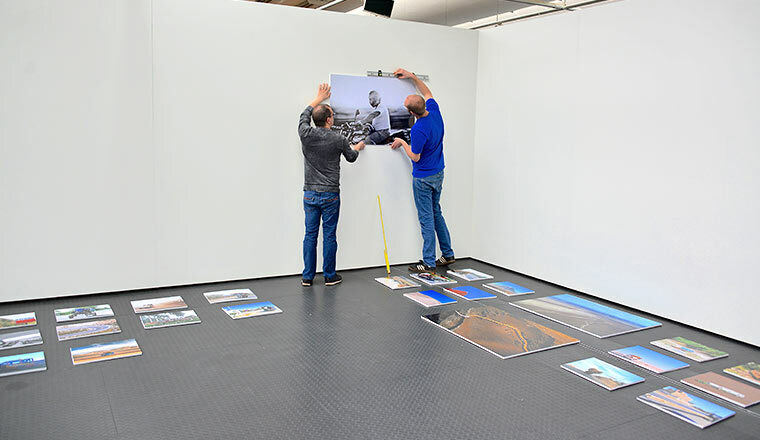 Tying in well with the special exhibition called 'River Deep – Mountain High. 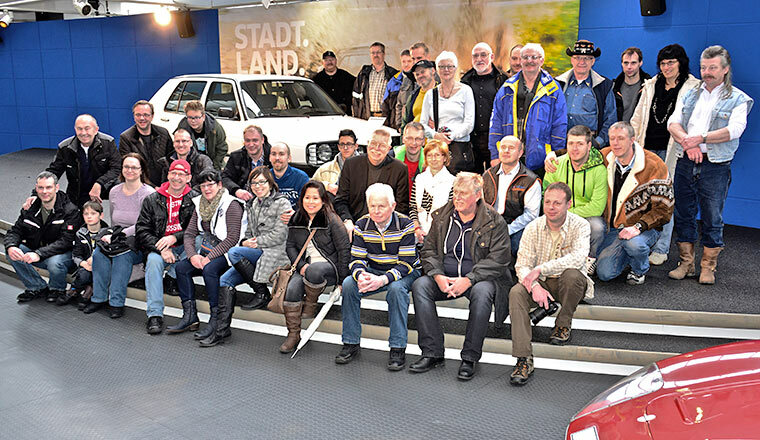 Fun cars from Volkswagen', around 40 fans of the Golf Country visited the AutoMuseum Volkswagen with their vehicles. The longest journey there was made by a Country enthusiast from Hungary, who owns every version of the cult forerunner of the SUV. 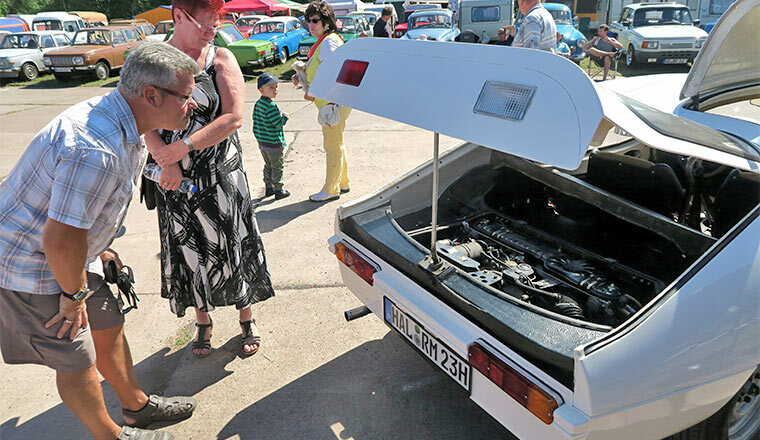 What brought them all together was the winter meet of the fan community of this classic car. They set off together in convoy from Wernigerode, the rainy conditions not bothering their all-rounders at all. 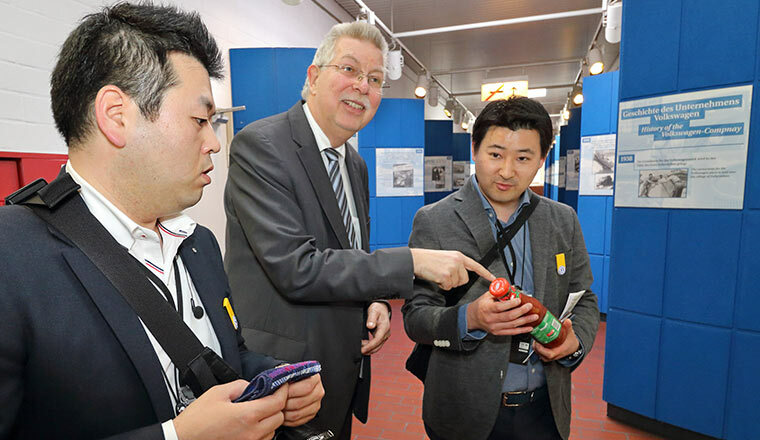 In the museum, Eberhard Kittler rewarded them with a knowledgeable and informal guided tour of the brand's product history. And, of course, there had to be a group photo next to the Country. 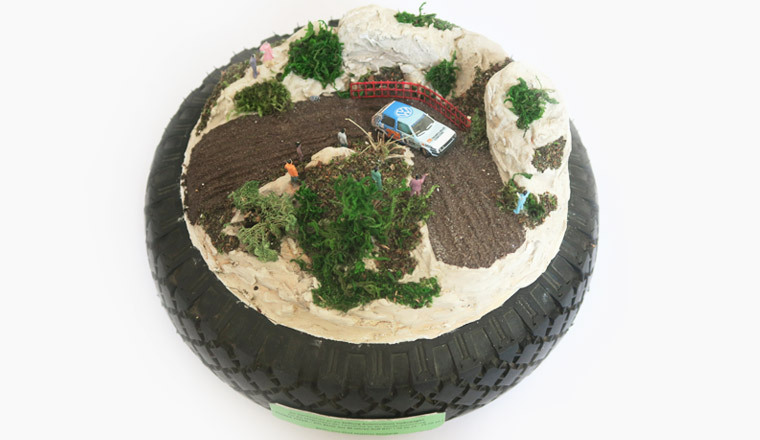 It forms the centre point of the exhibition, having just celebrated its 25th anniversary. Back then not so popular with customers, today it is a sought-after rarity. 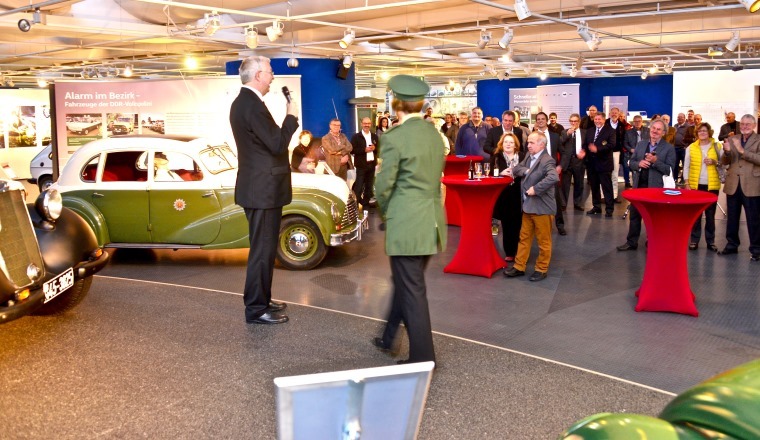 Volkswagen AutoMuseum puts on 2016 New Year's reception. 19 January 2016. 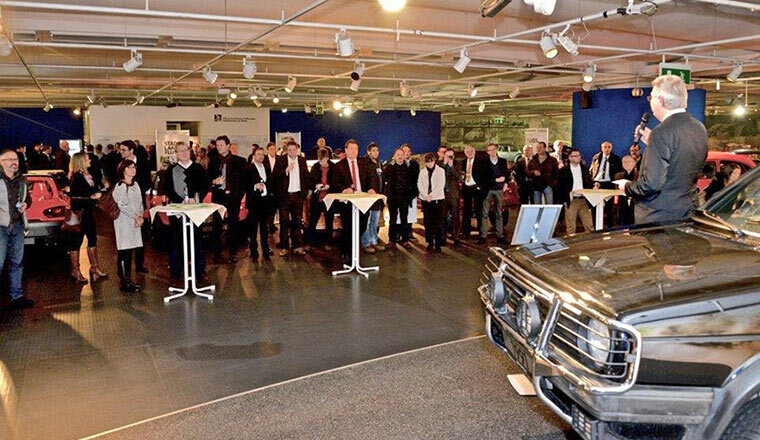 Once again this year, the Volkswagen AutoMuseum invited friends and backers of the museum to its traditional New Year's reception. 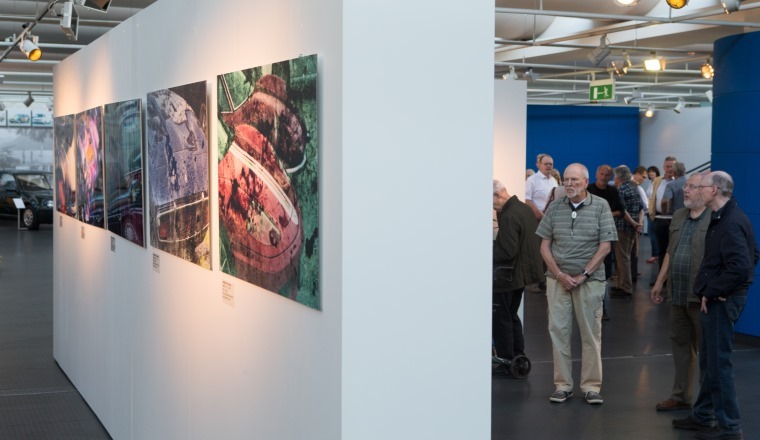 Director Eberhard Kittler and his team were able to look back on a very successful 2015 – featuring four special exhibitions, a new art exhibition series and the revival of cultural events. 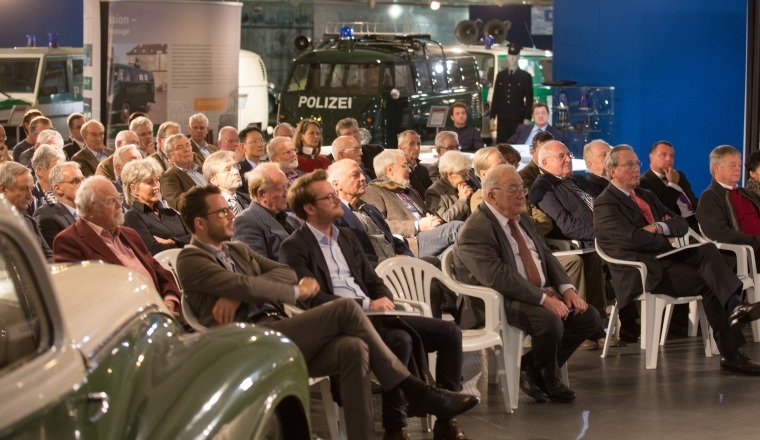 All of this has, of course, only been possible thanks to many supporters of the AutoMuseum providing considerable help once again in 2015 with loans and their own hard work. Several backers have already signalled their support for the new year just begun, meaning that visitors can look forward to further attractions over the coming months. A special word of thanks went at the event to Professor Hahn, the man responsible for the museum's foundation. 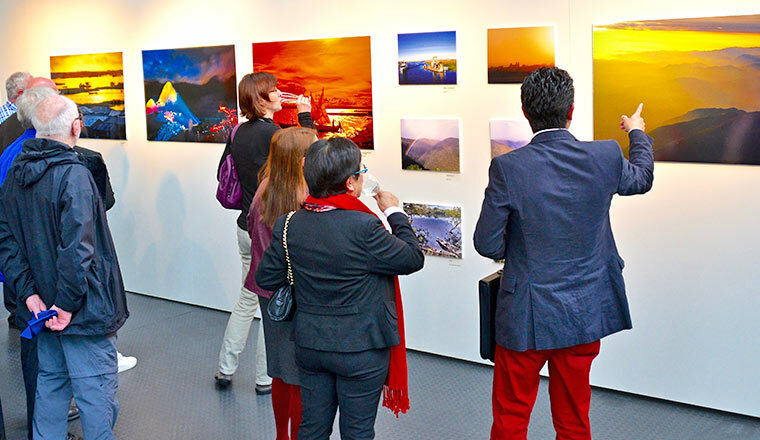 First 'MobilArt' photo exhibition opened. 14 January 2016. 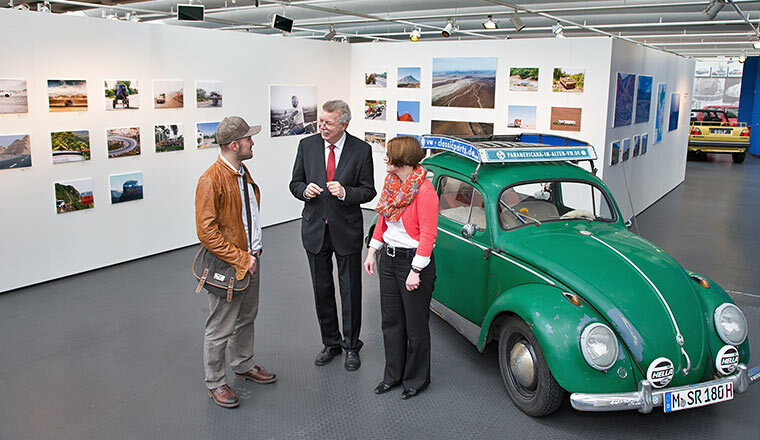 In front of around 60 expert guests, the new photo exhibition entitled 'With a love of detail: Volkswagen models seen through a photo lens' was opened today. 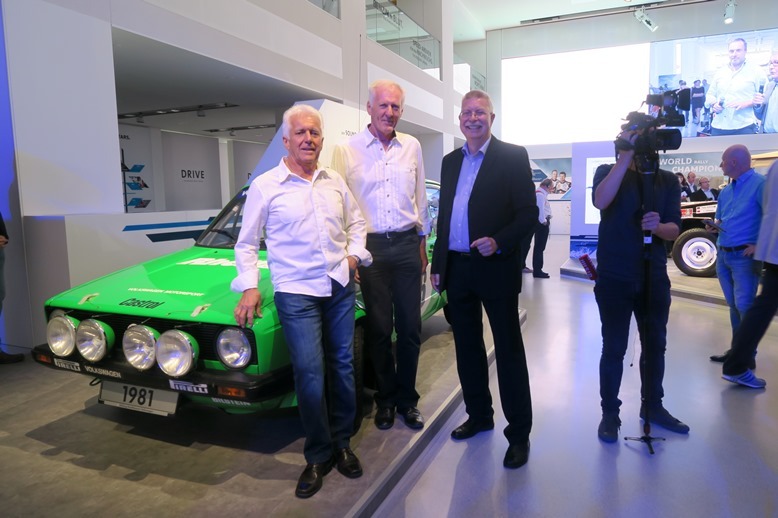 Eberhard Kittler and Peter Riewald expressed their delight at this cooperation between the Volkswagen AutoMuseum Foundation and the 'fotoclub Wolfsburg'. 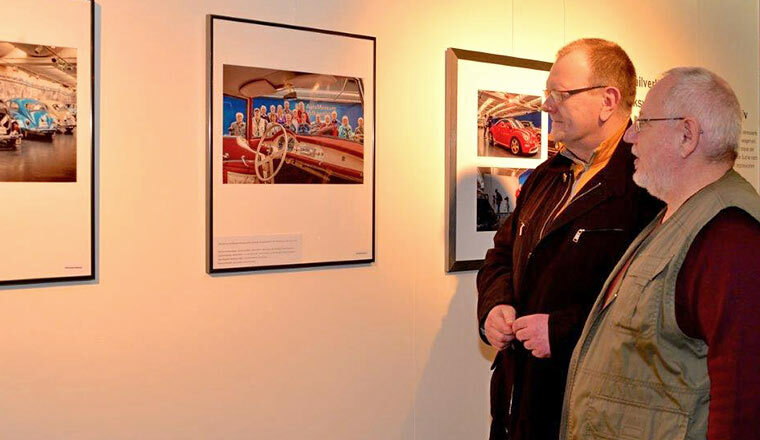 The 36 selected photographs are being exhibited at the very scene of their creation, for they resulted from a workshop that the fotoclub ran at the AutoMuseum two years ago. 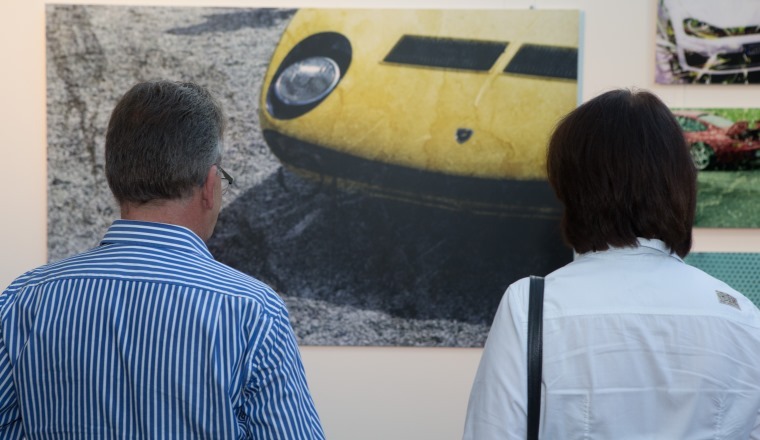 The pictures on show form the second exhibition in the 'MobilArt. 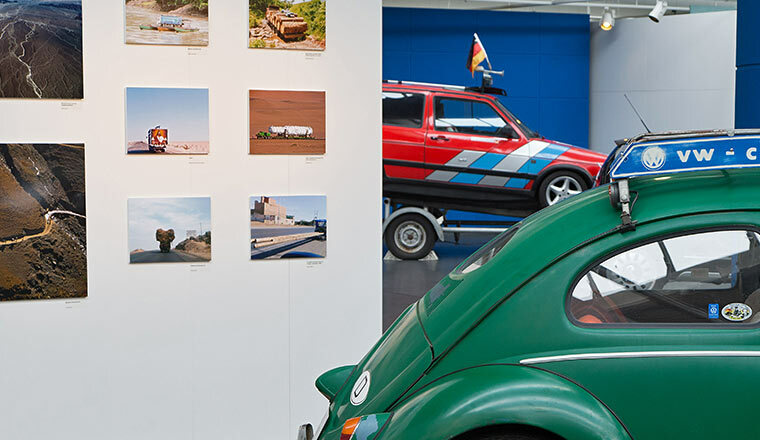 Art in the Volkswagen AutoMuseum' series. 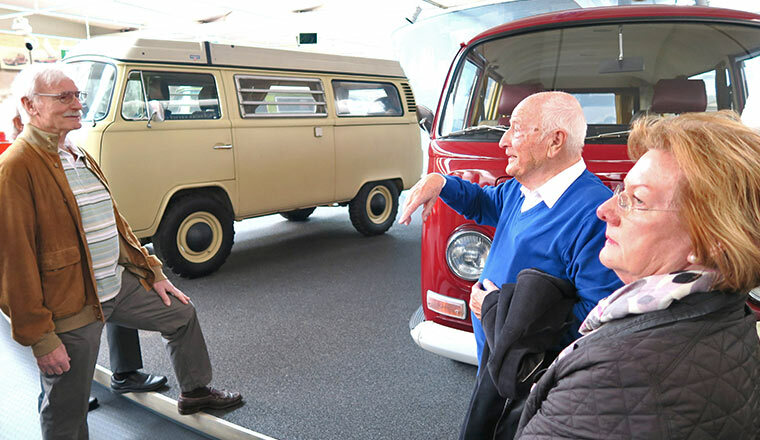 Among those present at the opening were the so-called Bulliboys, a group of VW pensioners, who play an active voluntary part in matters VW Bulli. Riewaldt is one of them.